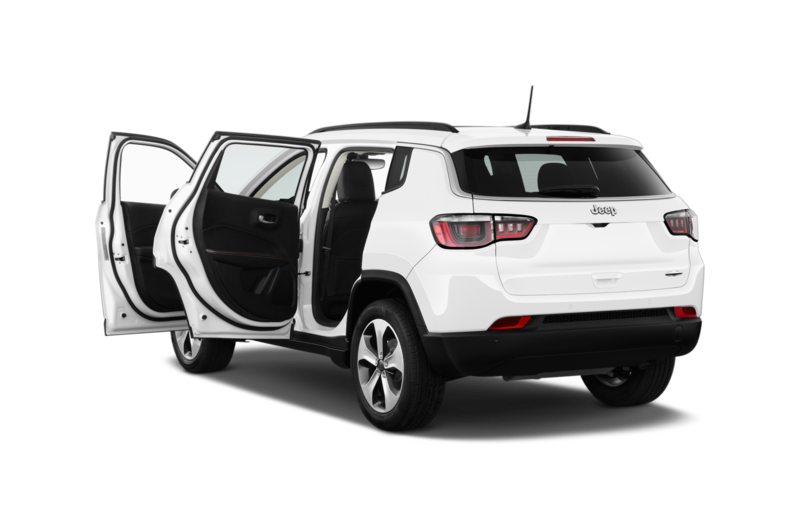 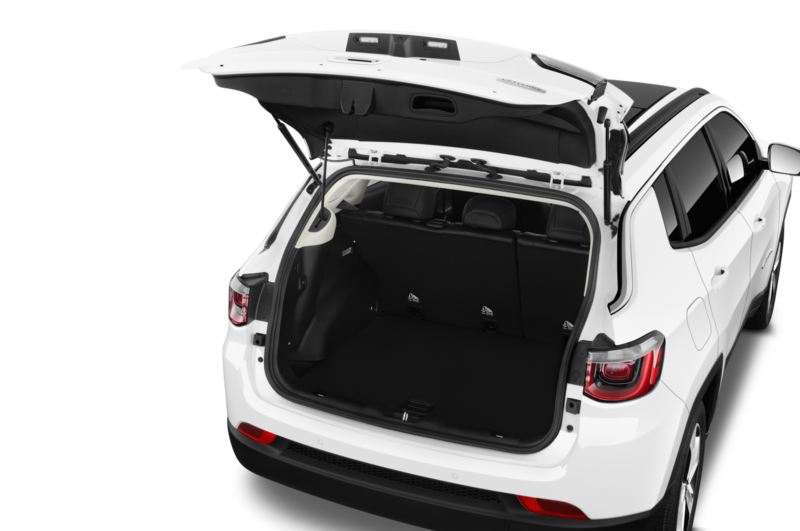 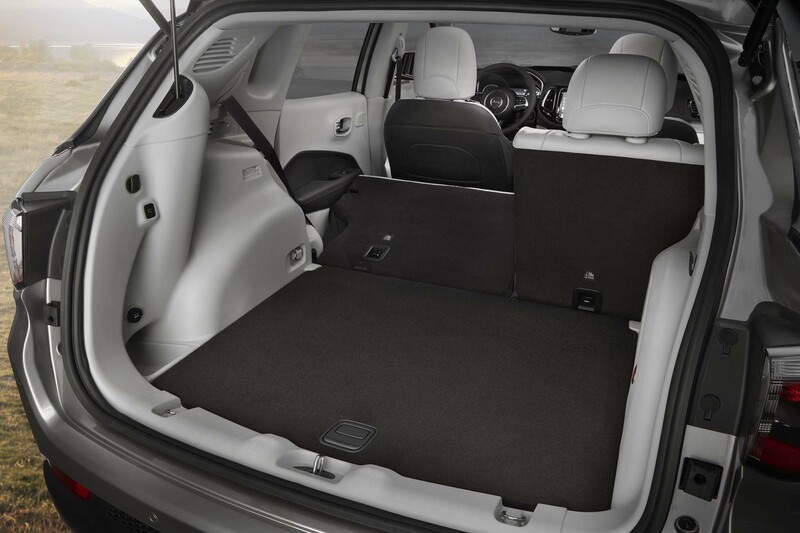 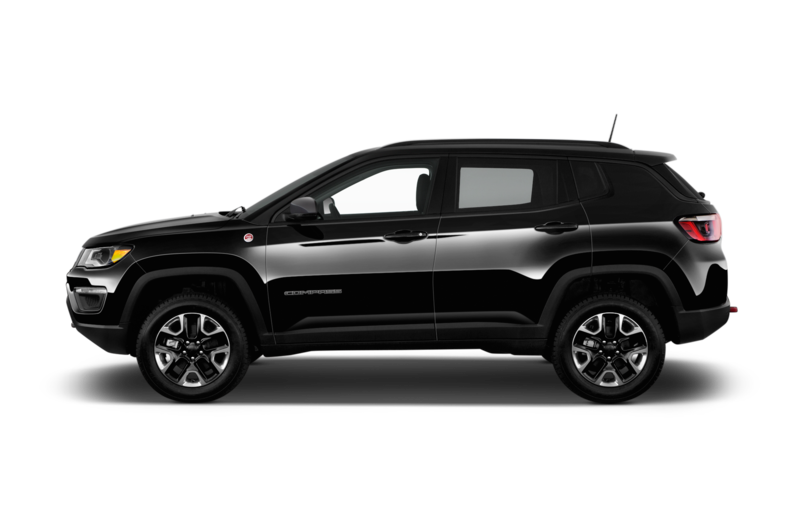 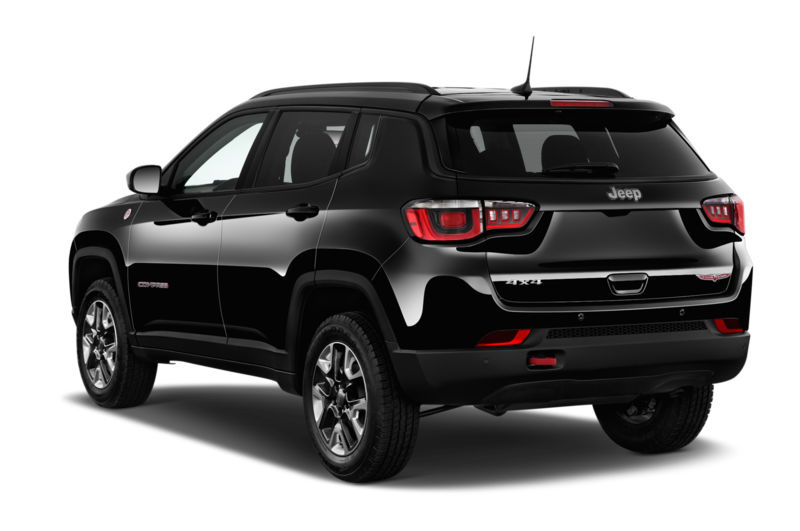 Although it’s based on the same Fiat Chrysler Small Wide 4×4 Architecture that underpins the Jeep Renegade, Fiat 500X, and Fiat 500L, the new 2017 Jeep Compass is slightly larger than its brethren, competing more with Honda’s CRV, Toyota’s RAV4, Ford’s Escape, and Hyundai’s Santa Fe. 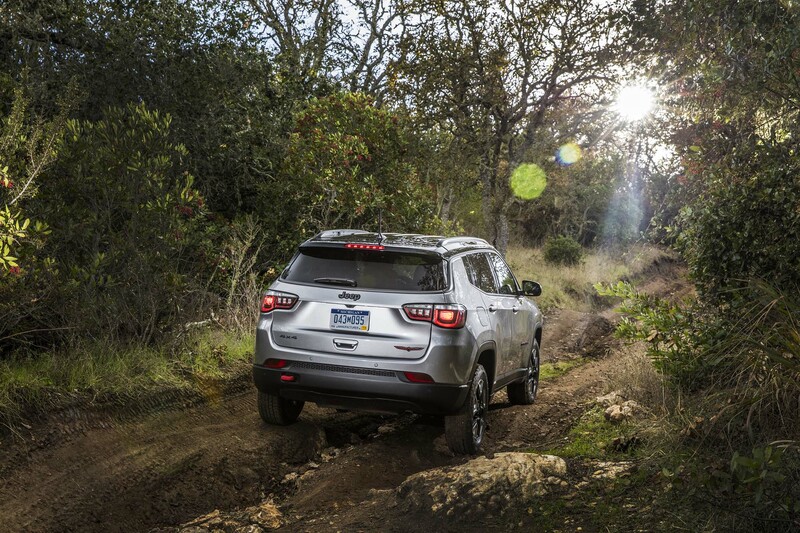 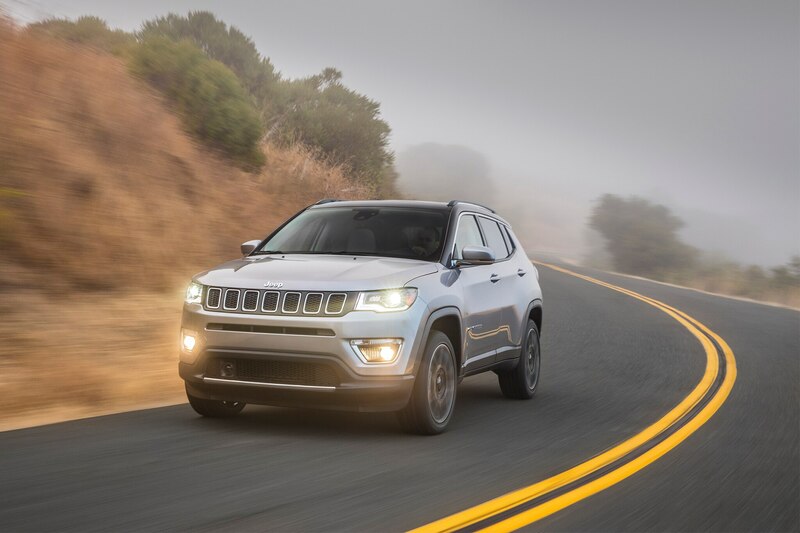 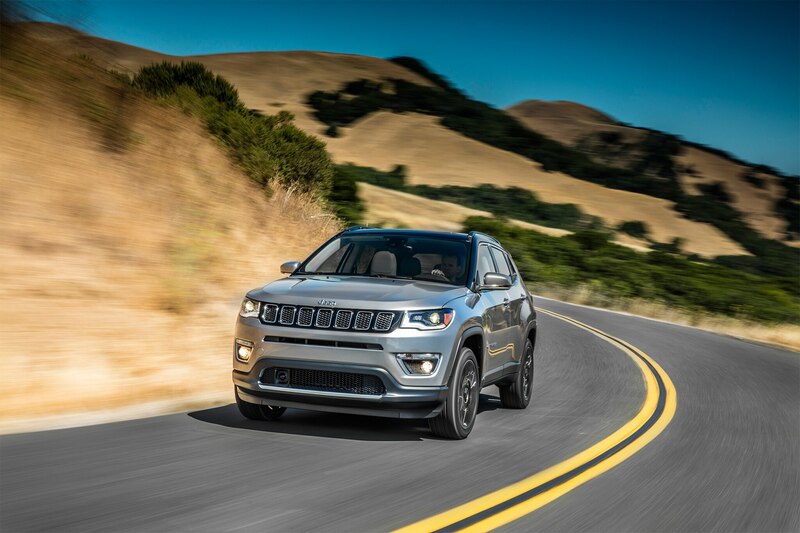 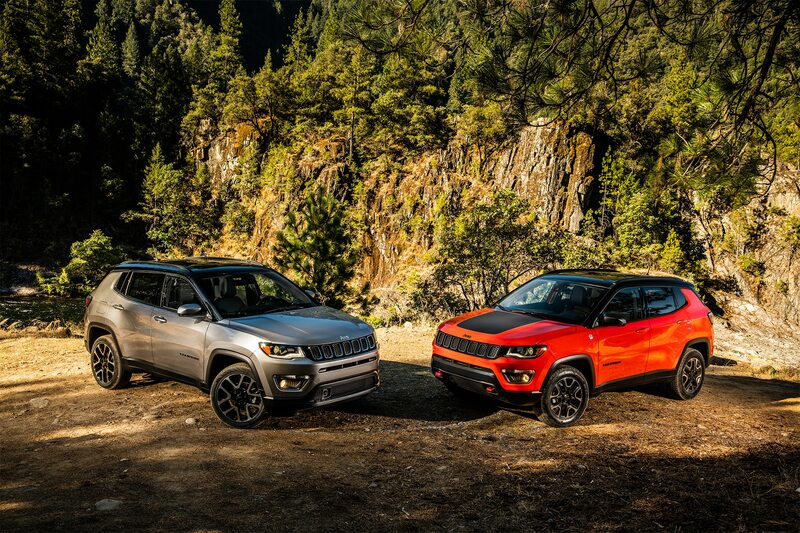 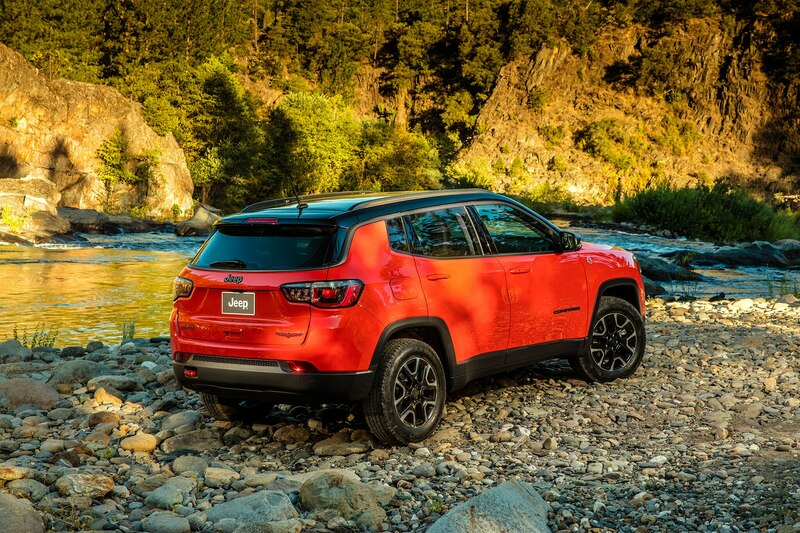 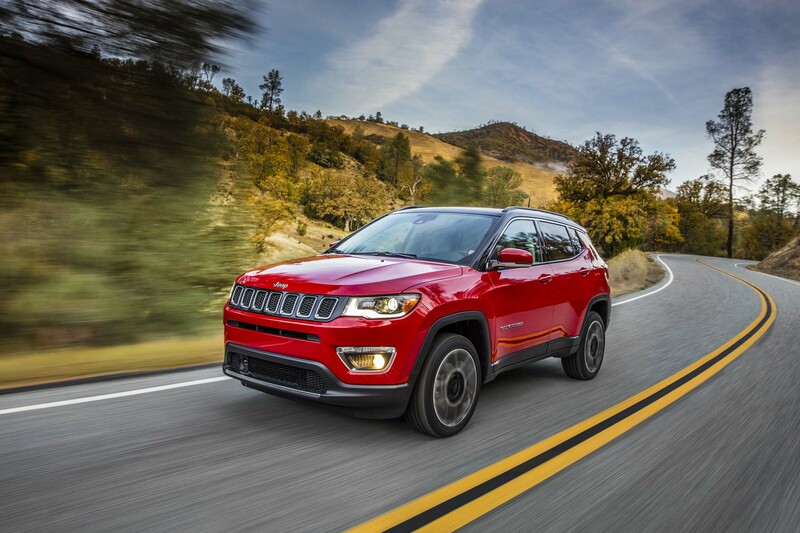 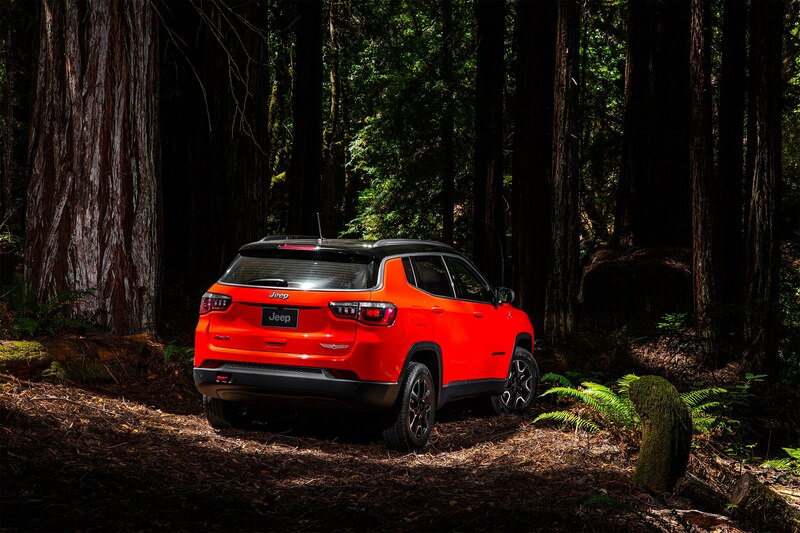 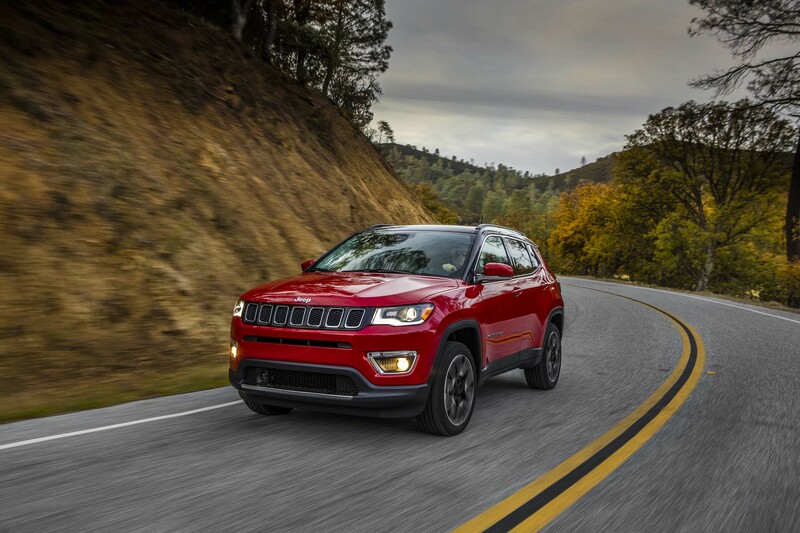 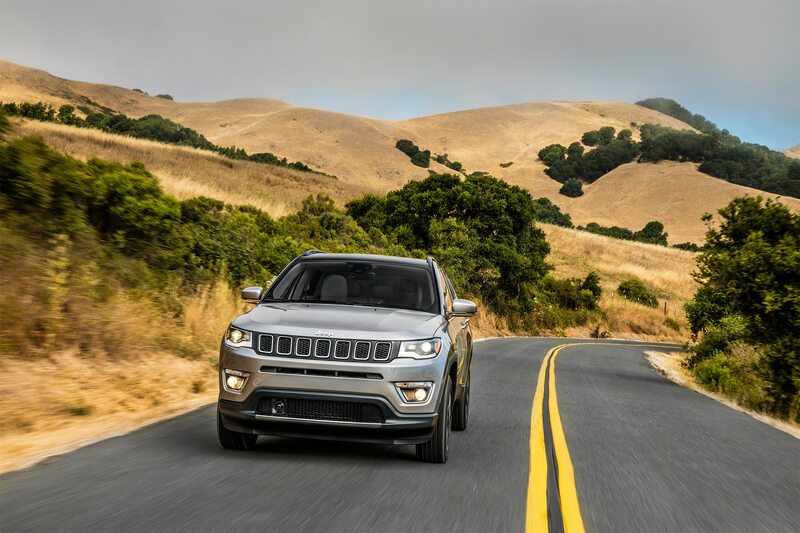 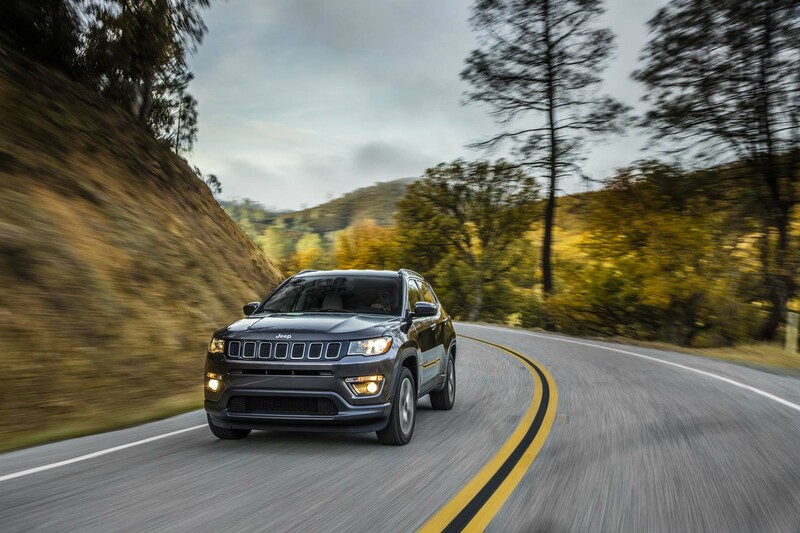 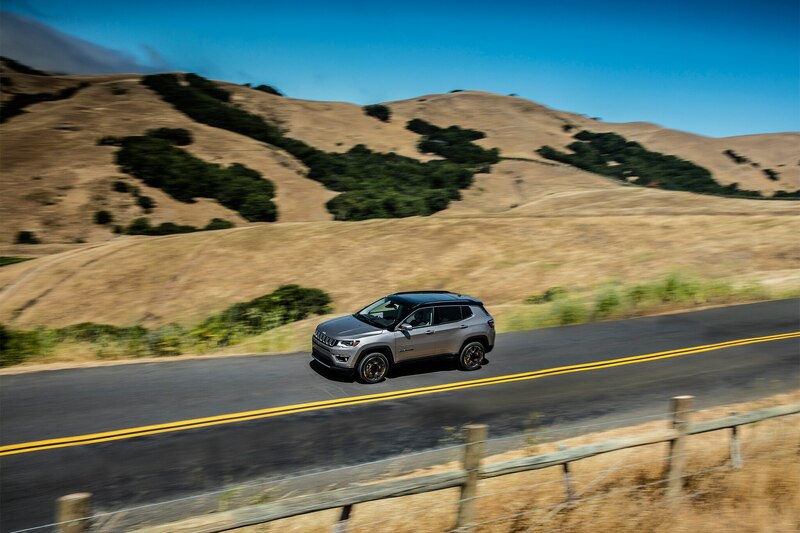 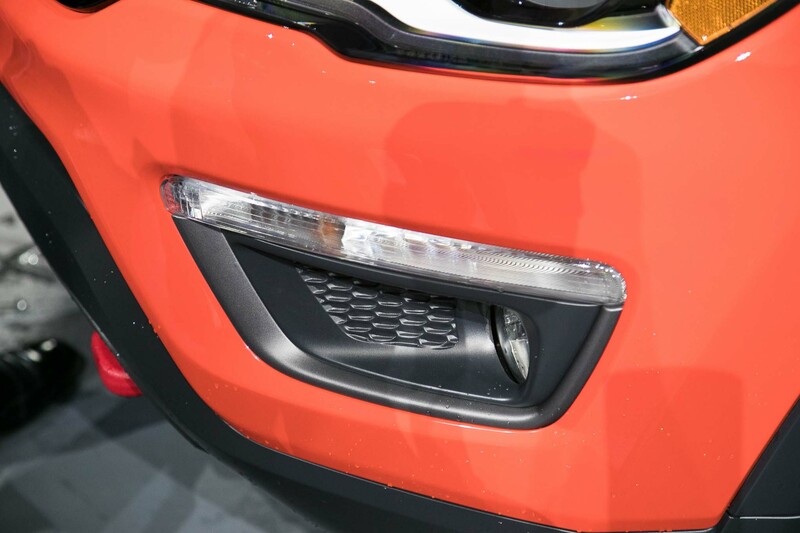 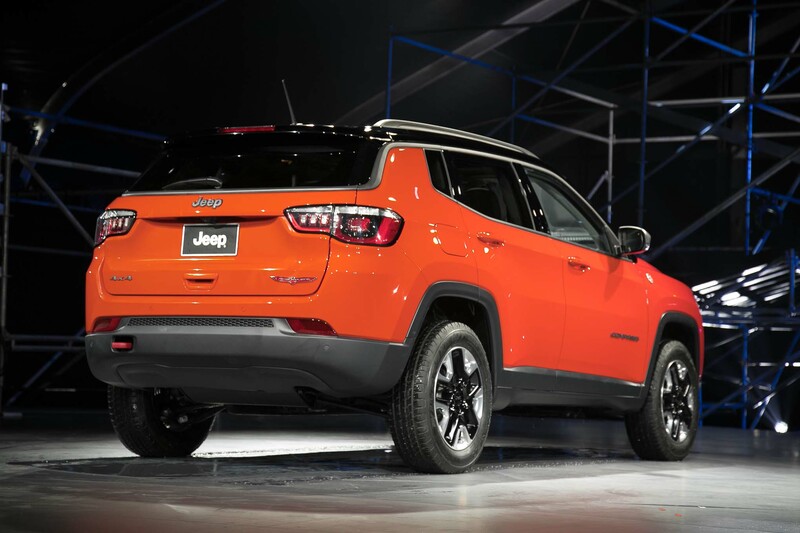 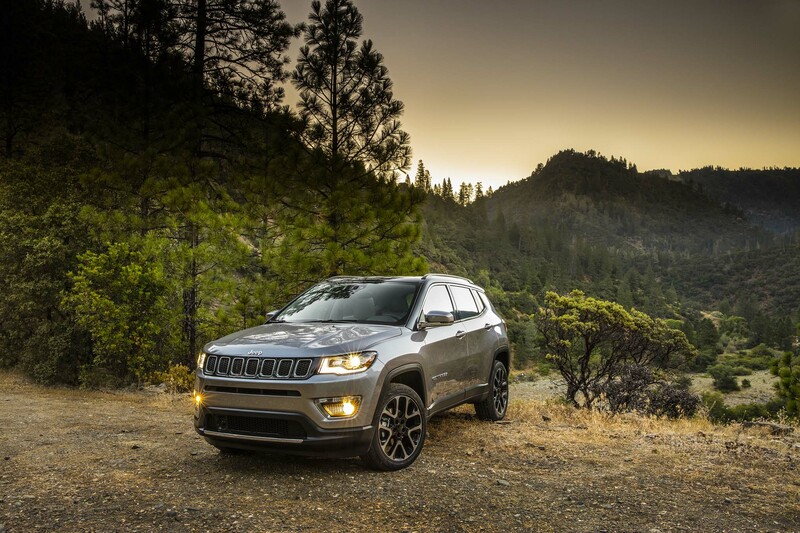 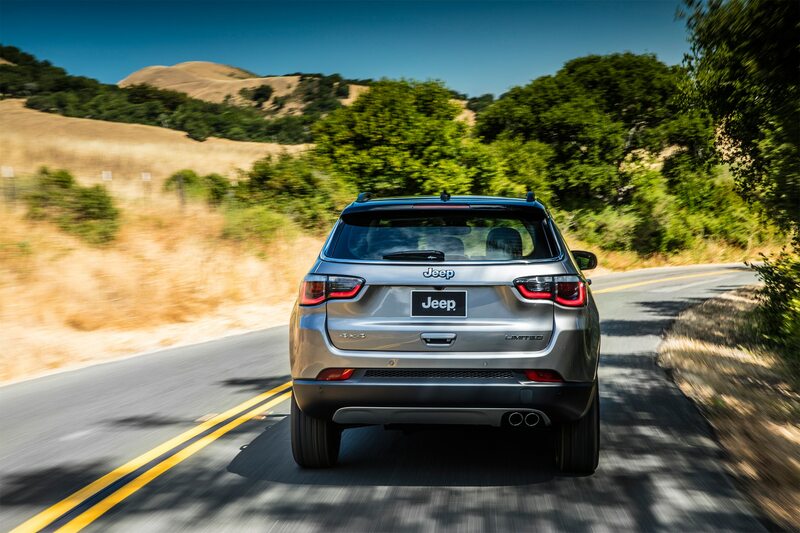 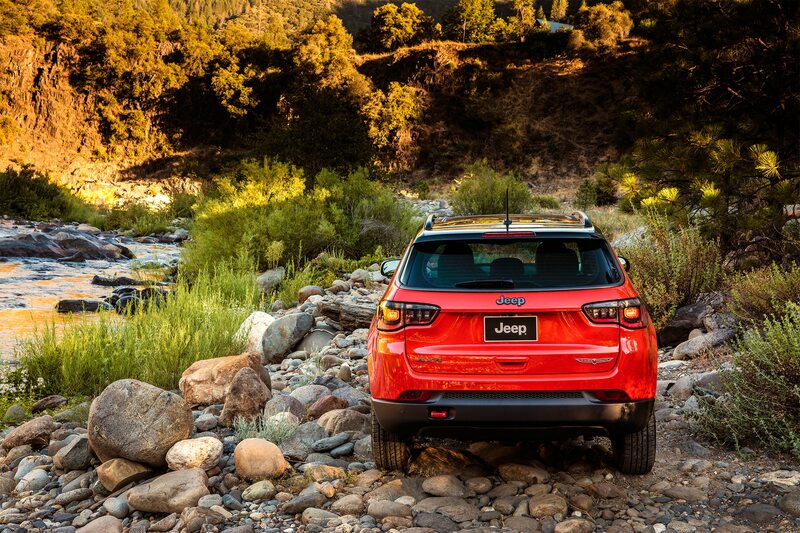 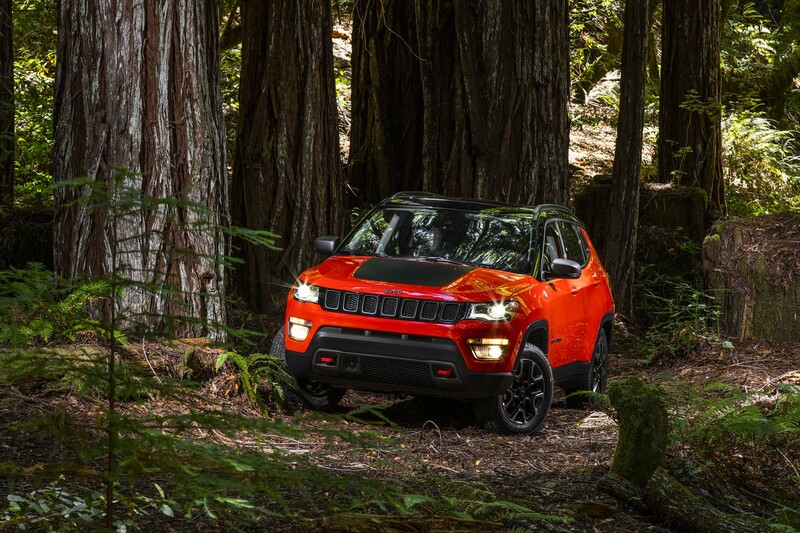 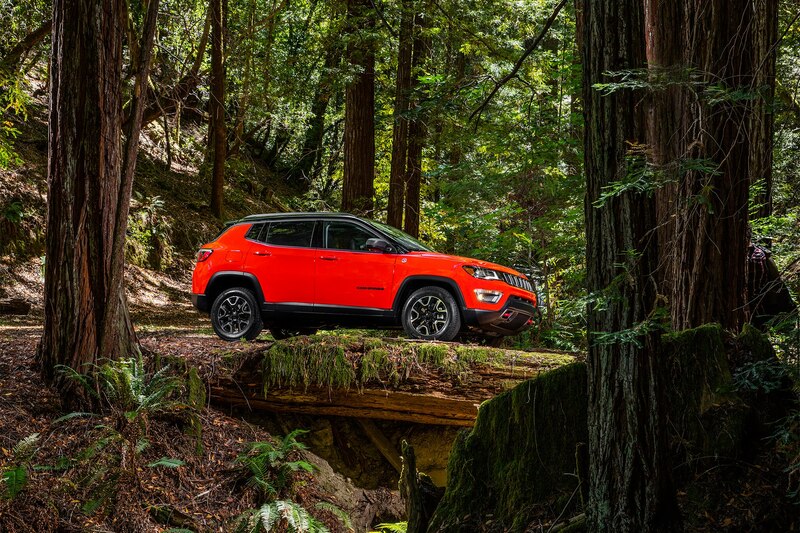 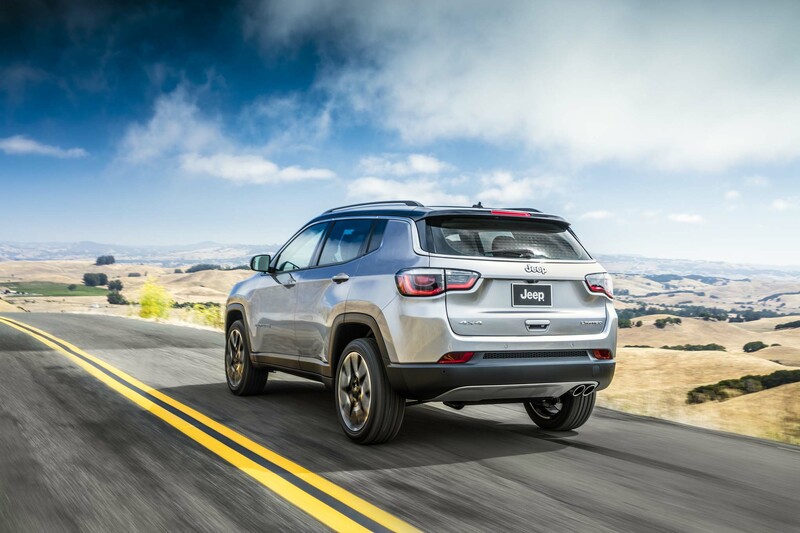 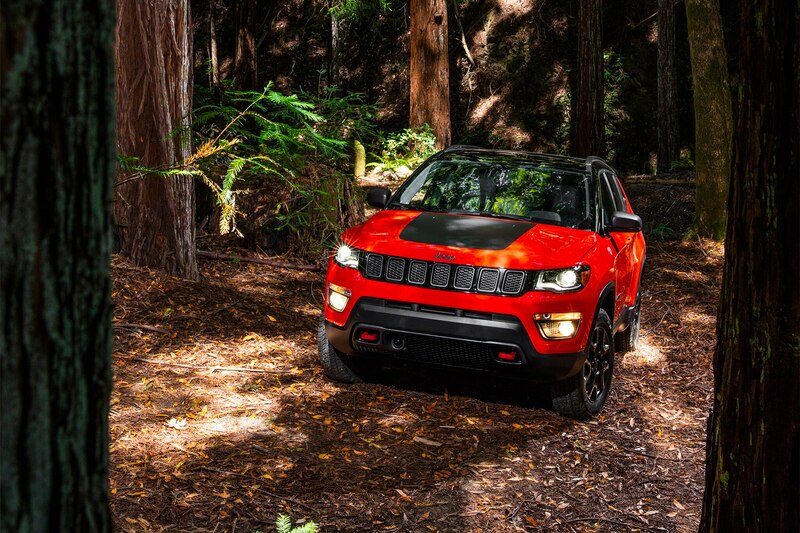 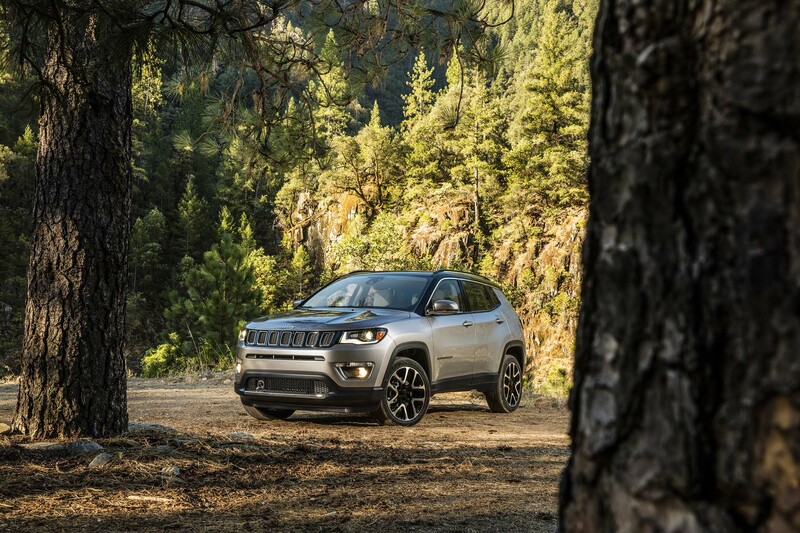 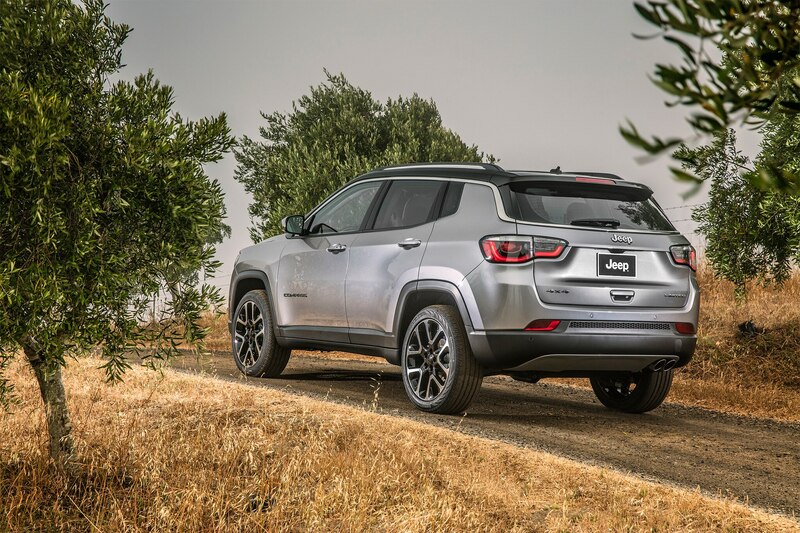 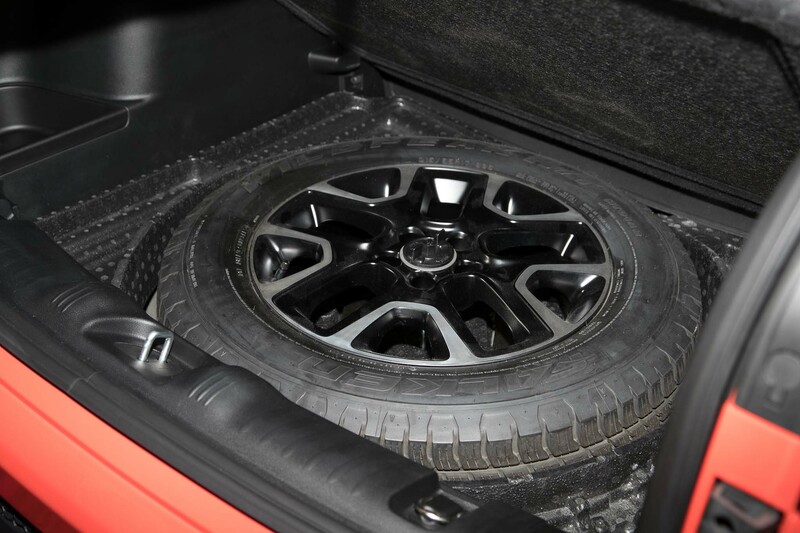 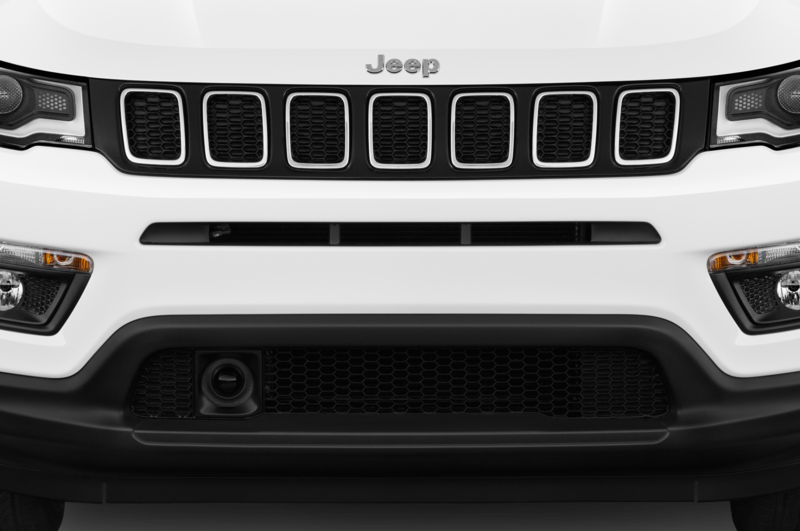 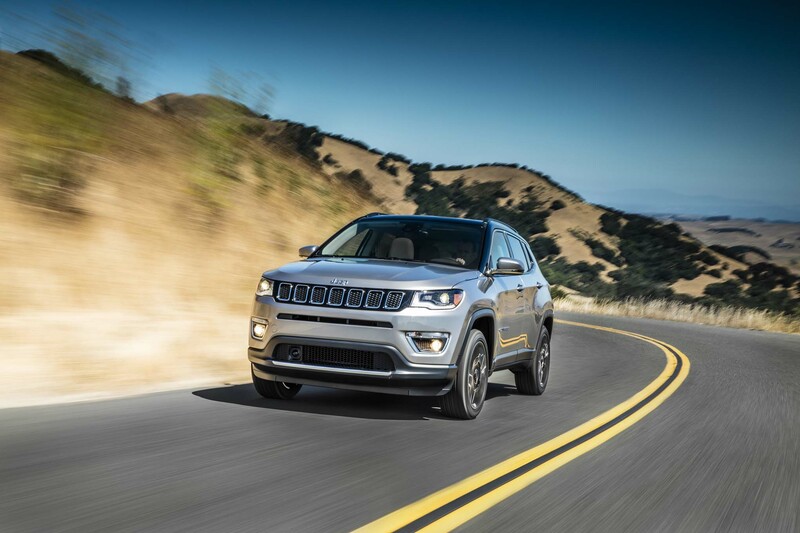 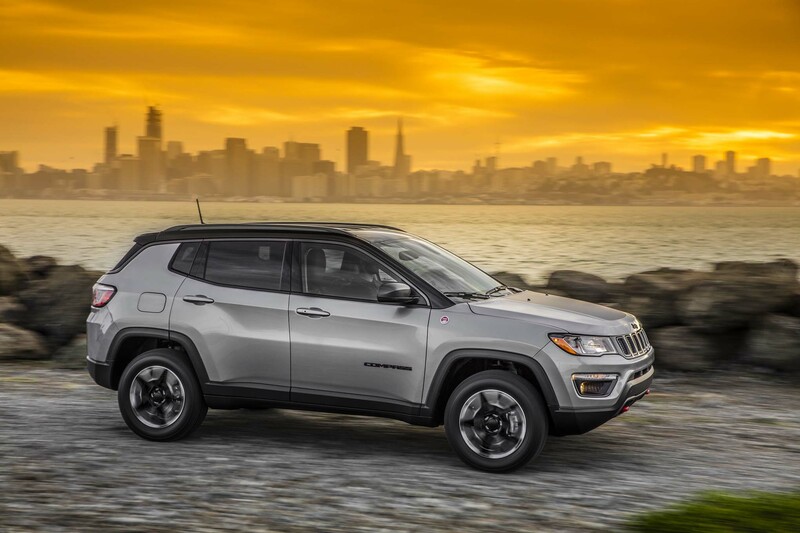 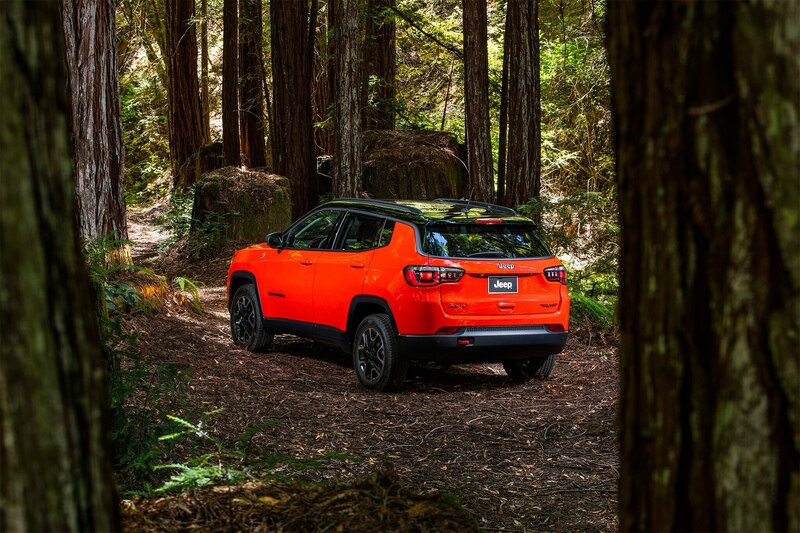 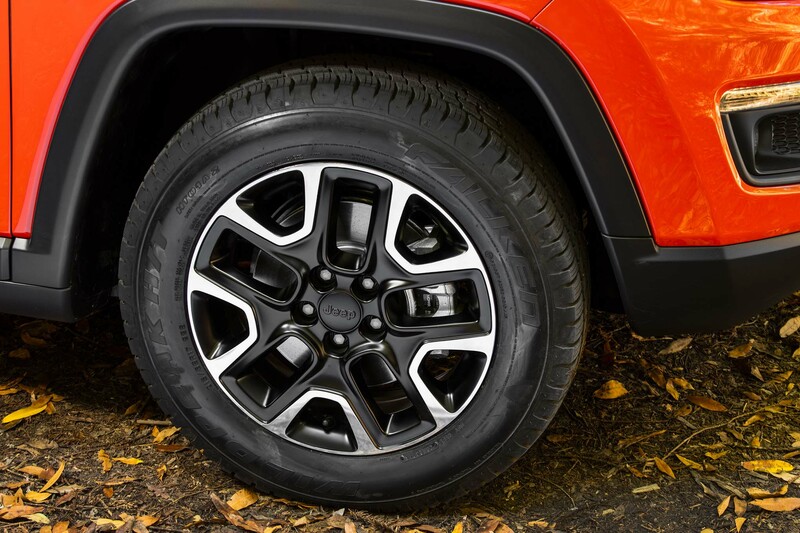 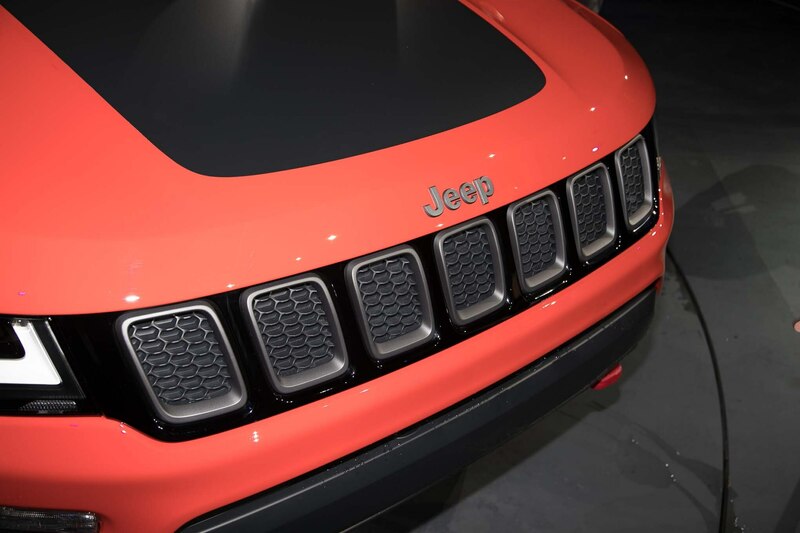 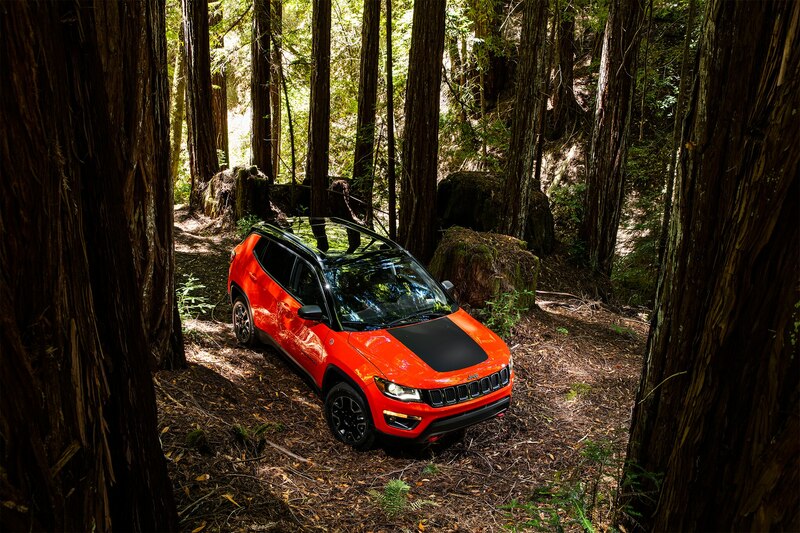 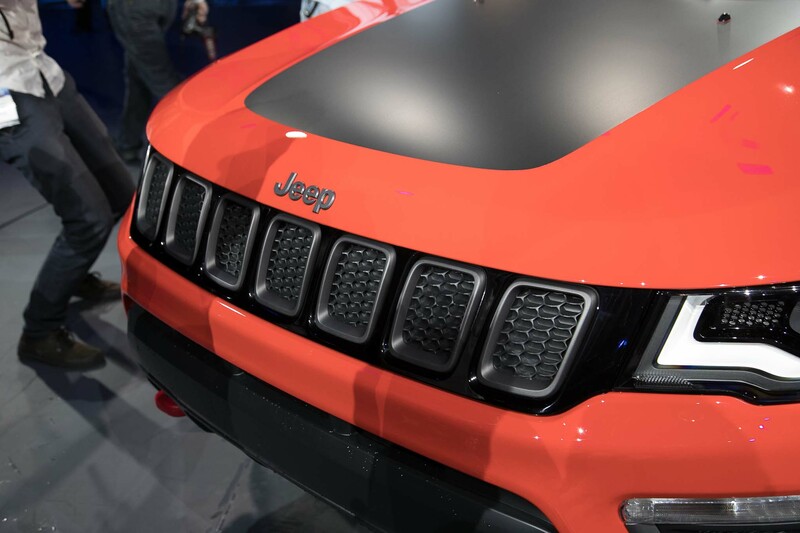 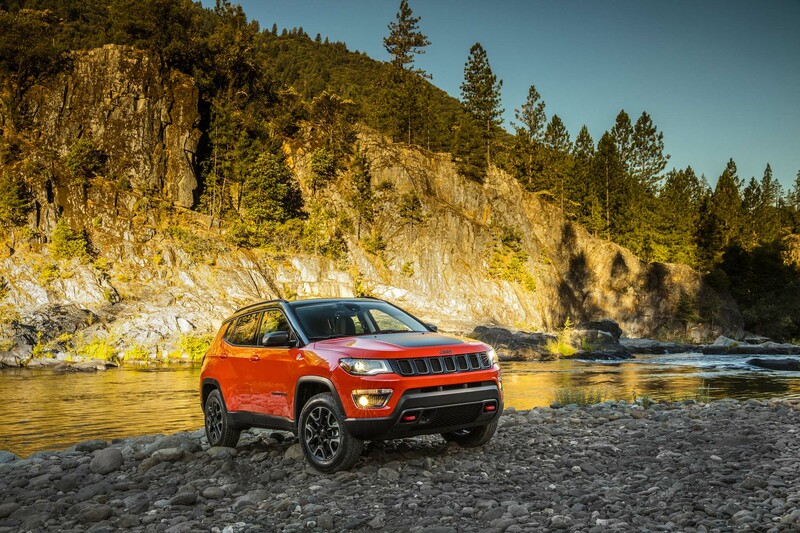 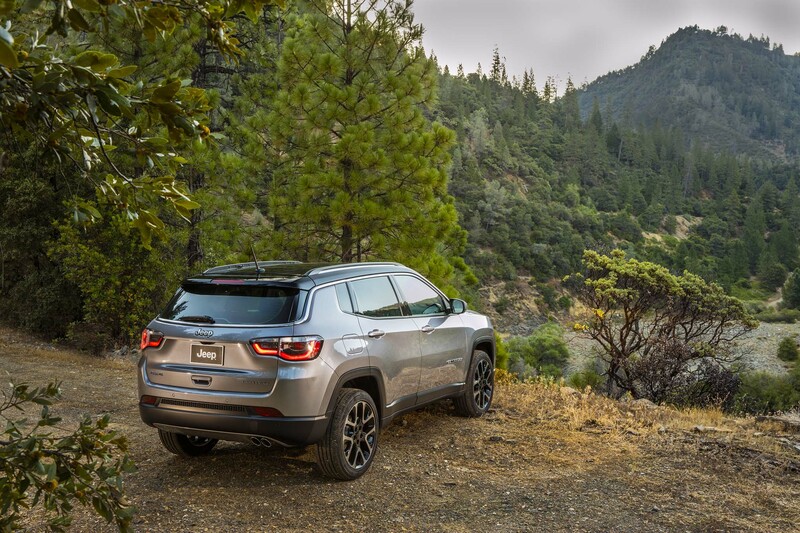 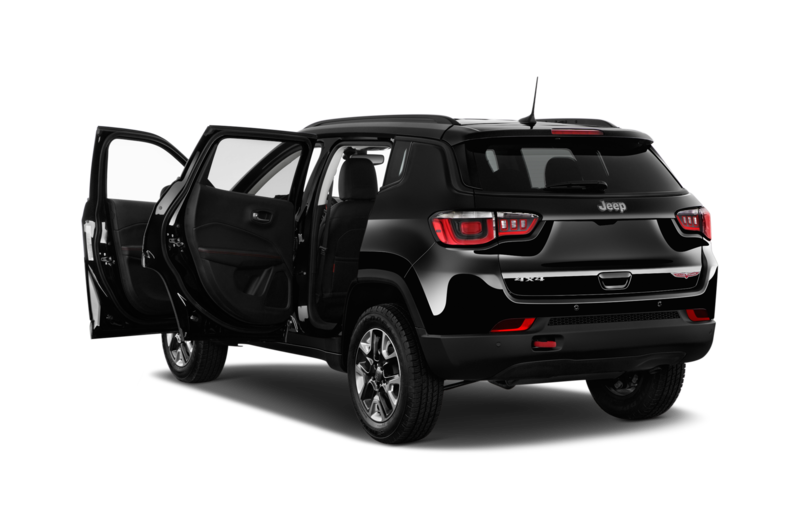 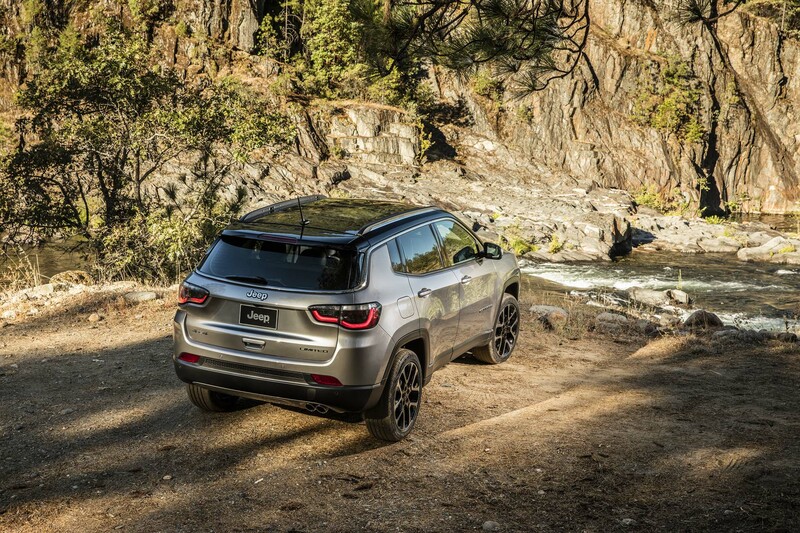 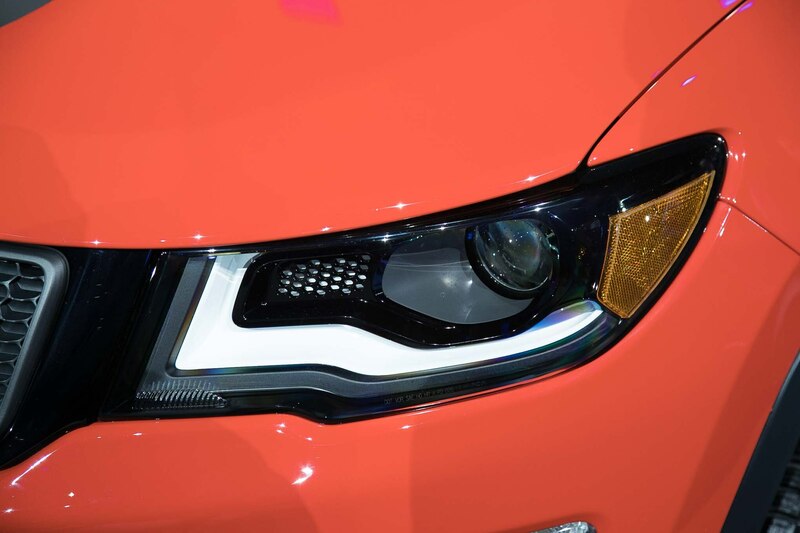 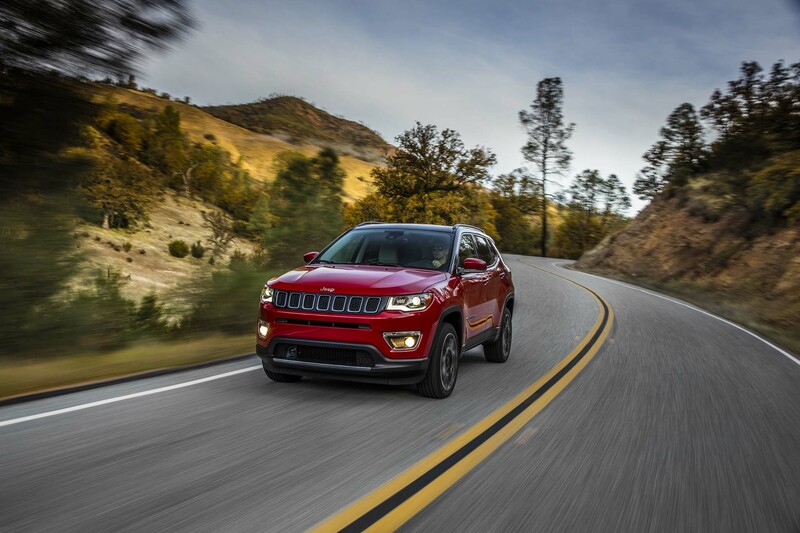 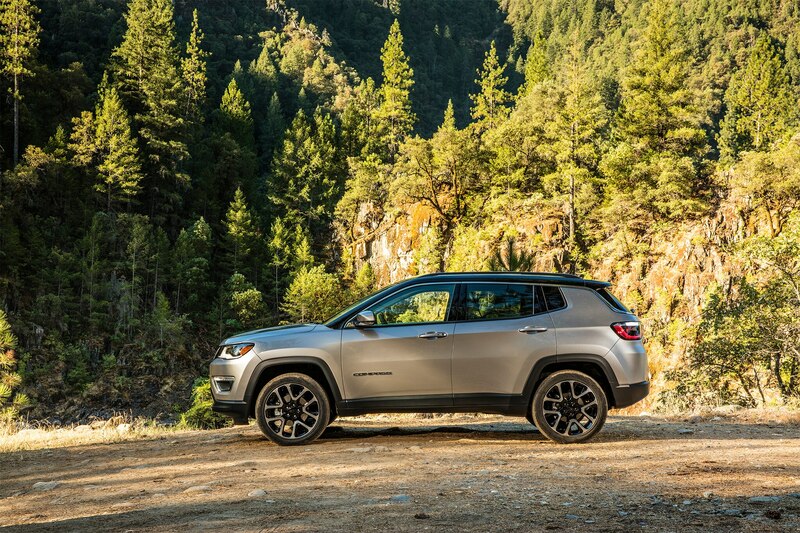 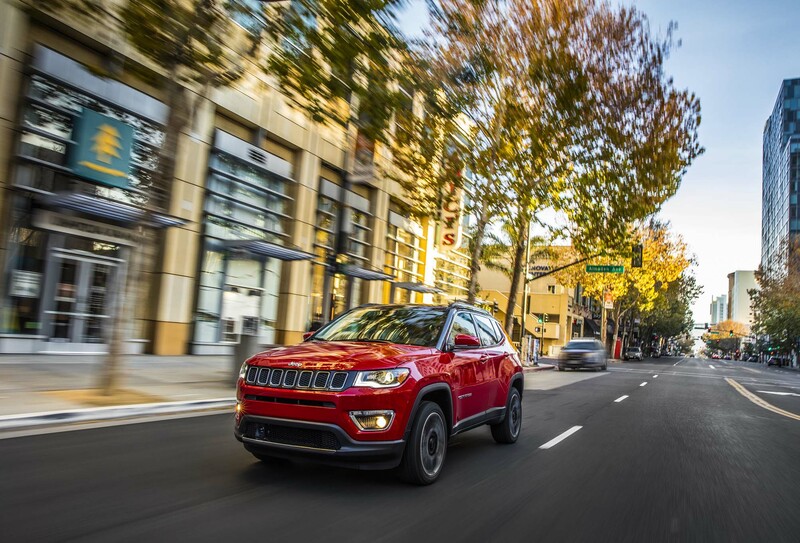 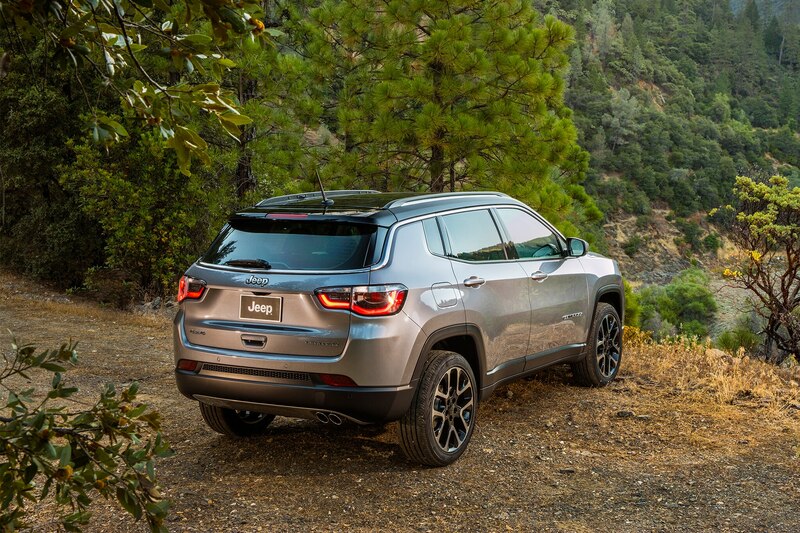 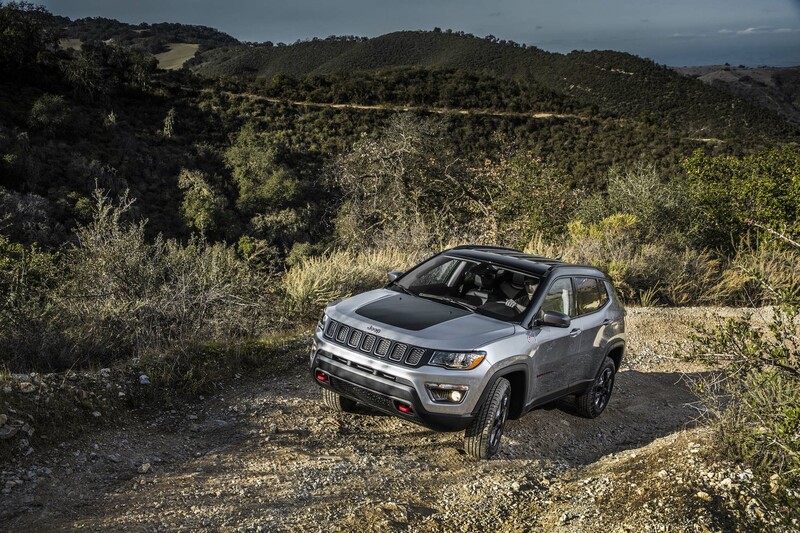 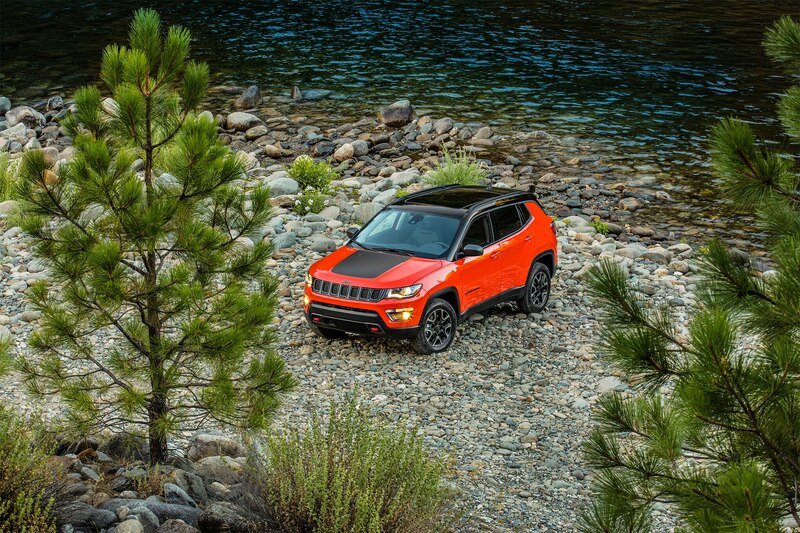 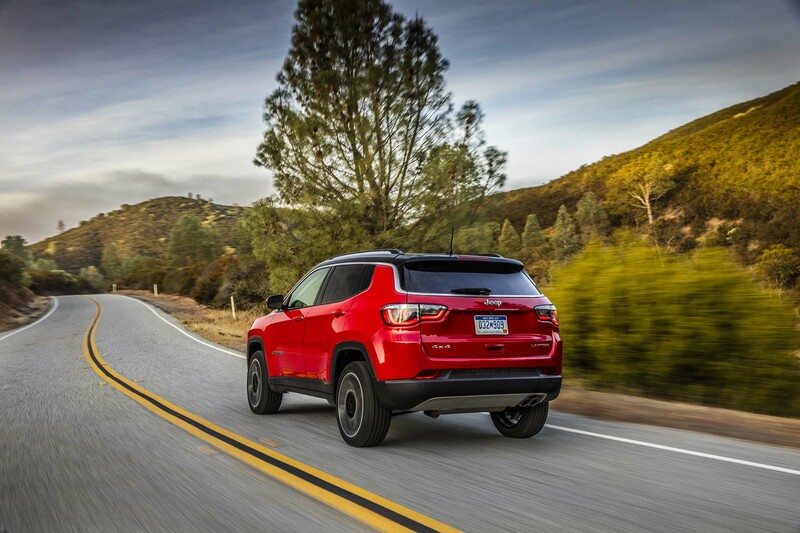 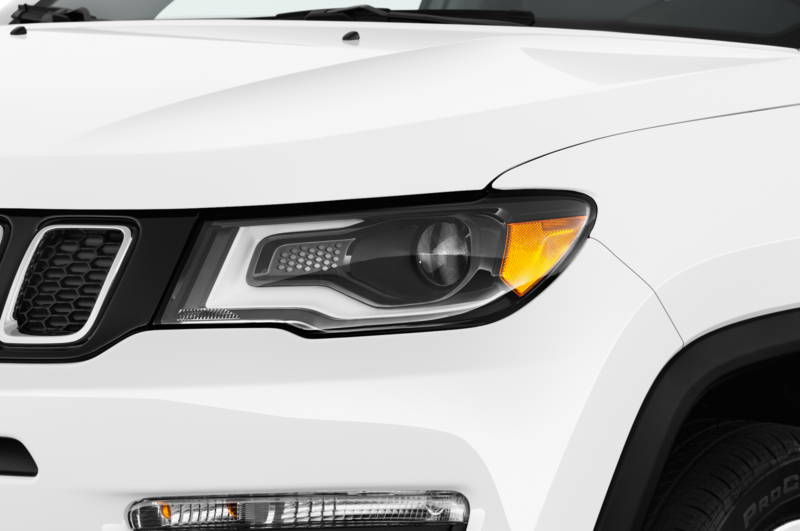 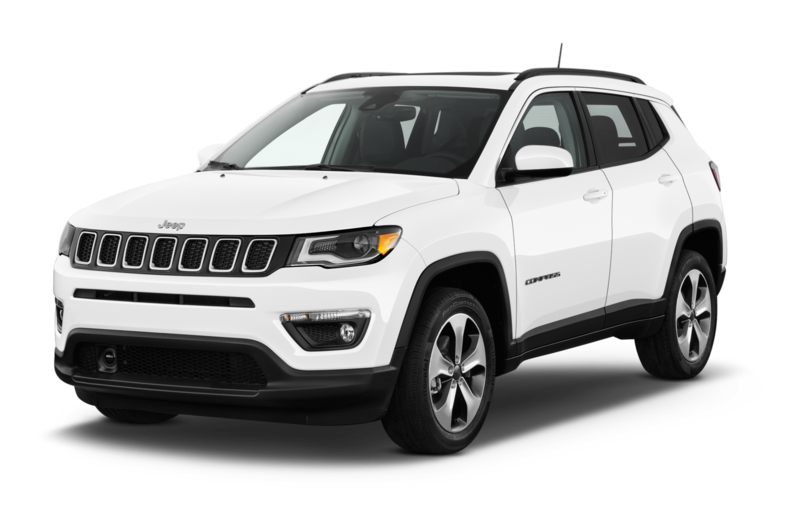 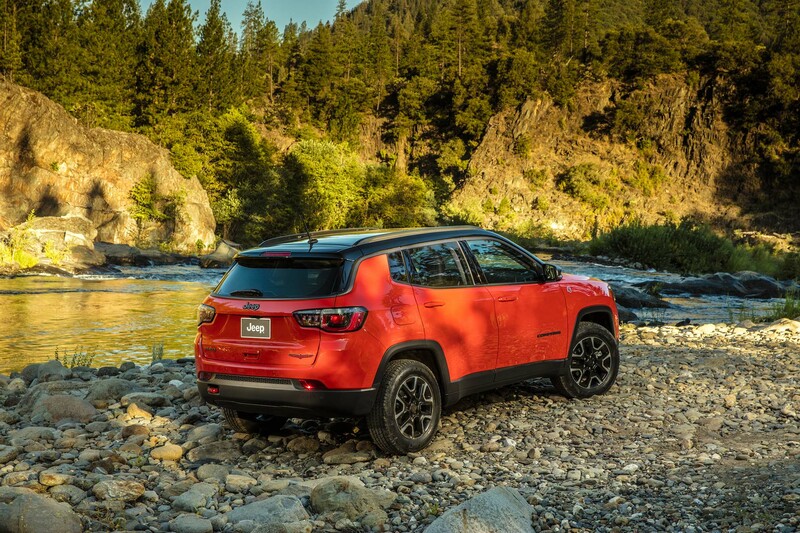 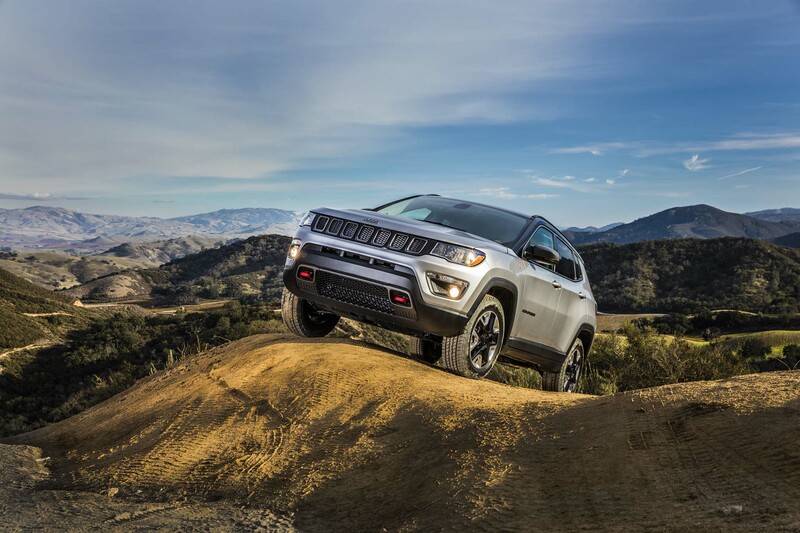 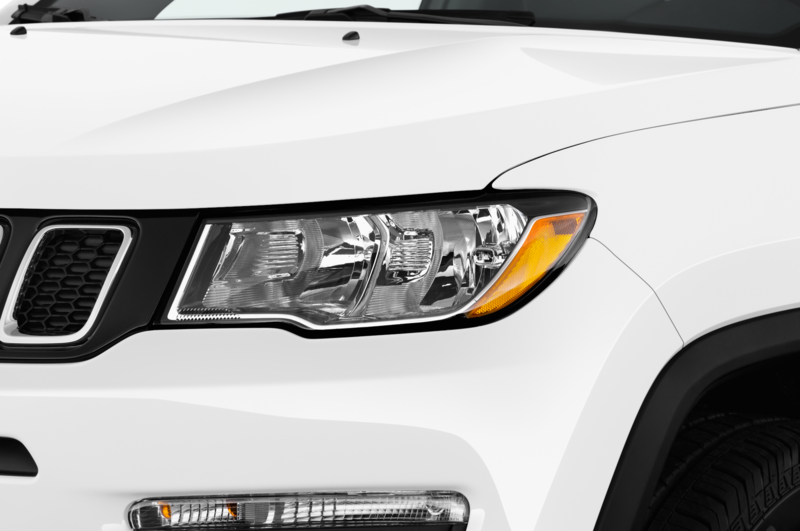 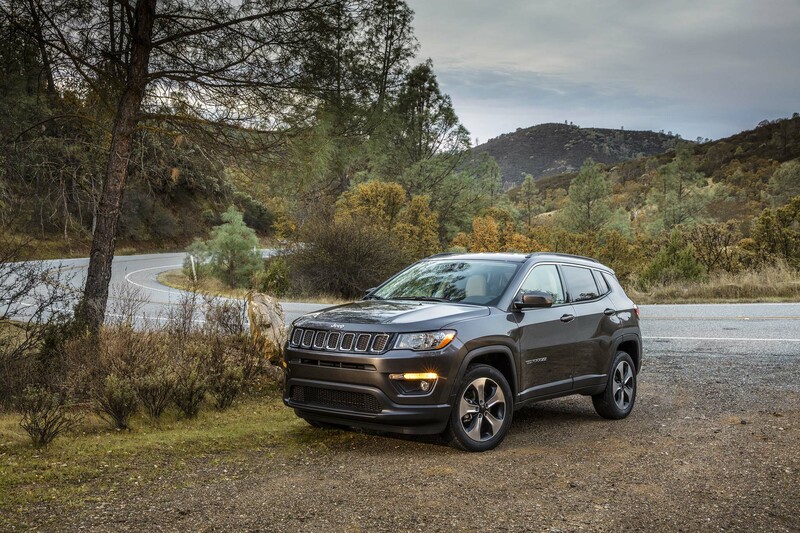 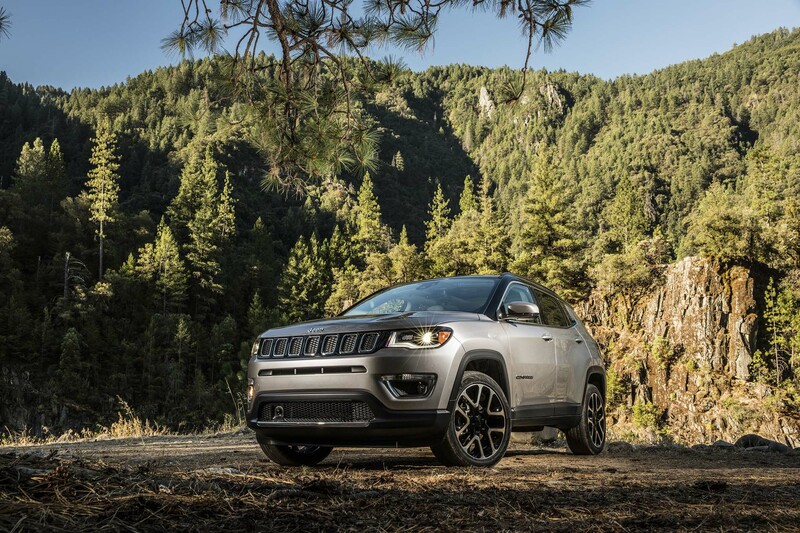 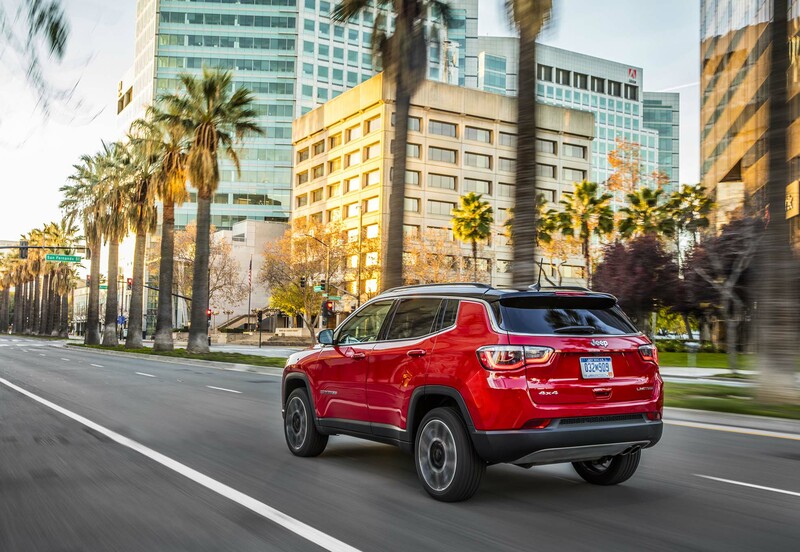 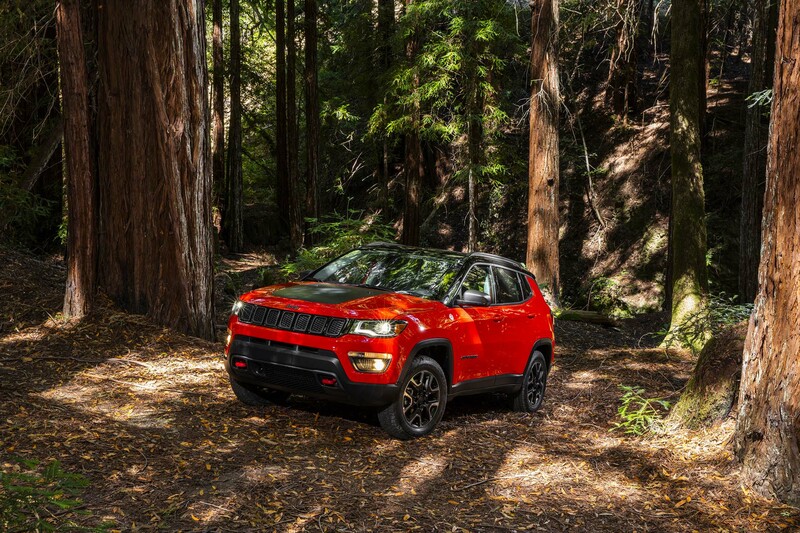 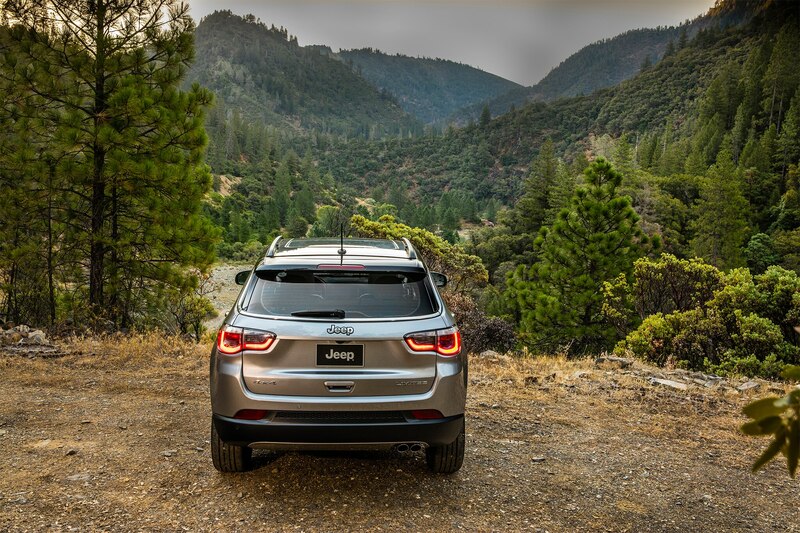 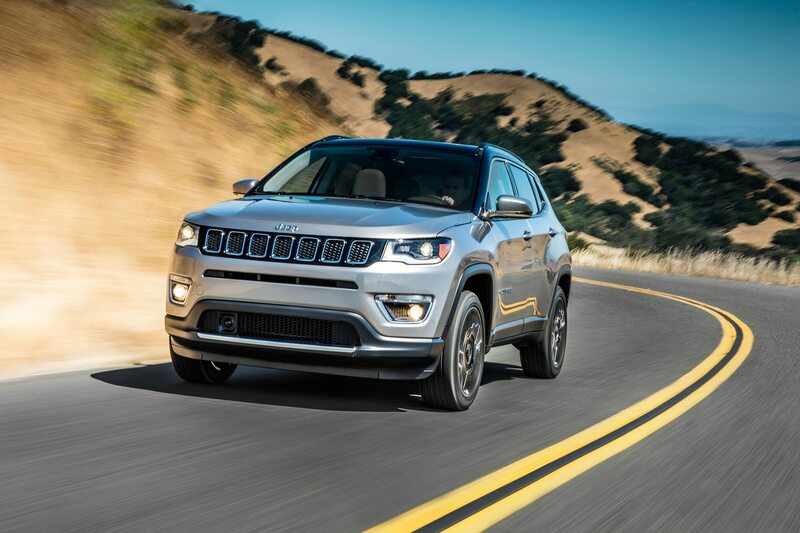 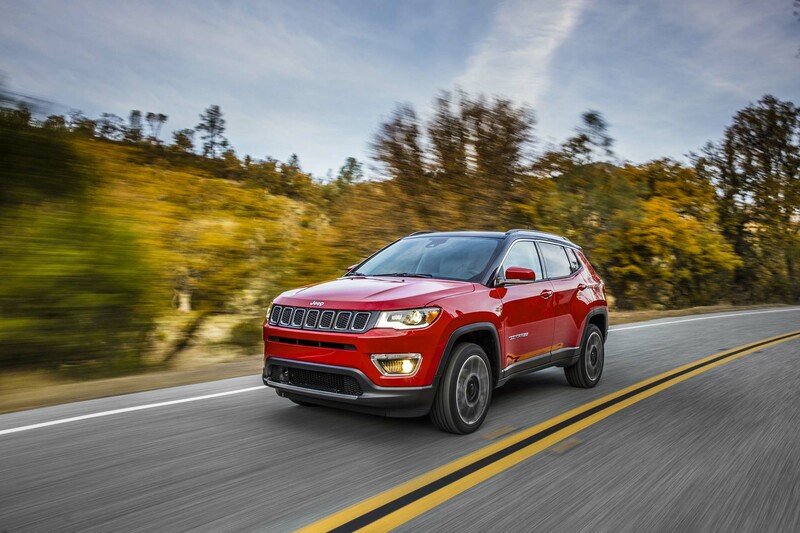 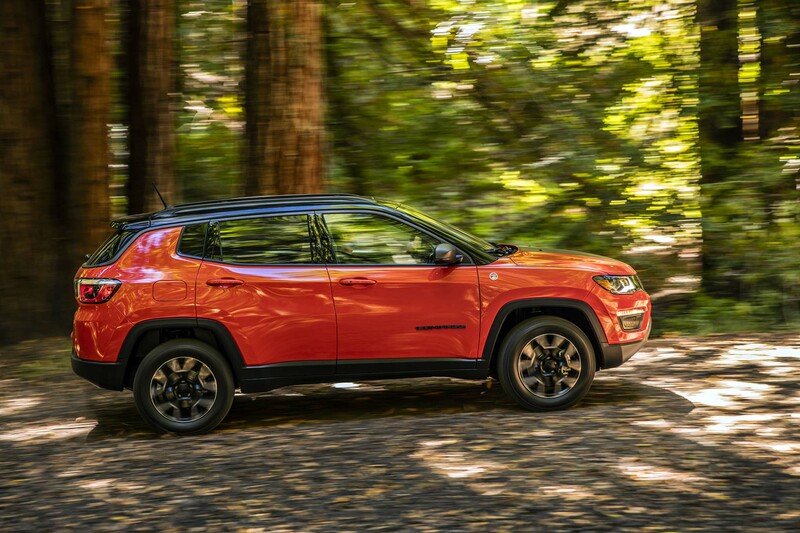 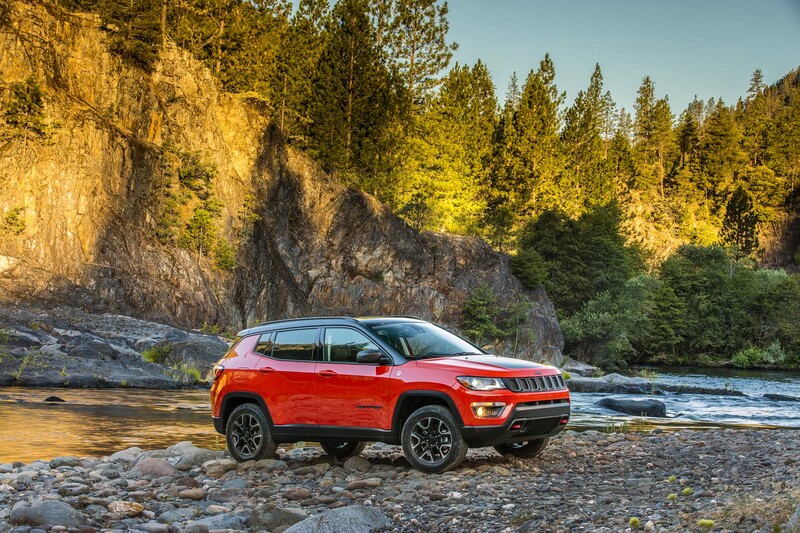 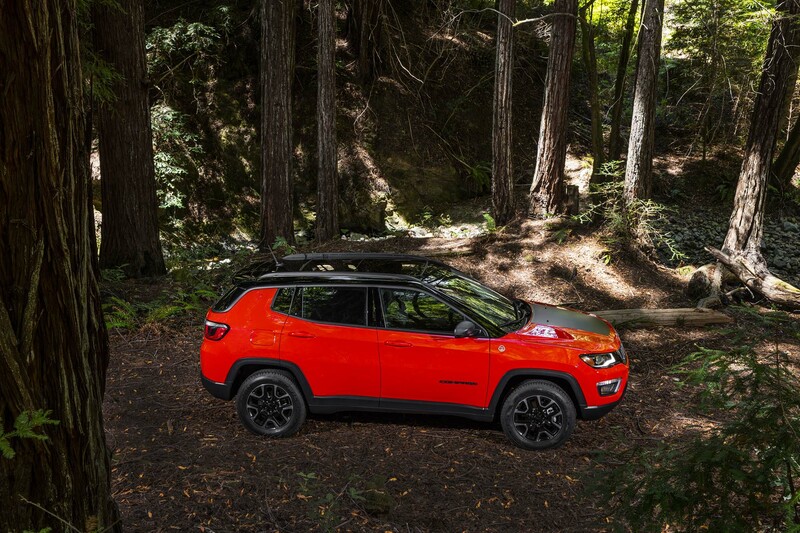 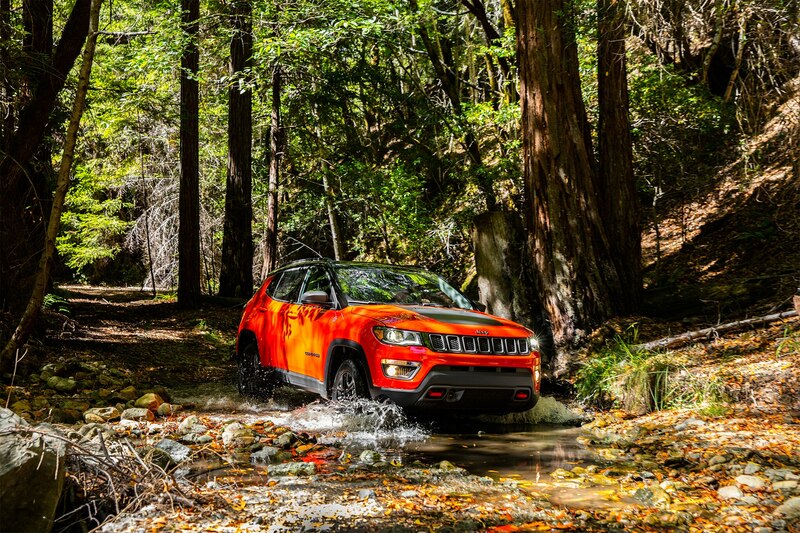 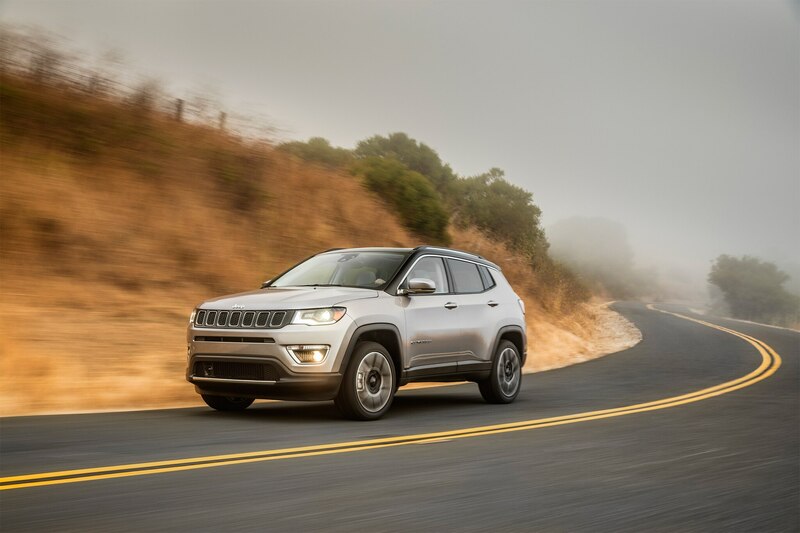 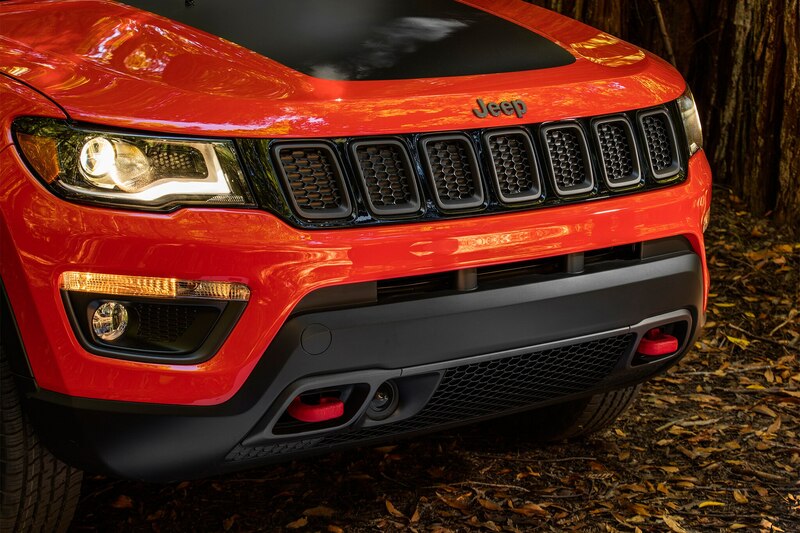 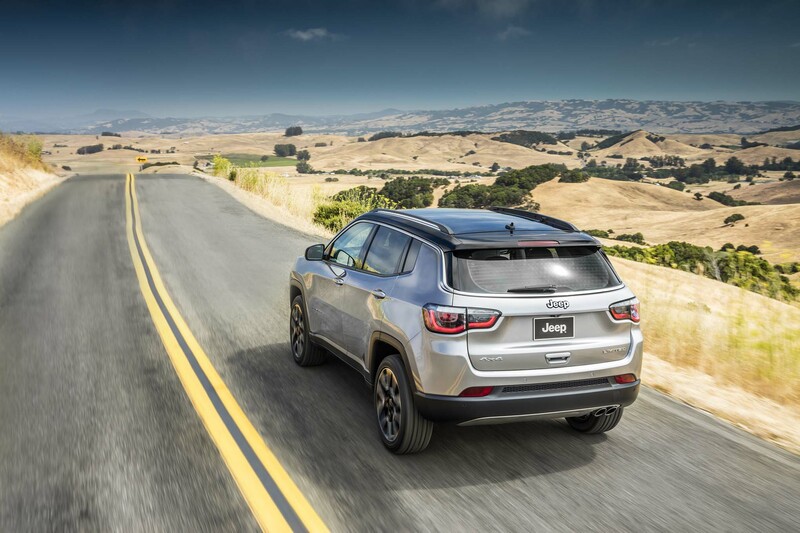 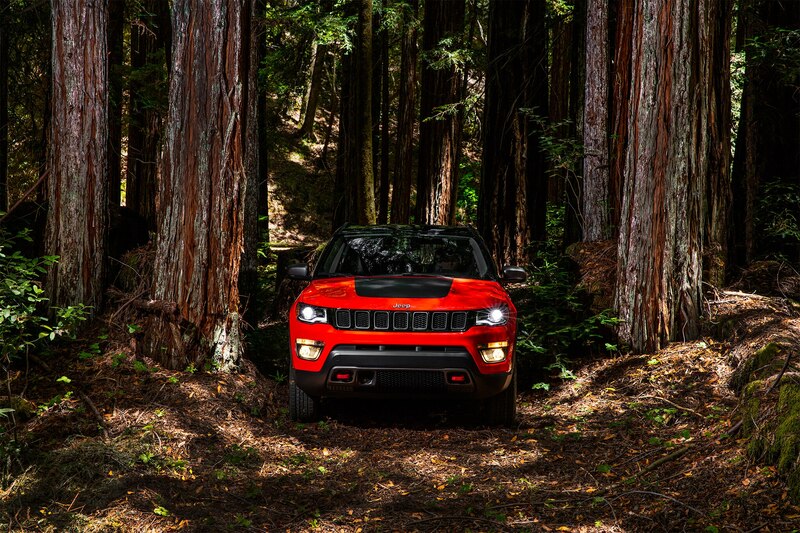 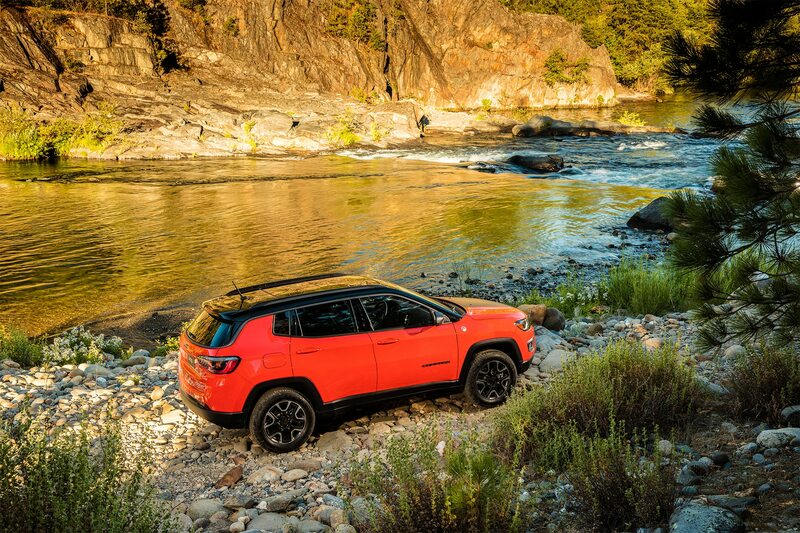 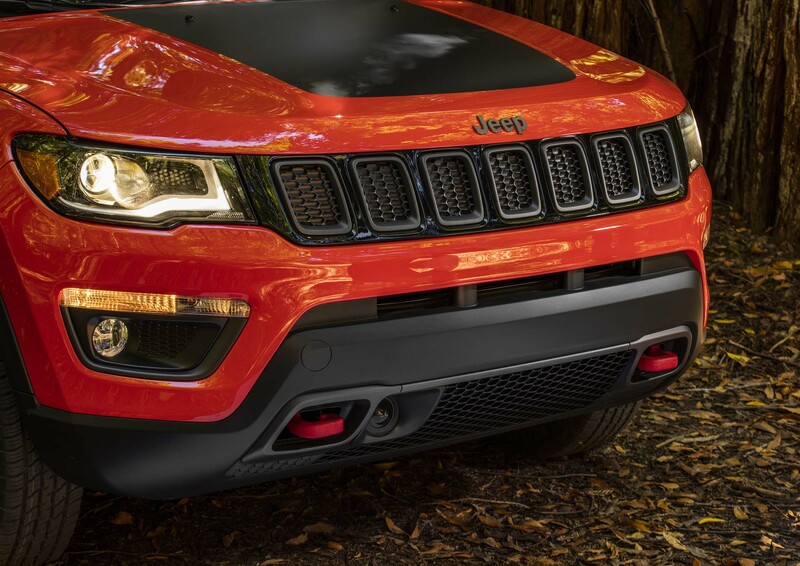 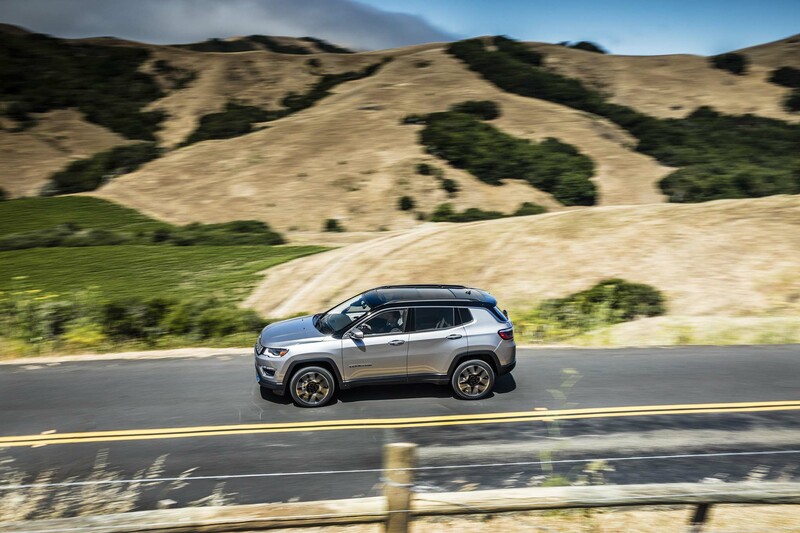 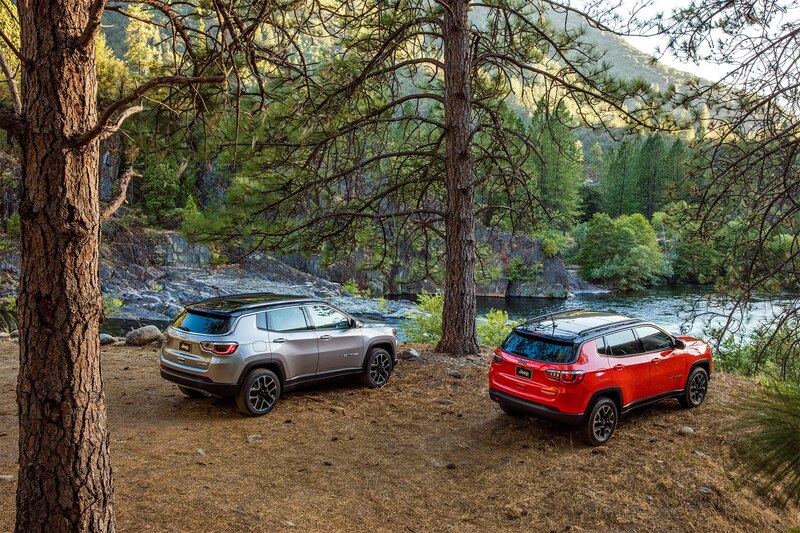 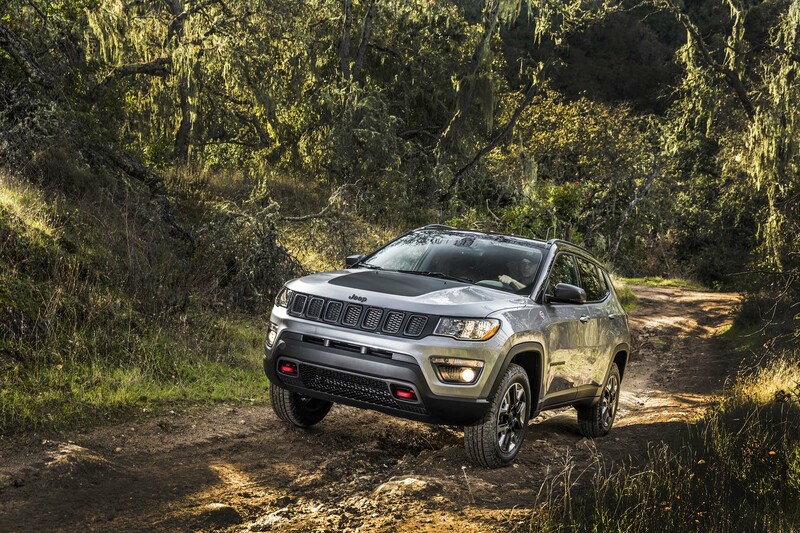 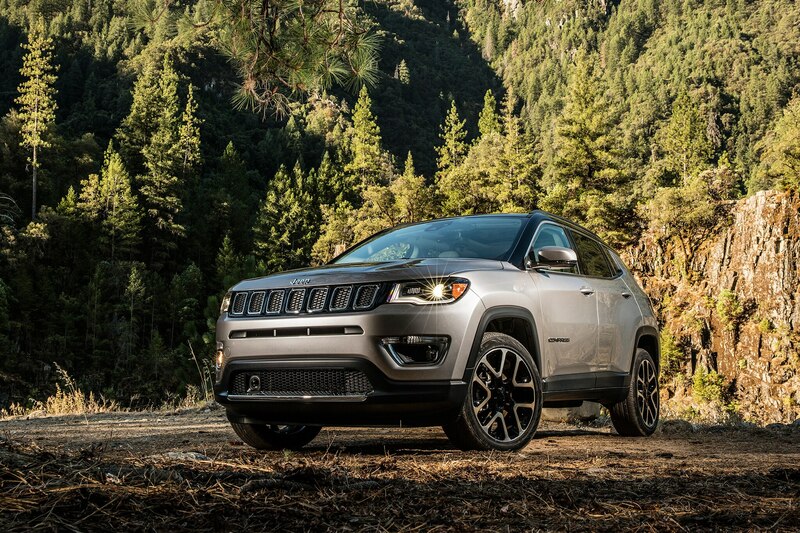 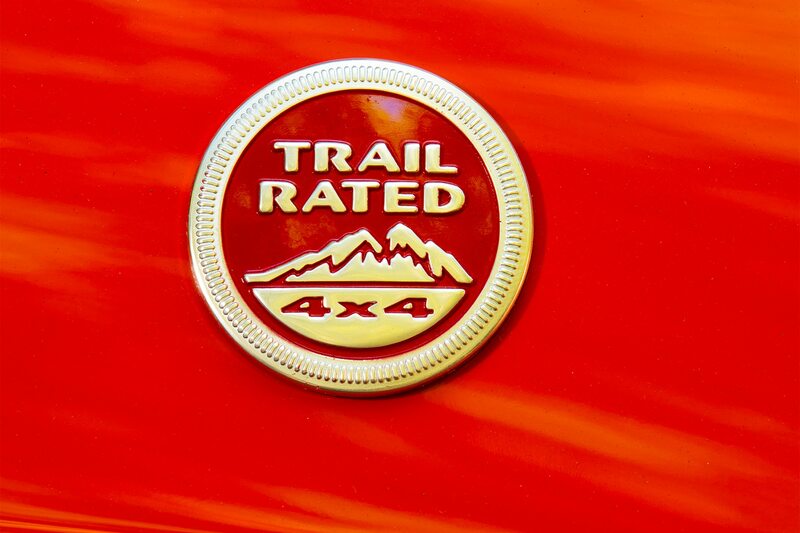 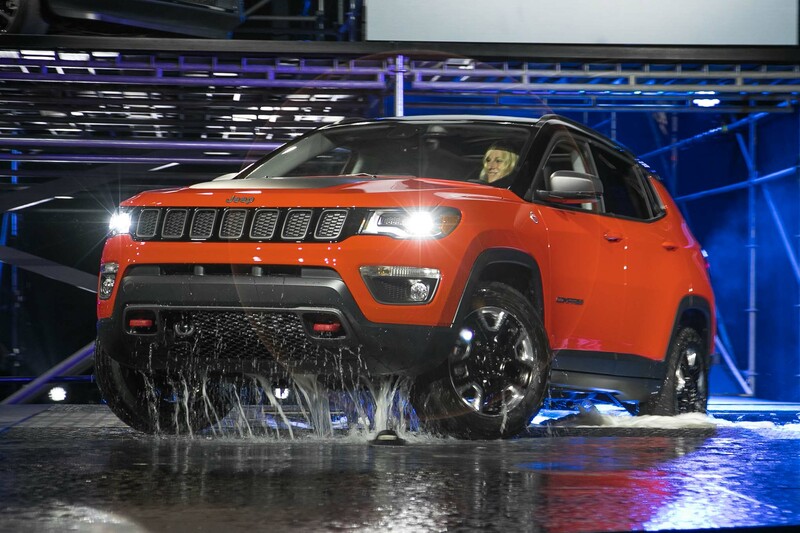 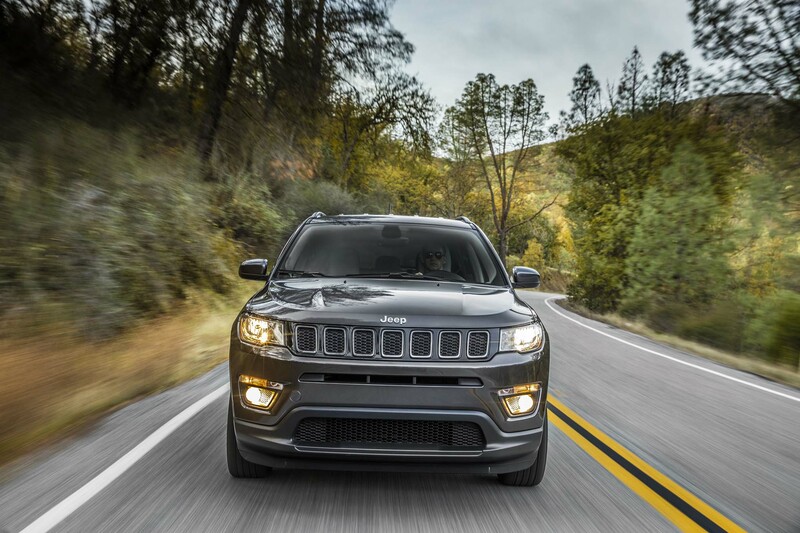 Except, according to Jeep, unlike the Compass’s competitors, the compact crossover will be equipped with more rugged capabilities, allowing it to tackle everything on and off road. 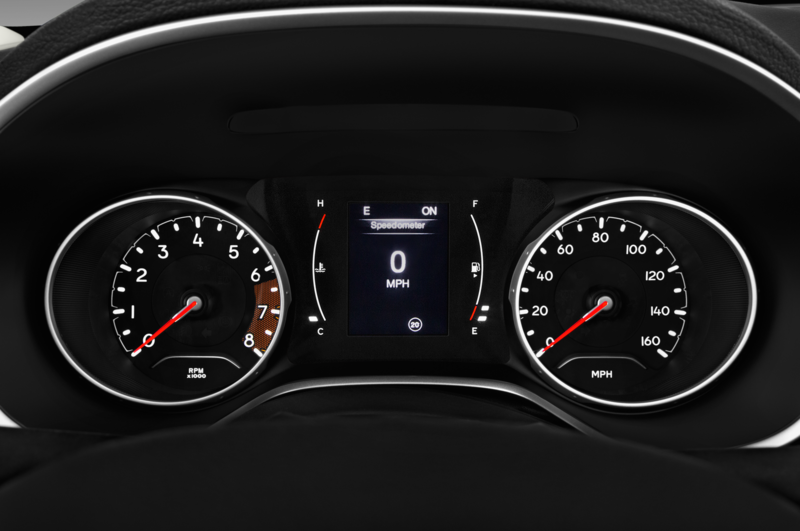 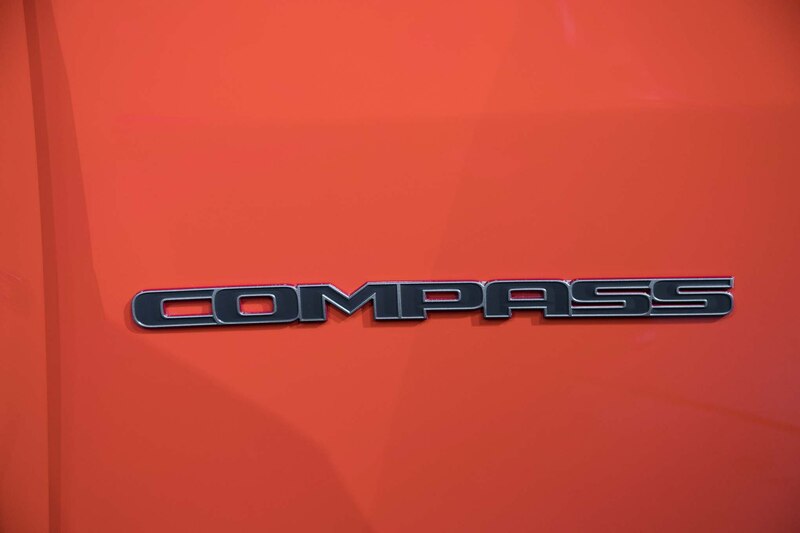 This Compass will be a truly worldwide model, being offered in over 100 countries, built in four countries, and available with five different engine options, three transmissions, and a host of tech integrations, giving consumers the ability to finely tune their perfect ride. 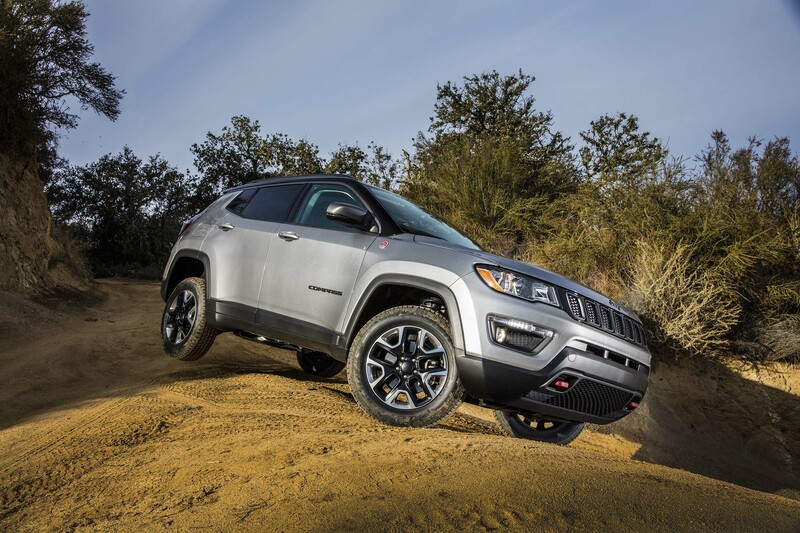 There will also be two 4×4 systems, Jeep’s Active Drive full time 4×4 system and Jeep Active Drive Low, a class-exclusive full time 4×4 system with a 20:1 crawl ratio. Both can send 100 perfect of available torque to any one wheel thanks to intelligent 4×4 logic built into the Compass’s ECU. 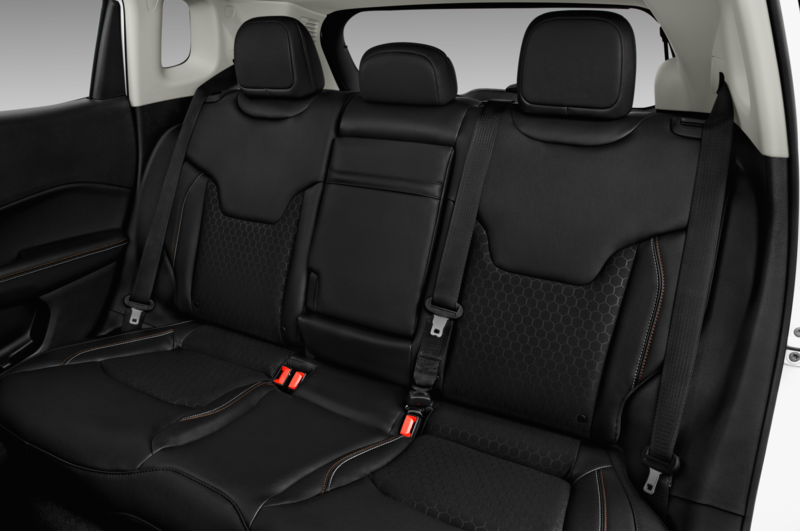 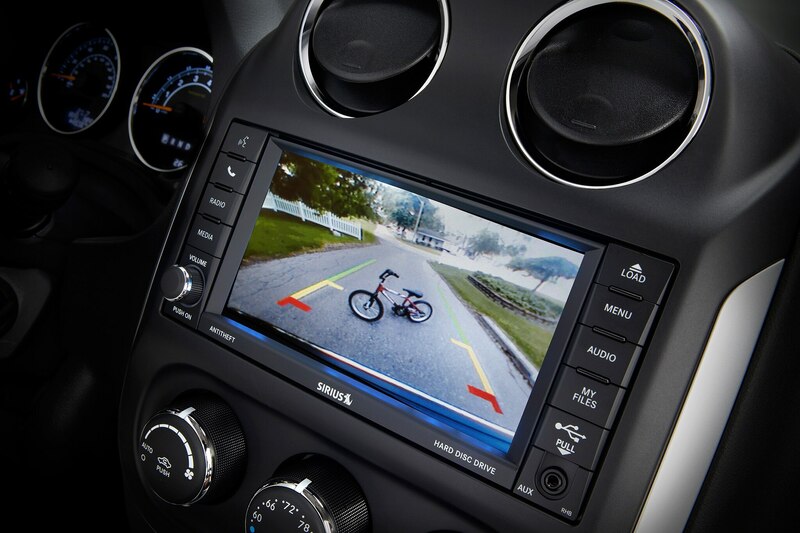 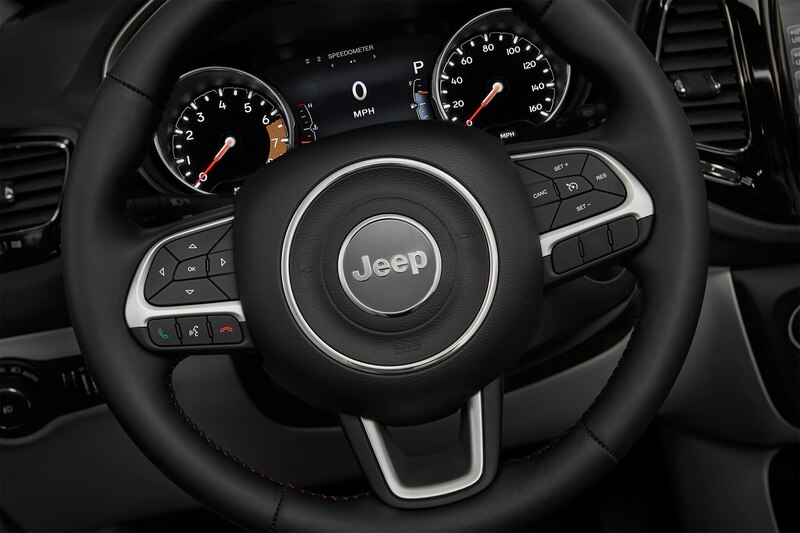 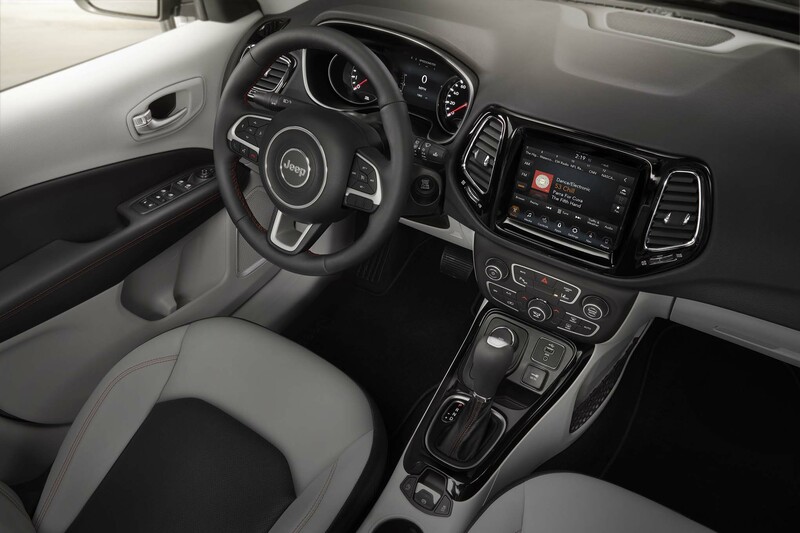 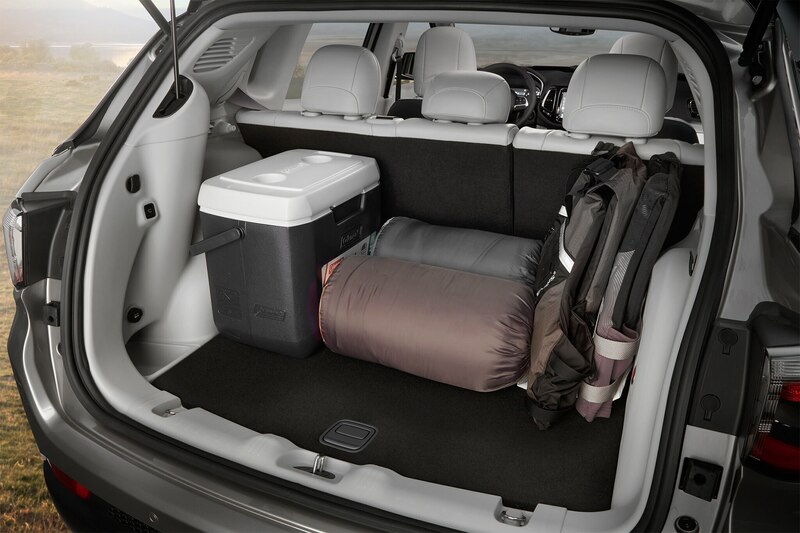 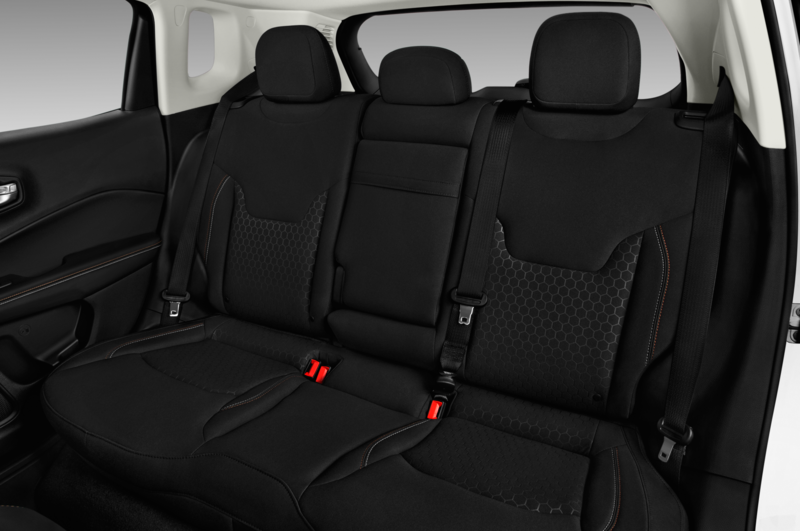 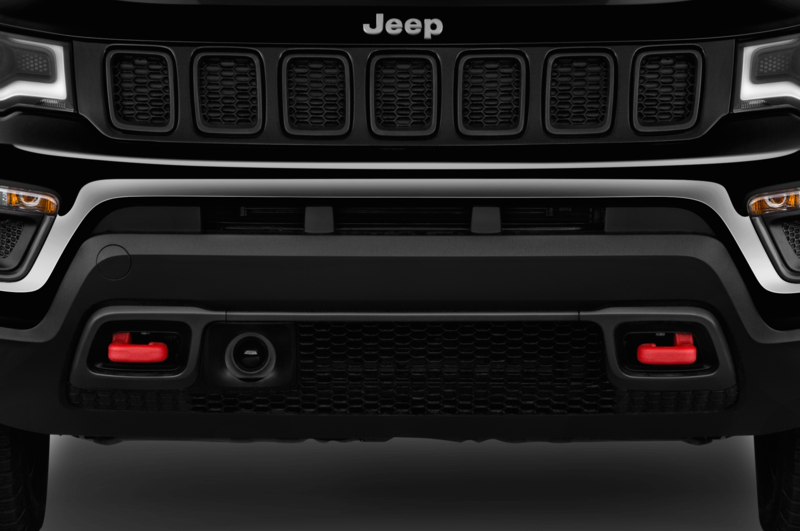 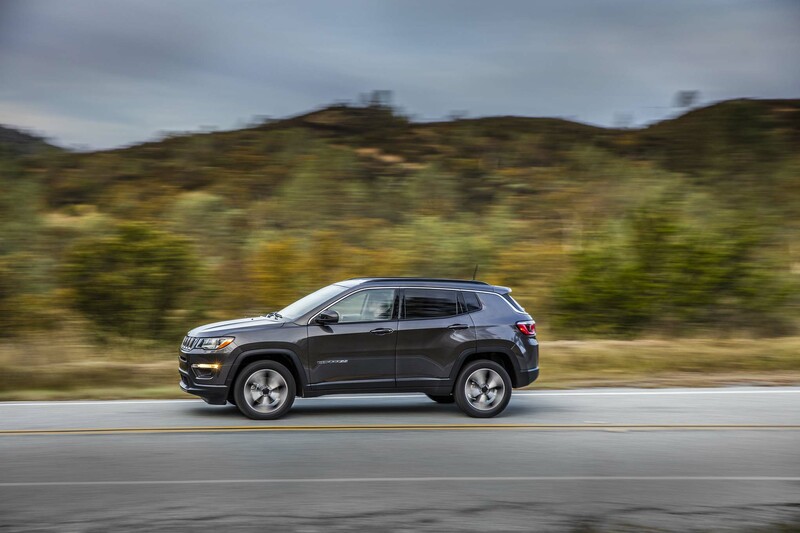 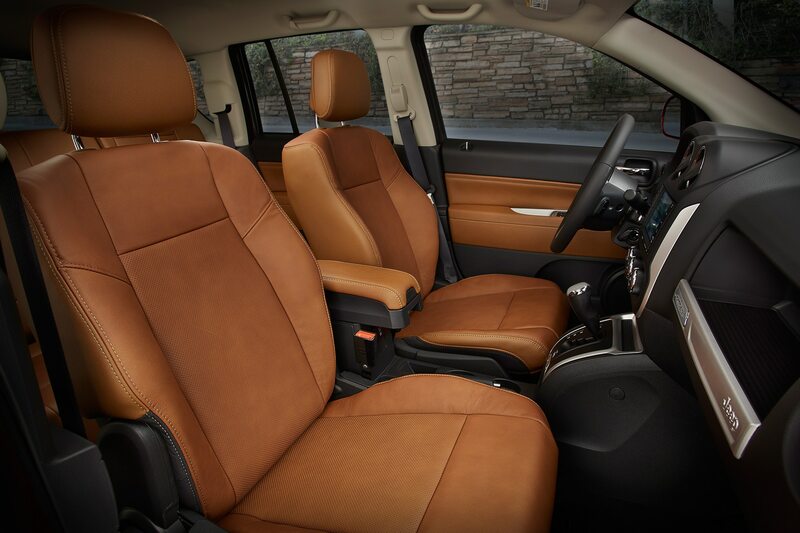 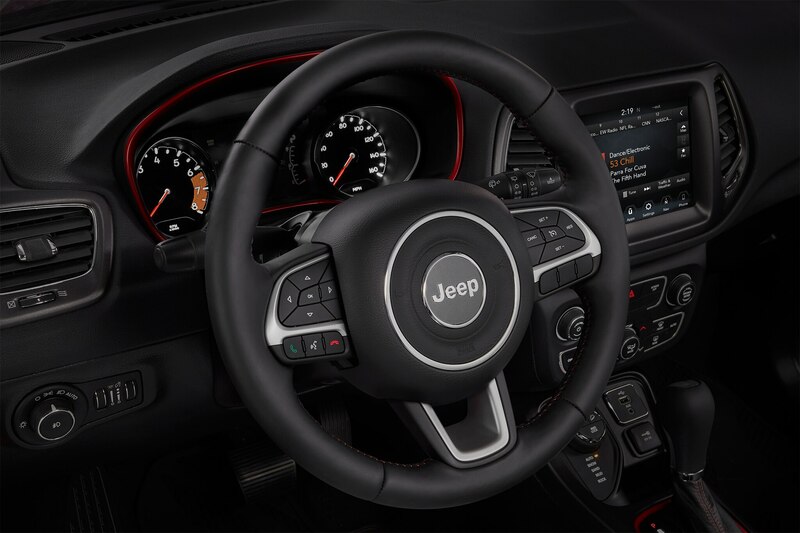 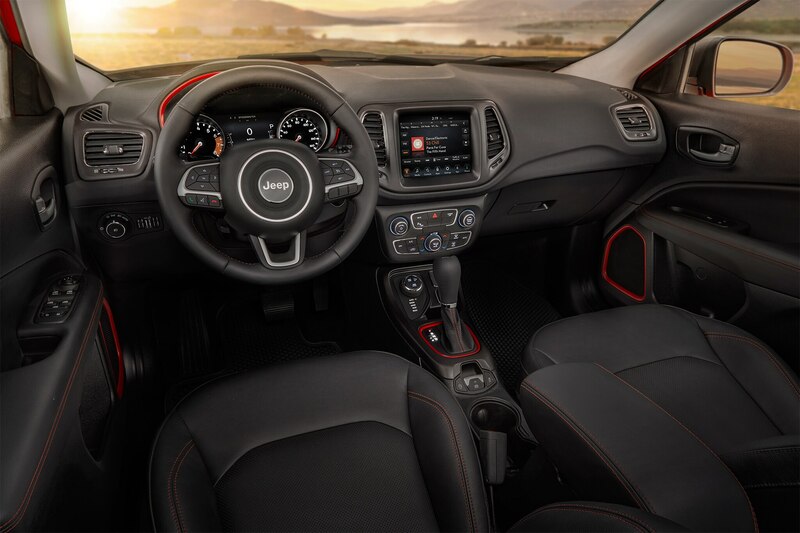 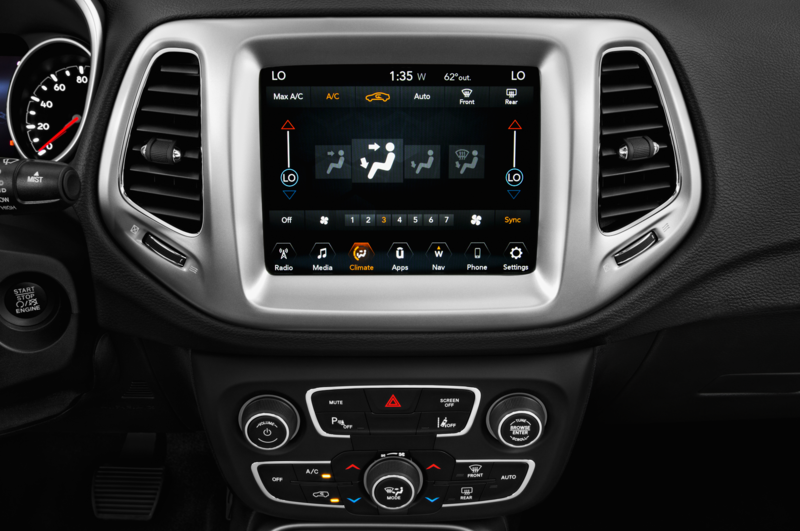 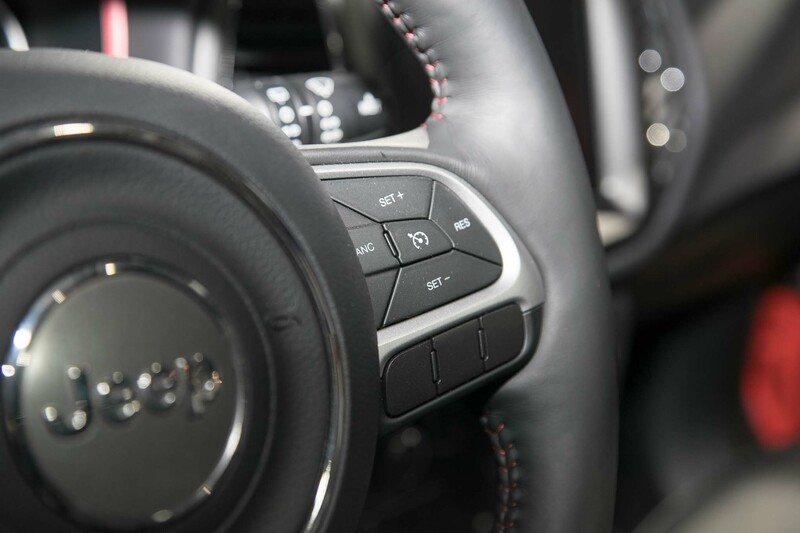 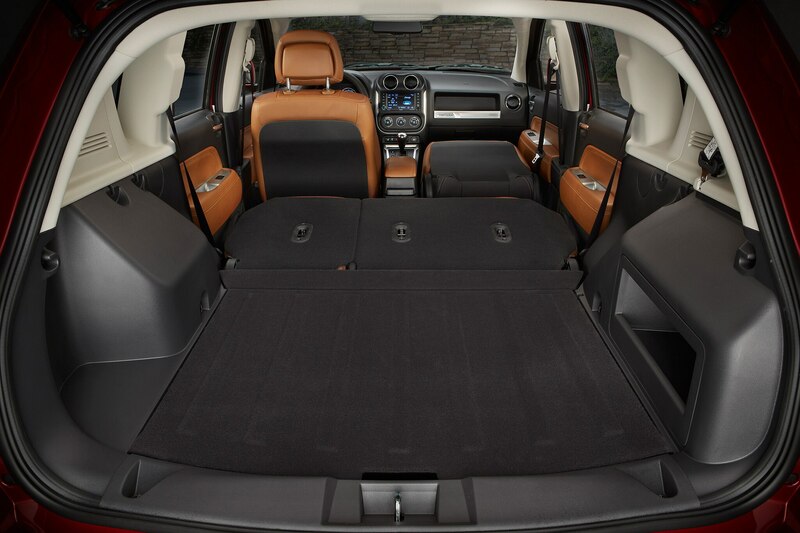 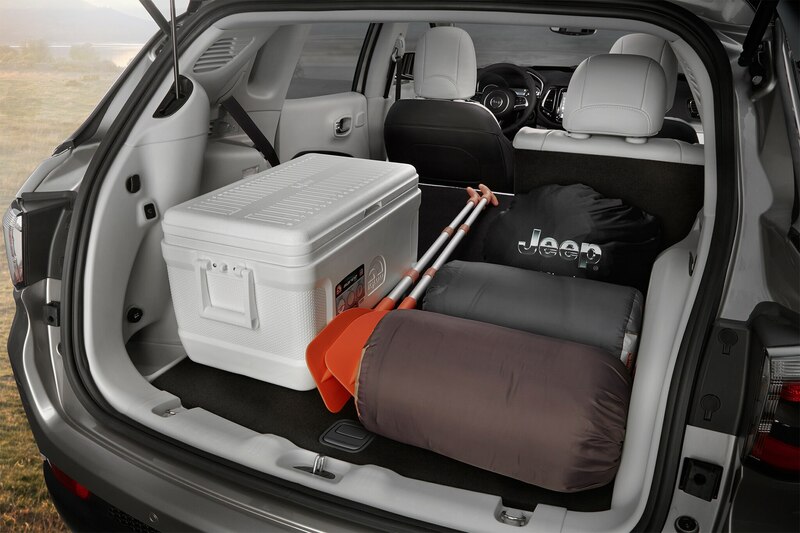 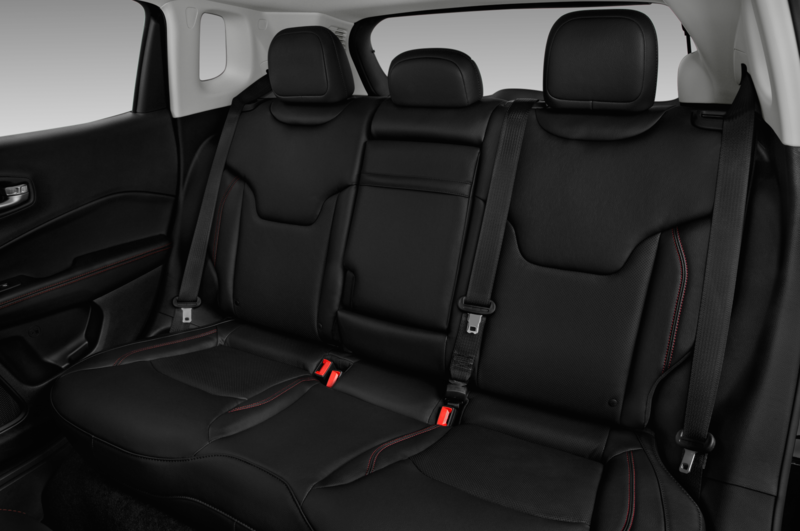 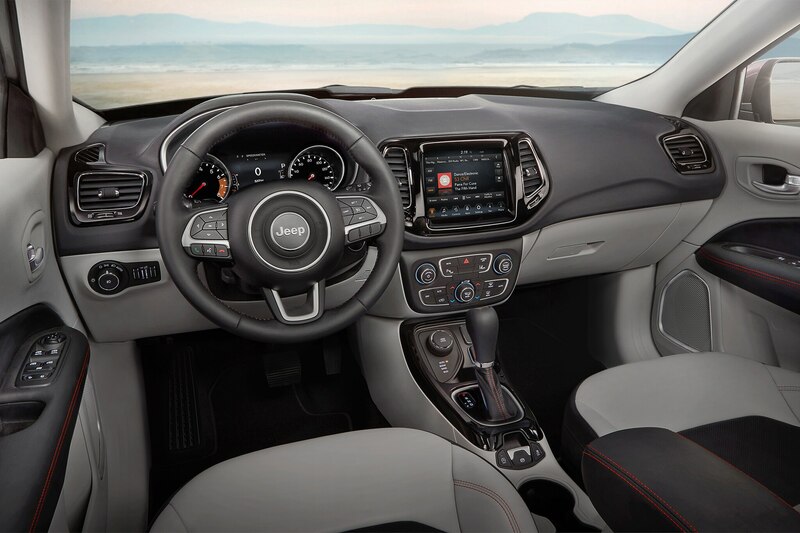 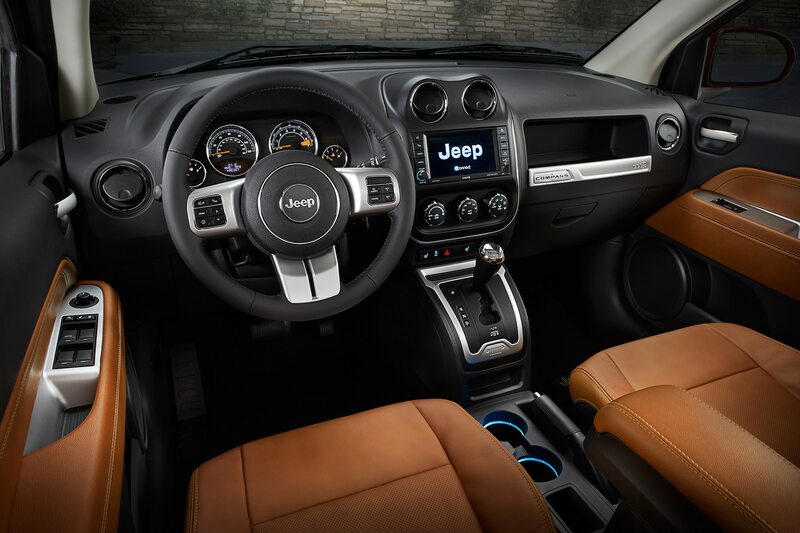 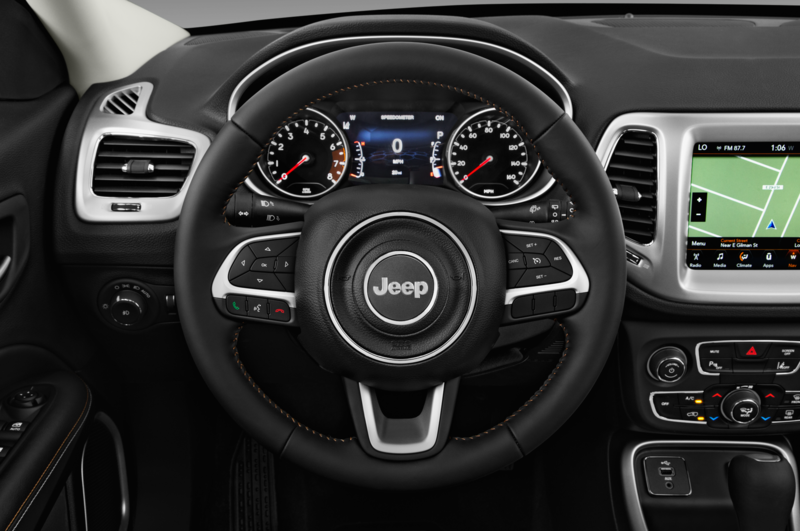 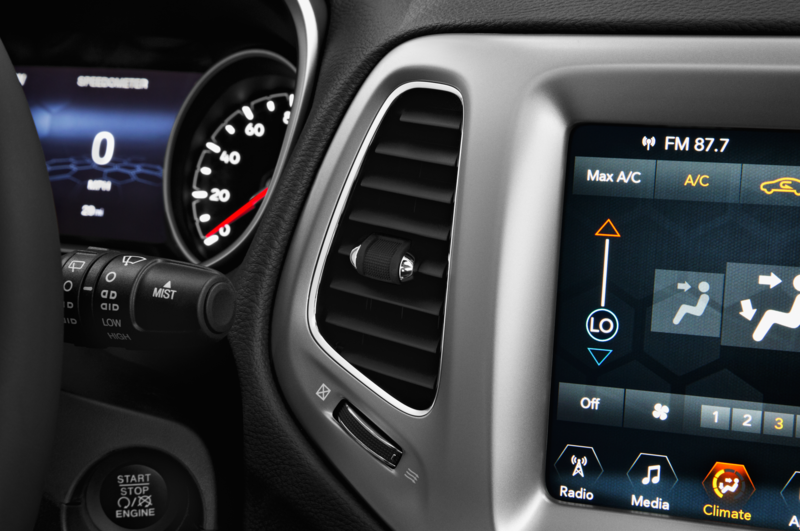 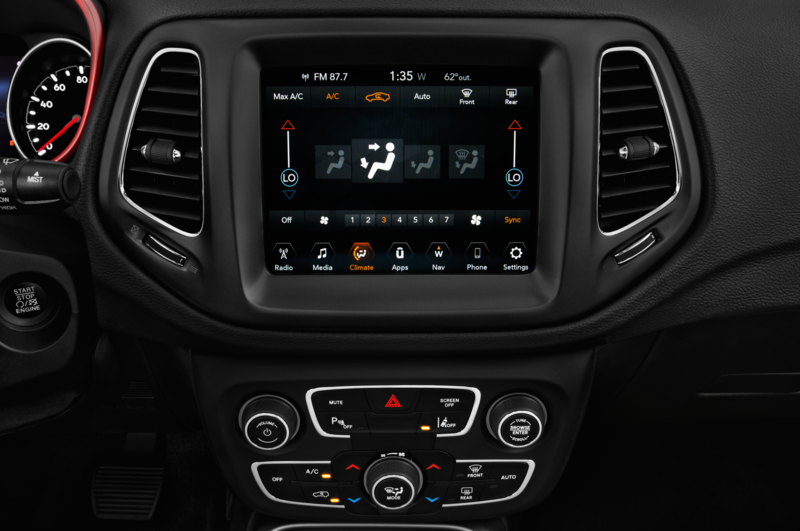 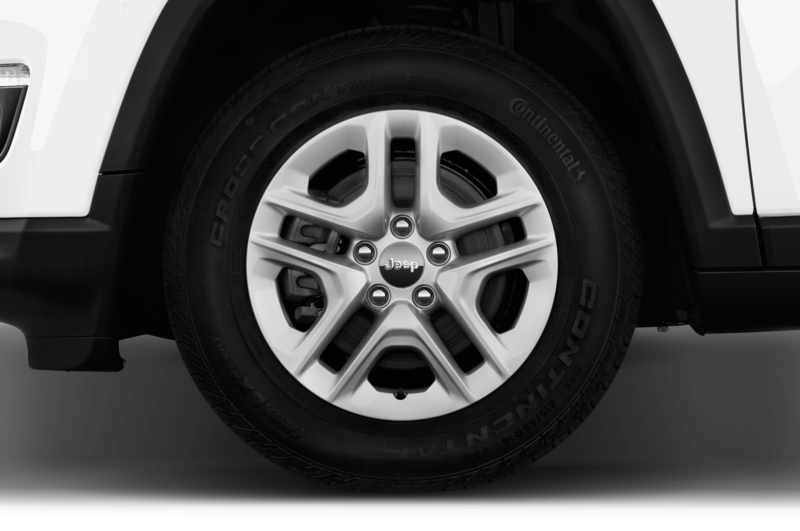 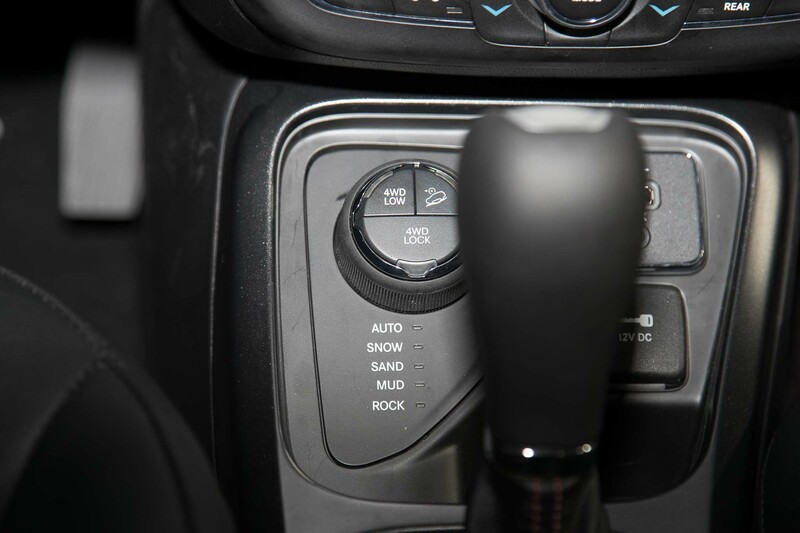 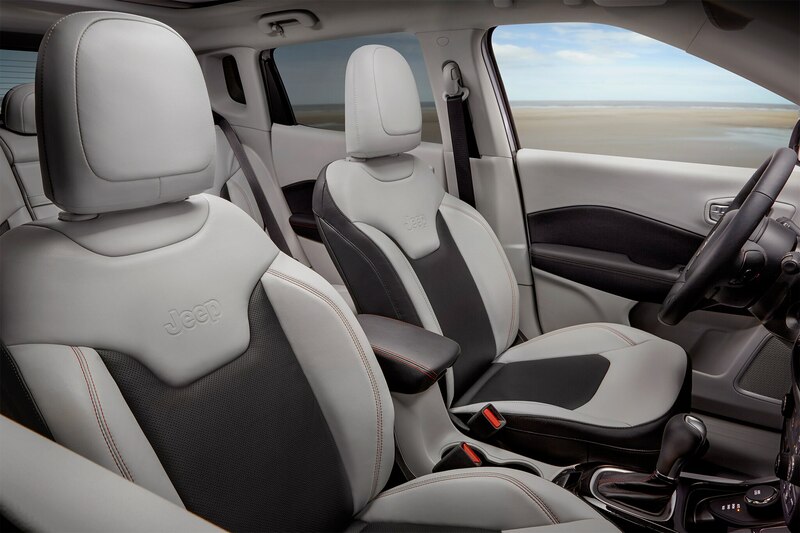 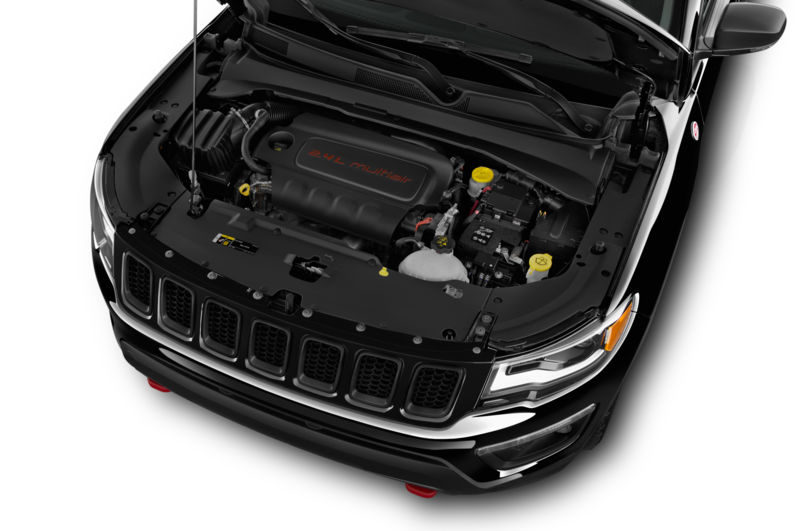 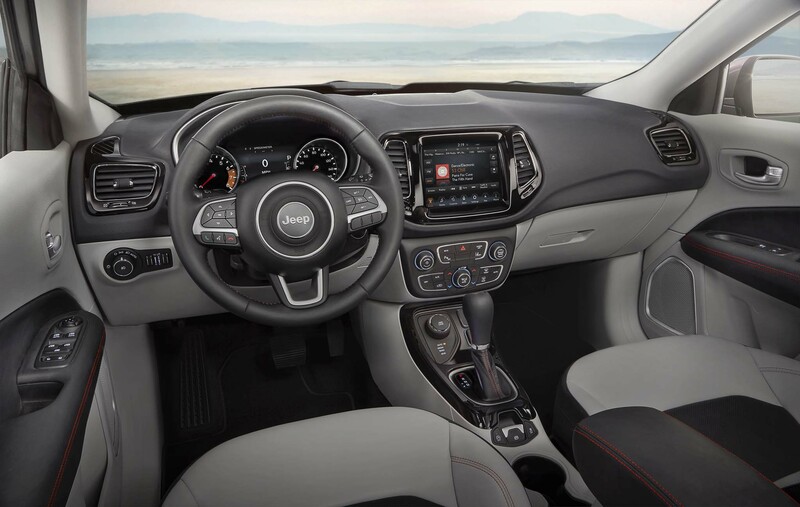 Both 4×4 systems also come with Jeep’s Selec-Terrain system, allowing the driver to choose from five different modes, including Auto, Snow, Sand, and Mud. 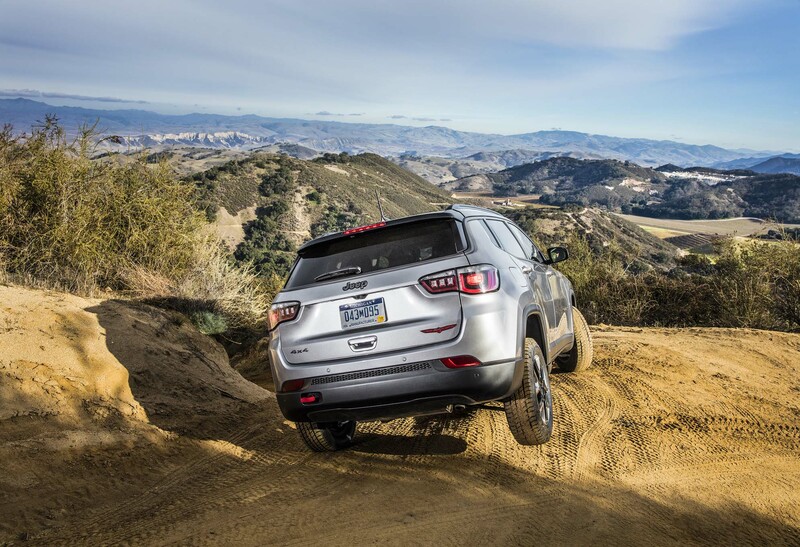 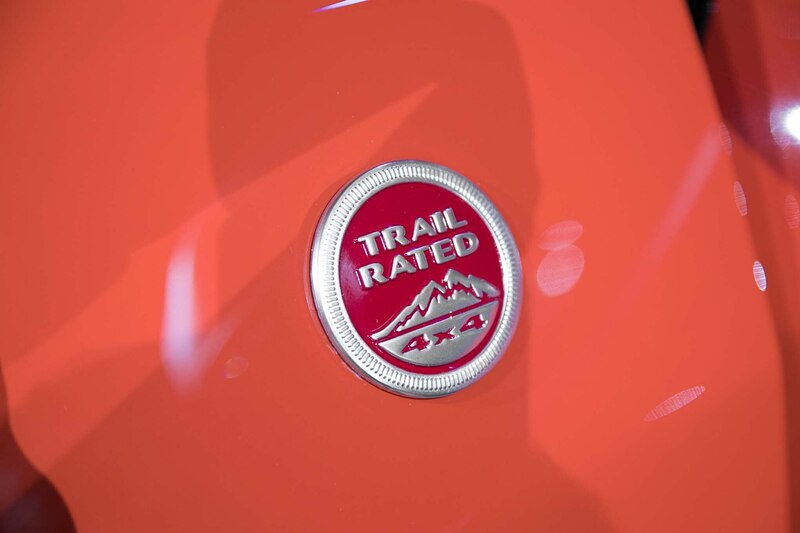 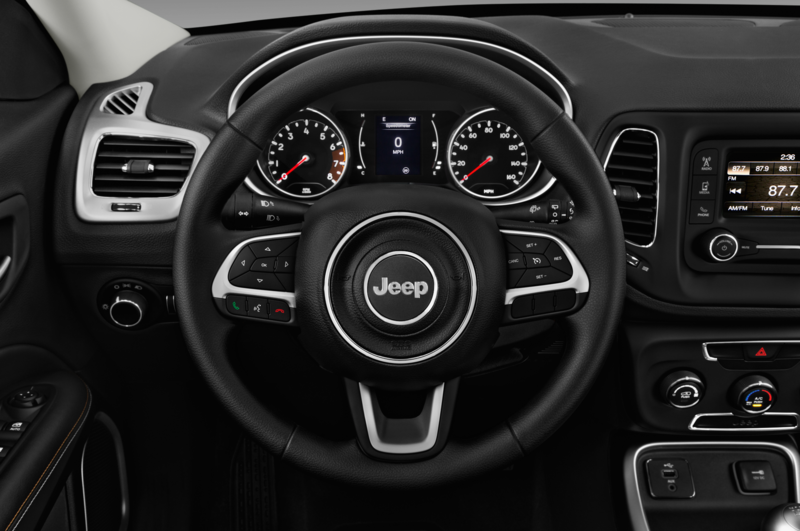 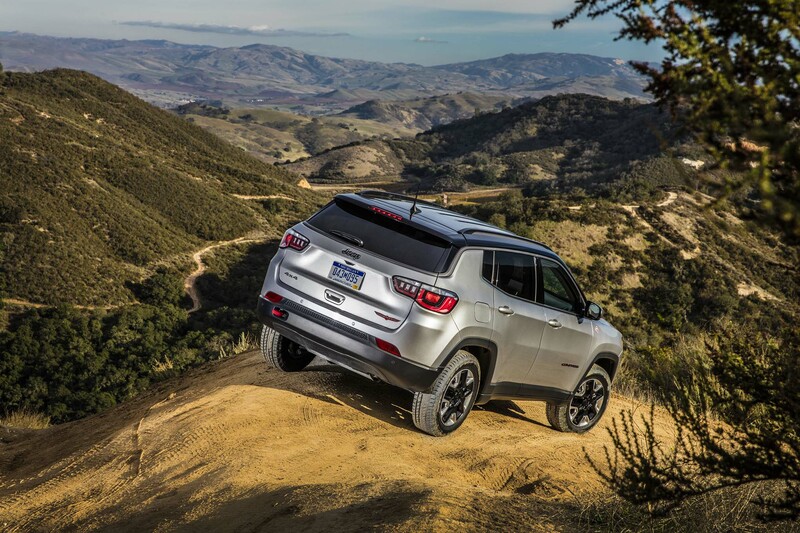 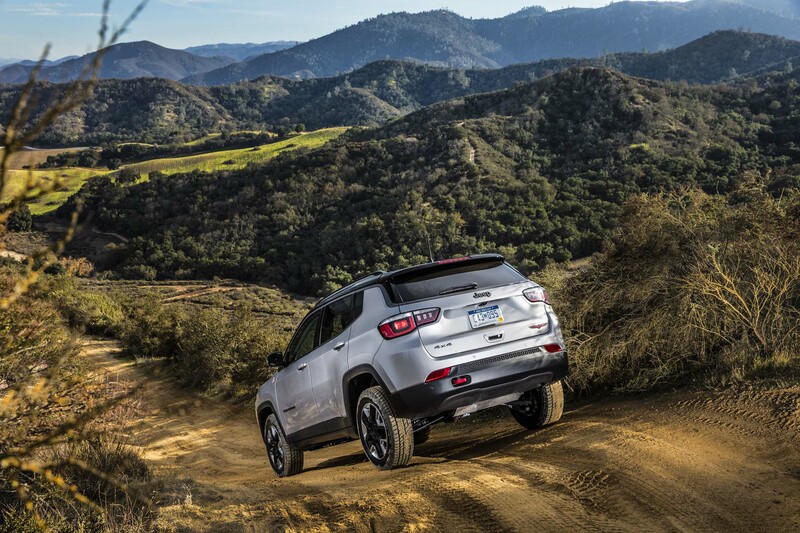 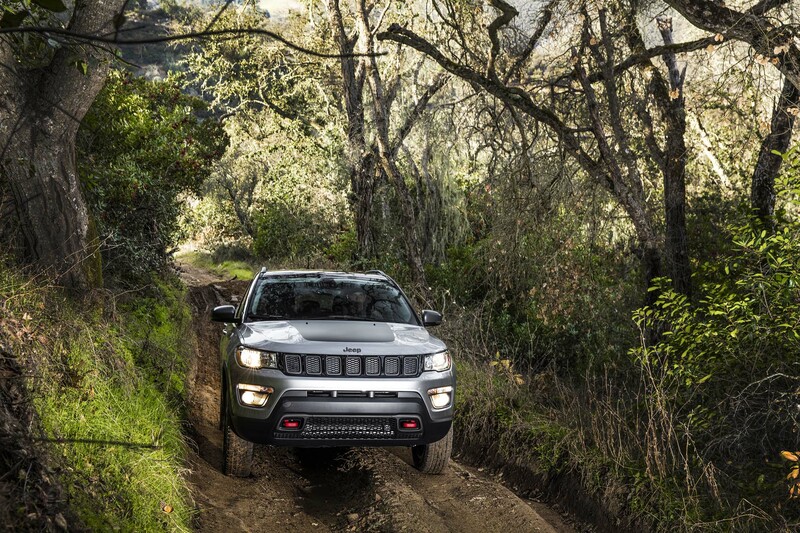 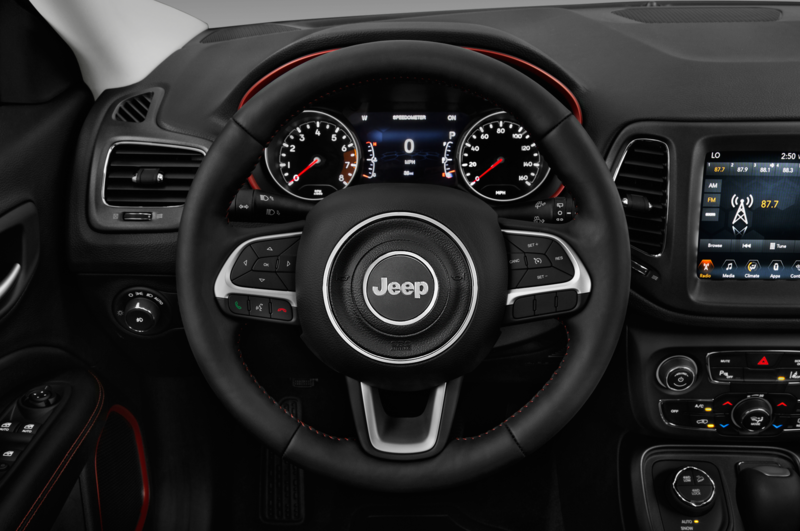 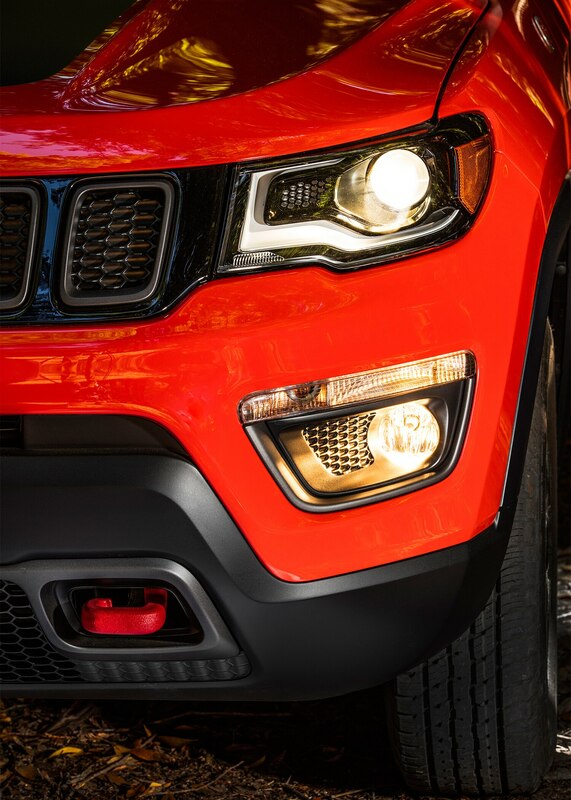 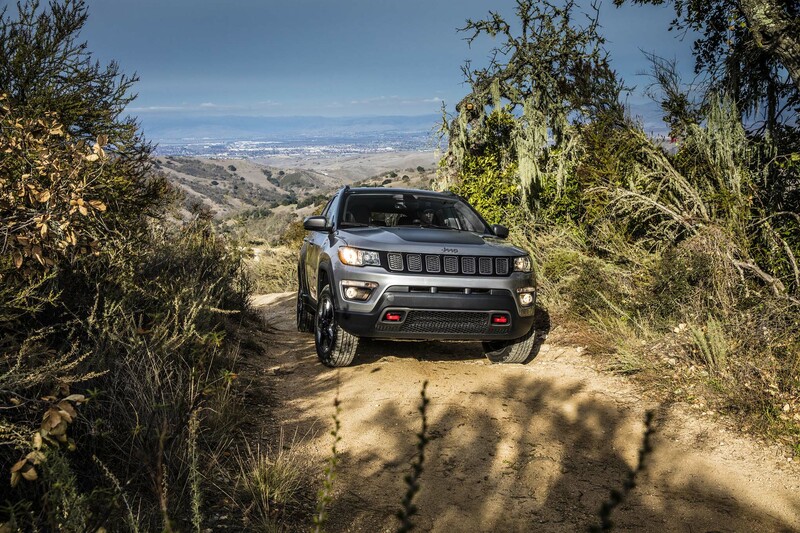 For consumers wanting more off-road prowess, Jeep will also offer a Compass Trailhawk featuring a Rock mode, Selec-Speed Control with Hill-Descent Control, an increased ride height, skid plates, front and rear tow hooks, and unique front and rear fascias that allow a 30-degree approach angle, 24-degree breakover angle, and 34-degree departure angle. 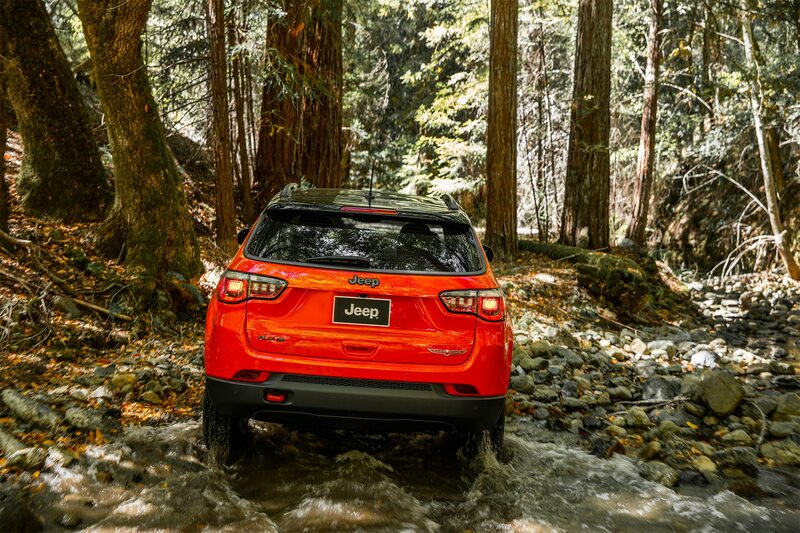 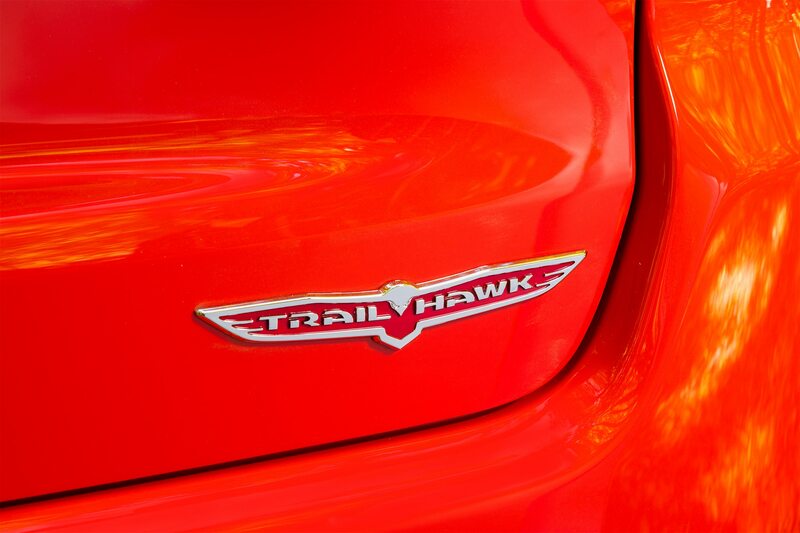 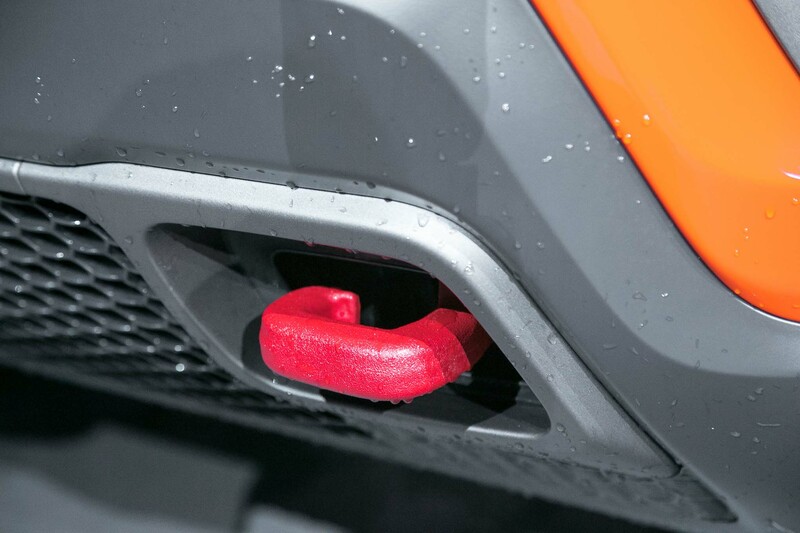 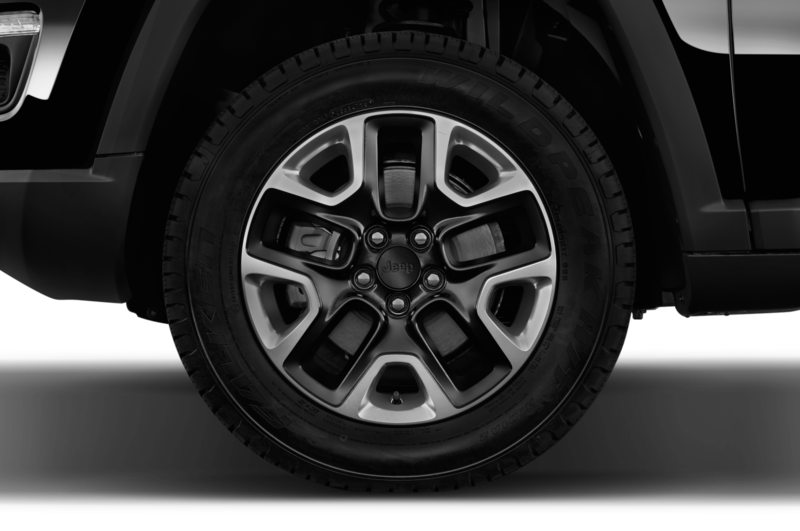 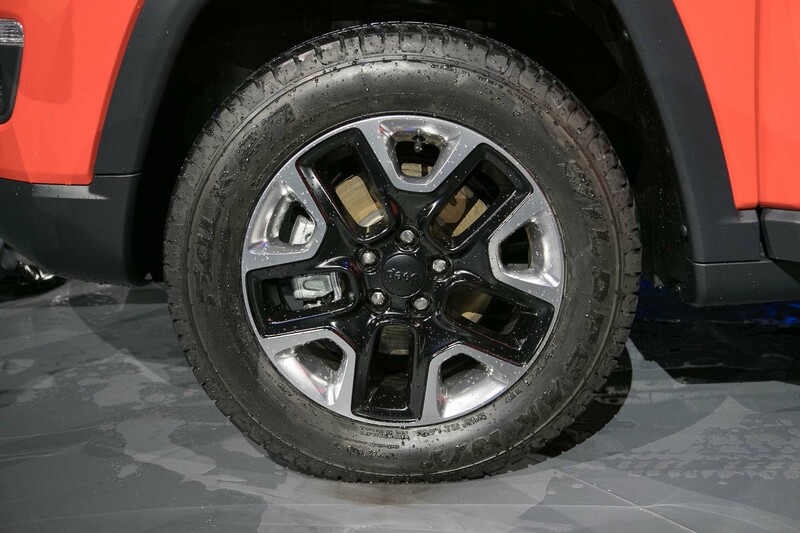 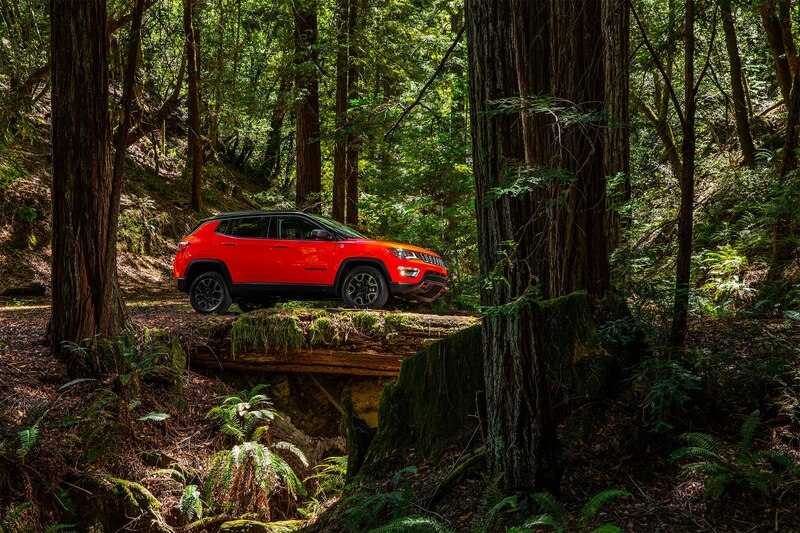 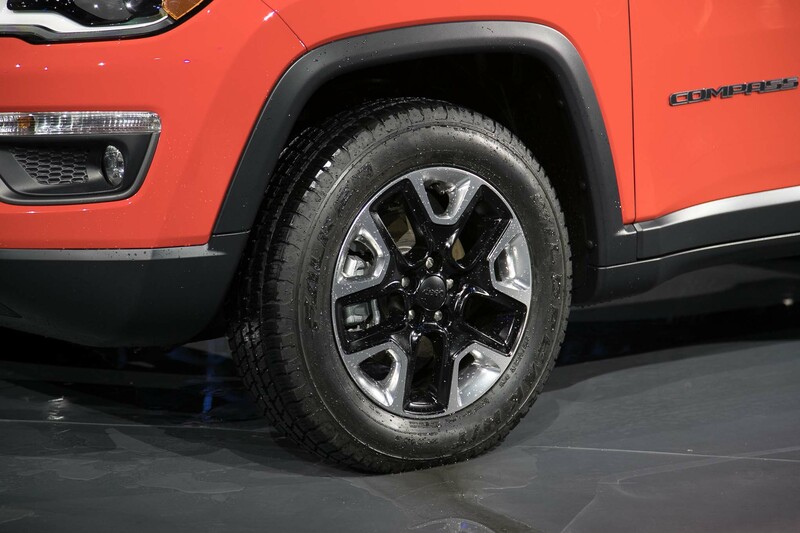 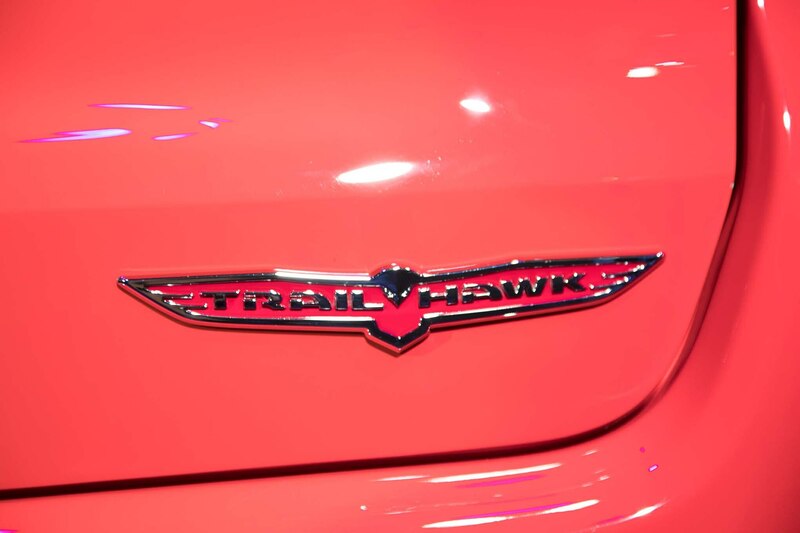 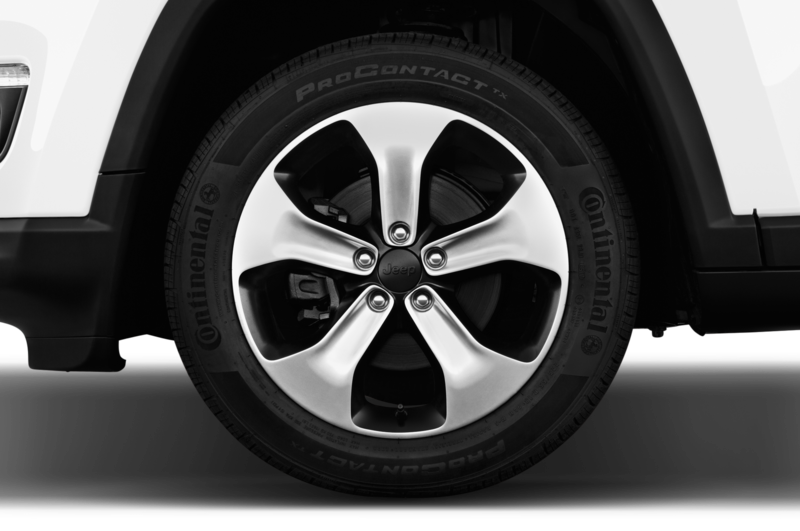 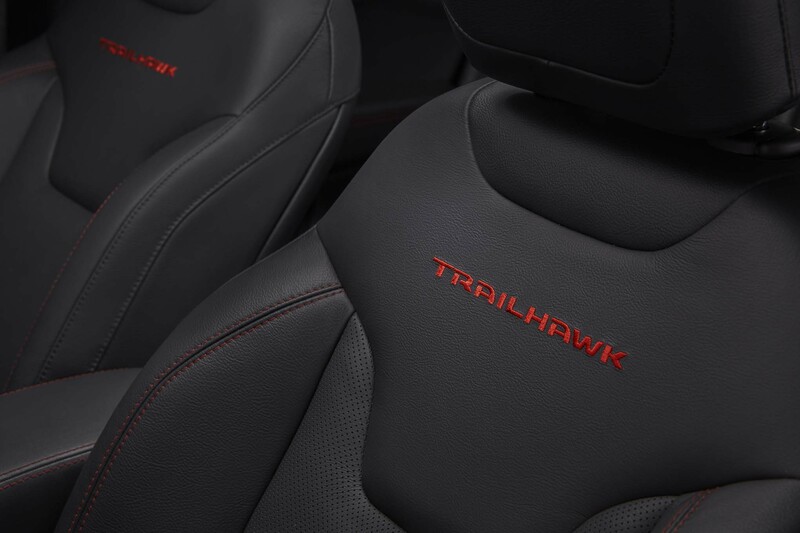 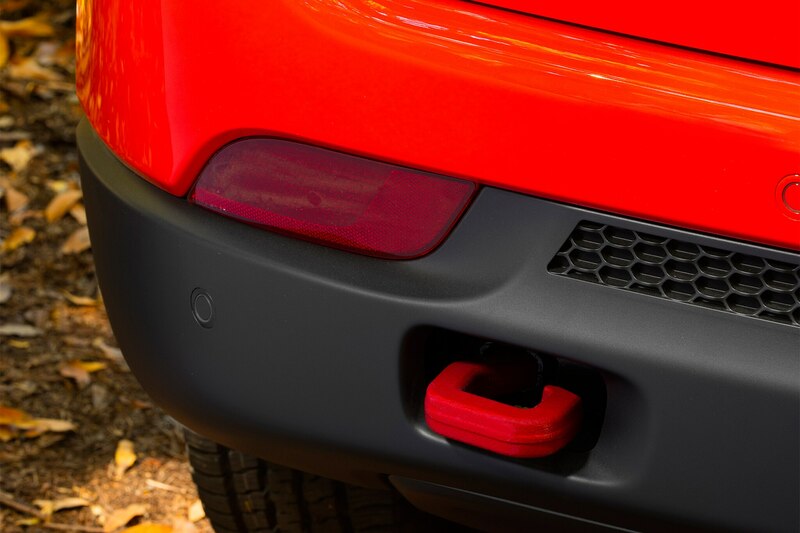 The Trailhawk Compass also can tow up to 2,000 lbs and ford up to 19 inches of water. 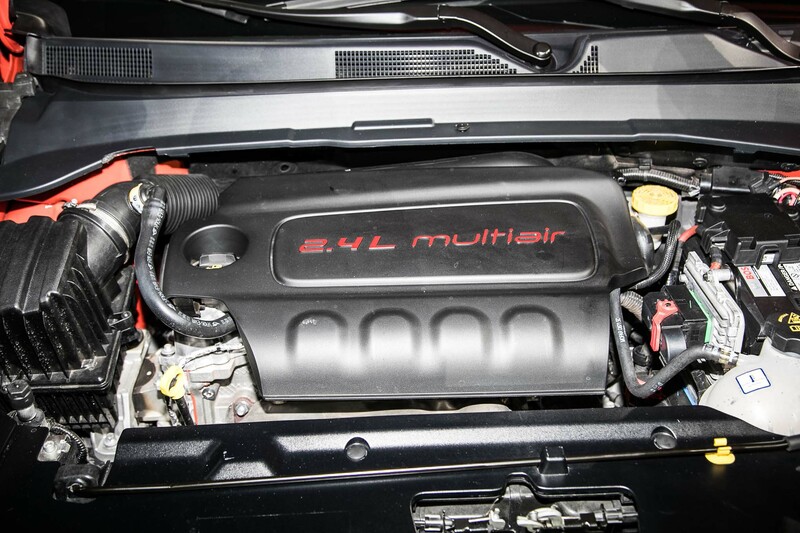 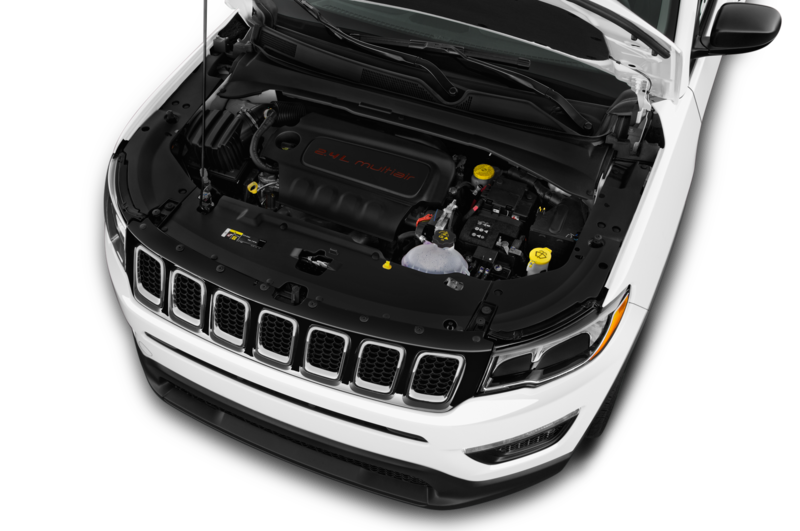 Here in the U.S., consumers will only have one engine option, the 2.4-liter Tigershark I-4. 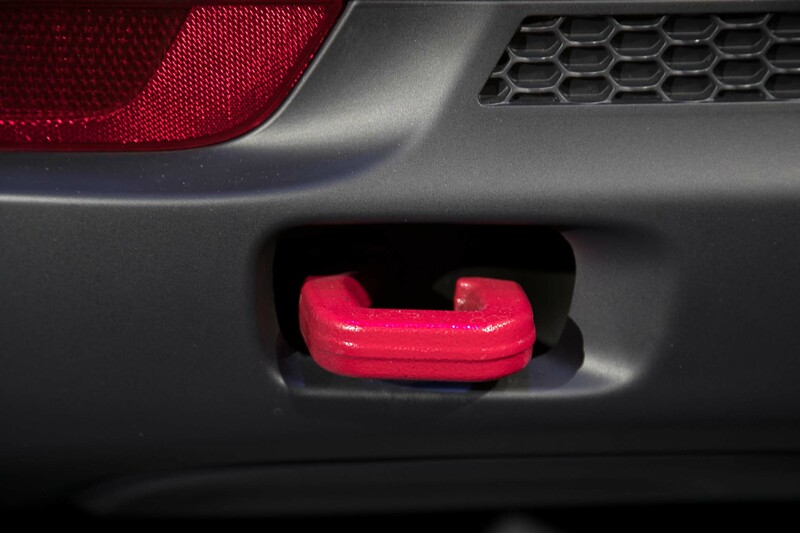 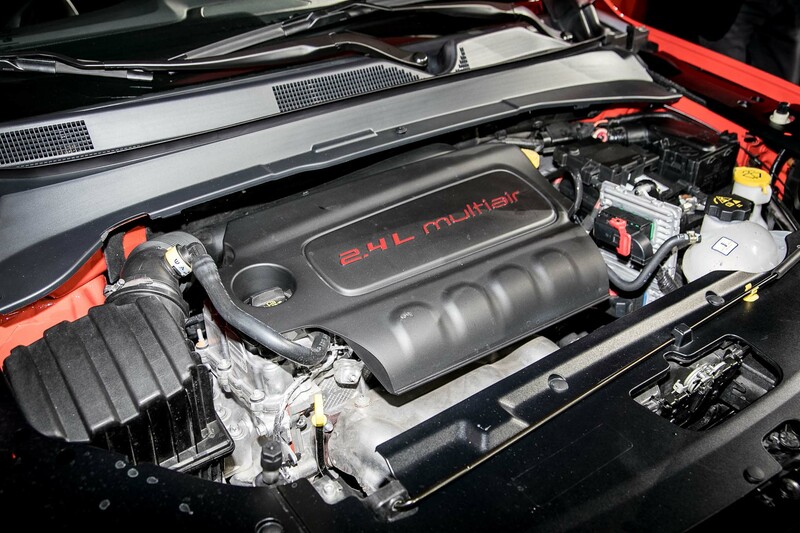 In this application, it produces 180 horsepower and 175 lb-ft of torque. 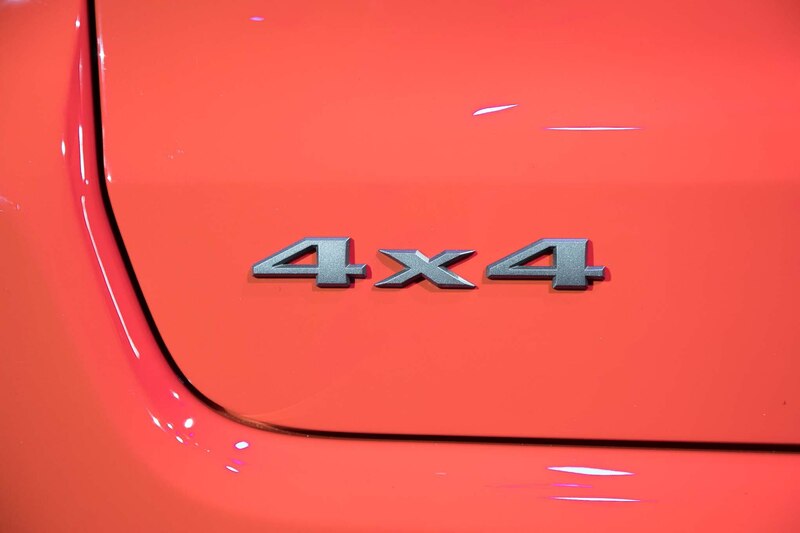 In addition to the 4×4 systems, buyers can also get a more economical 4×2 layout. 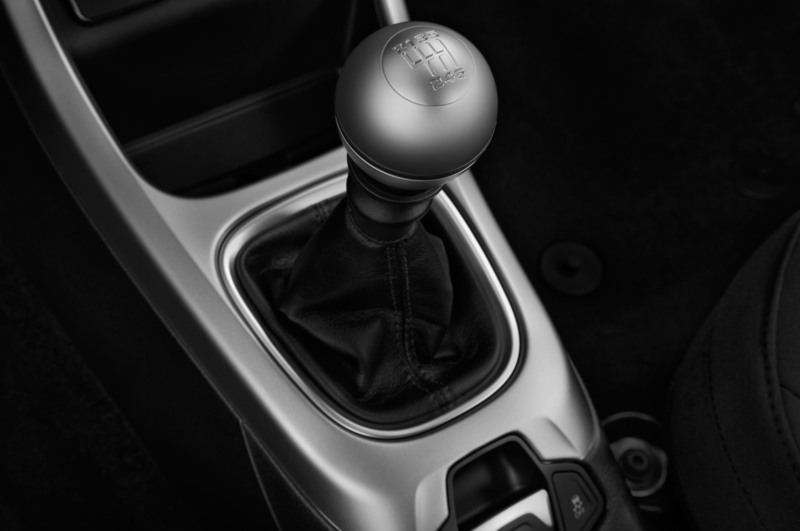 A nine-speed automatic comes on 4×4 models while 4×2 models make do with a six-speed auto. 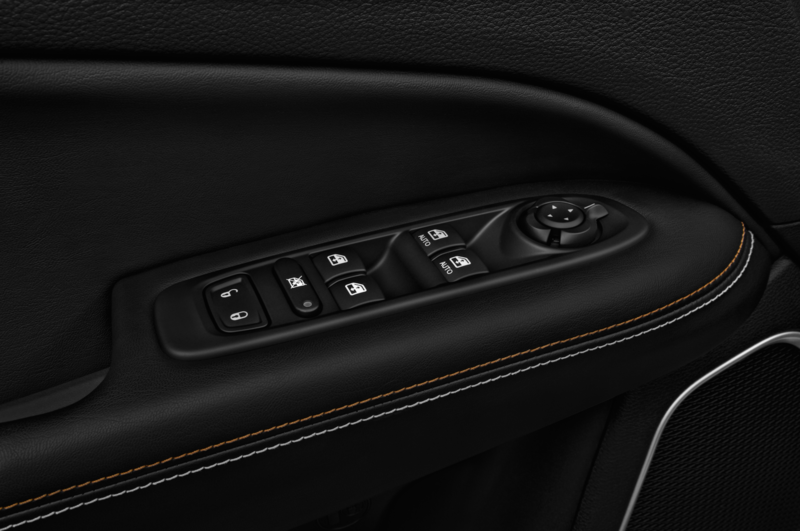 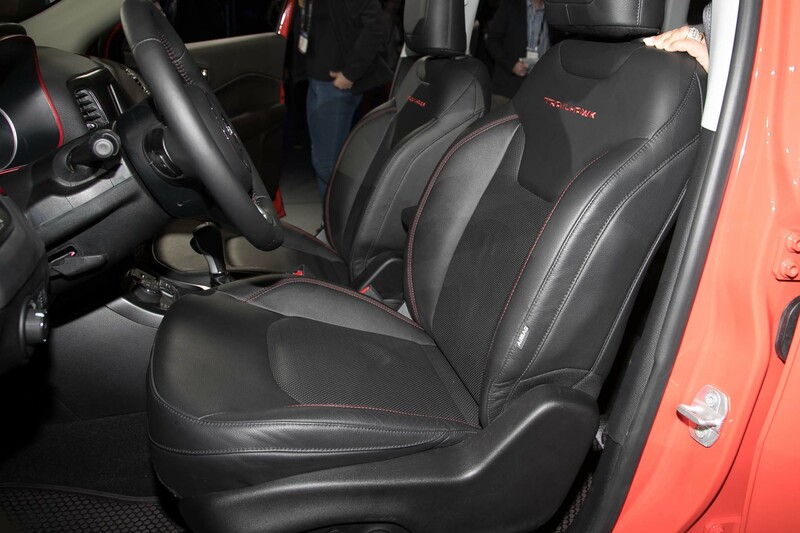 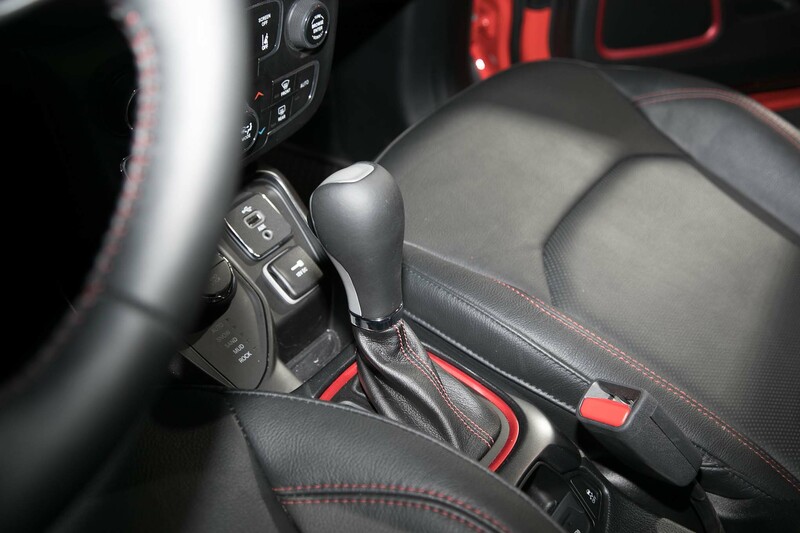 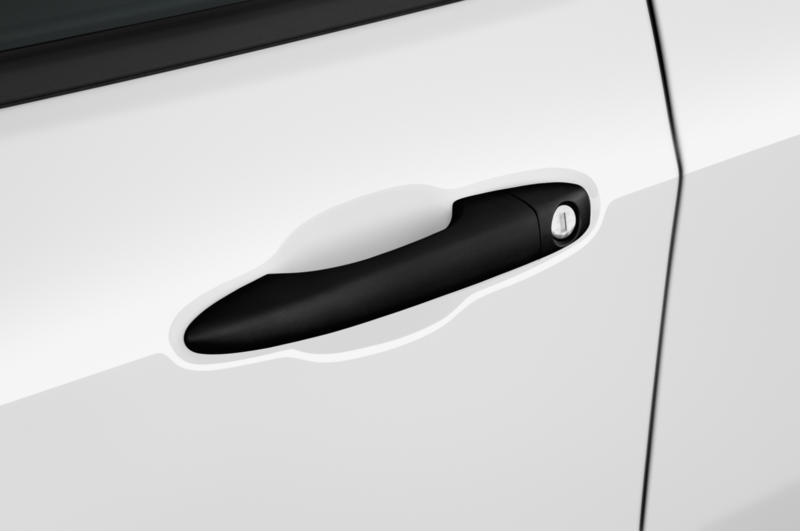 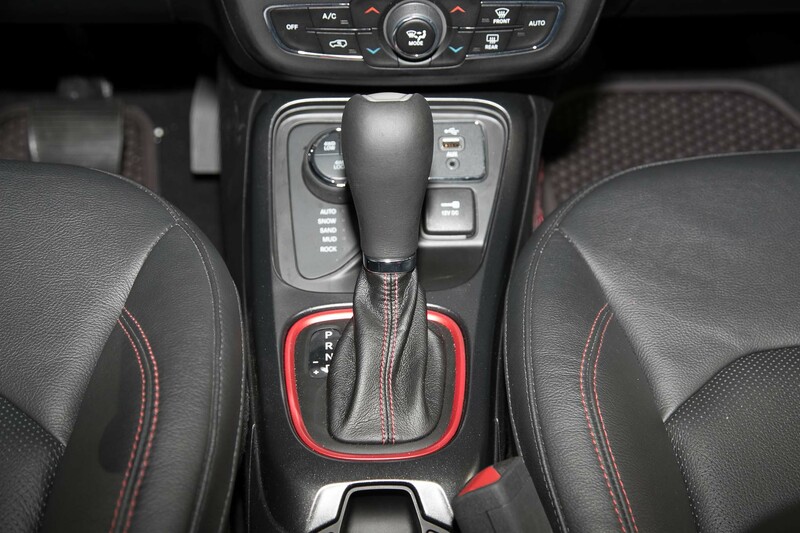 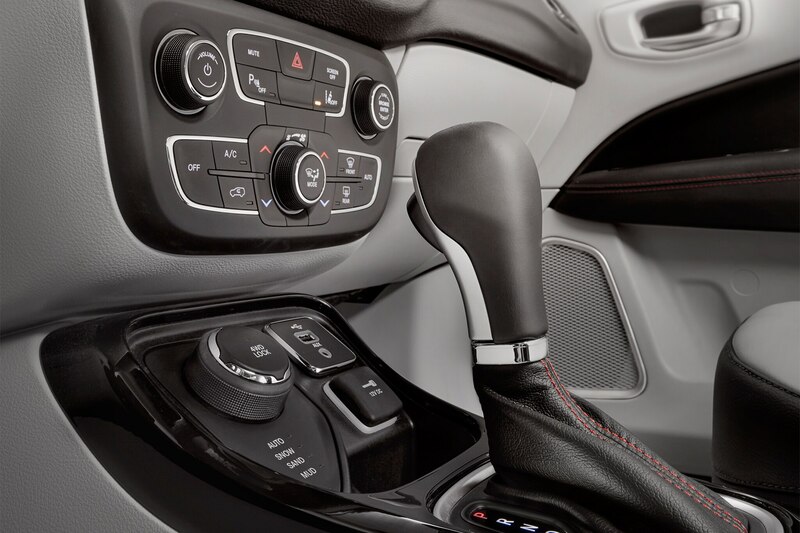 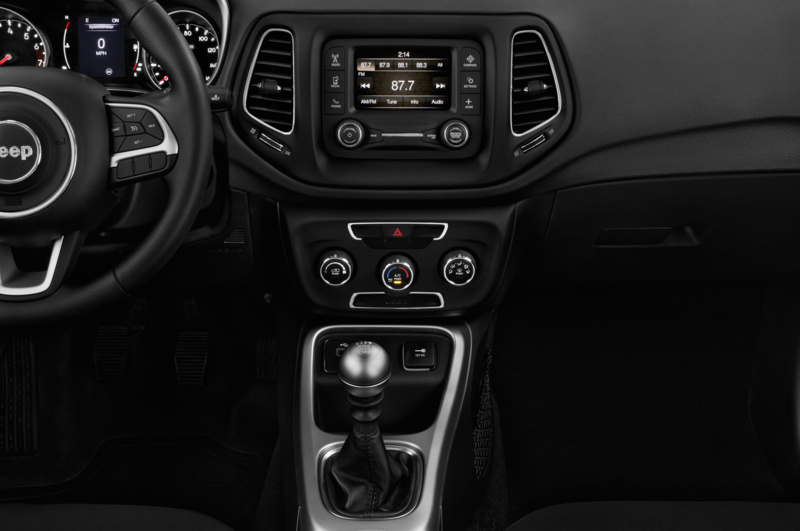 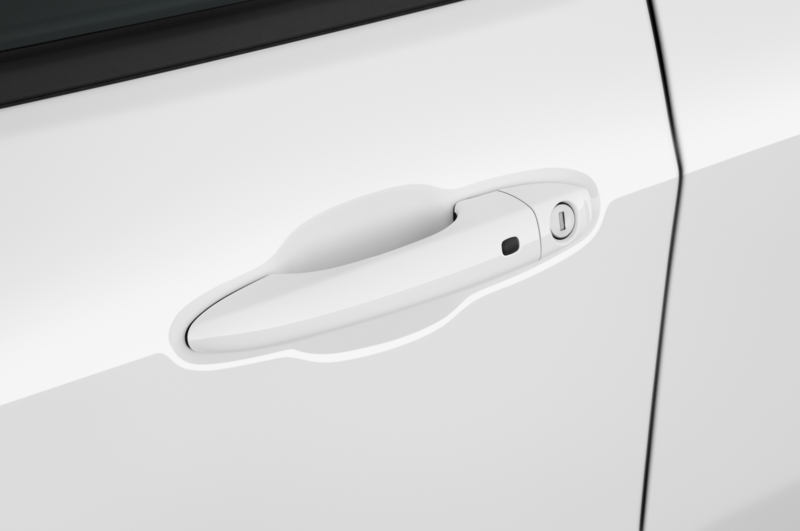 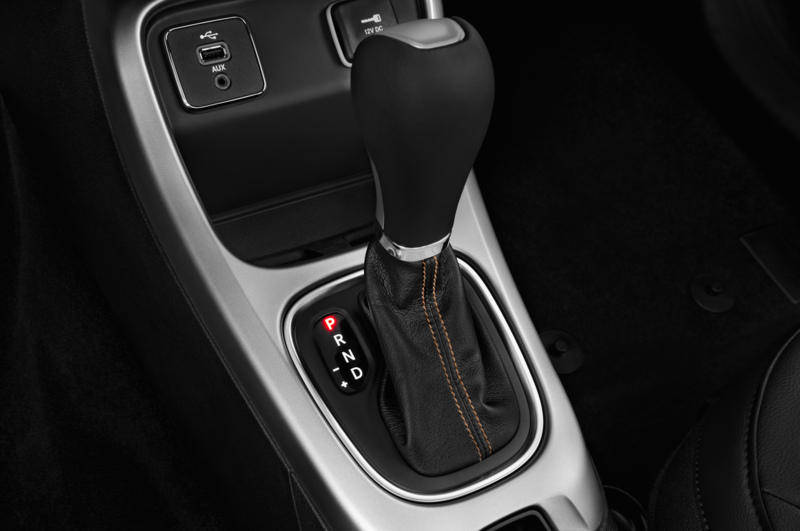 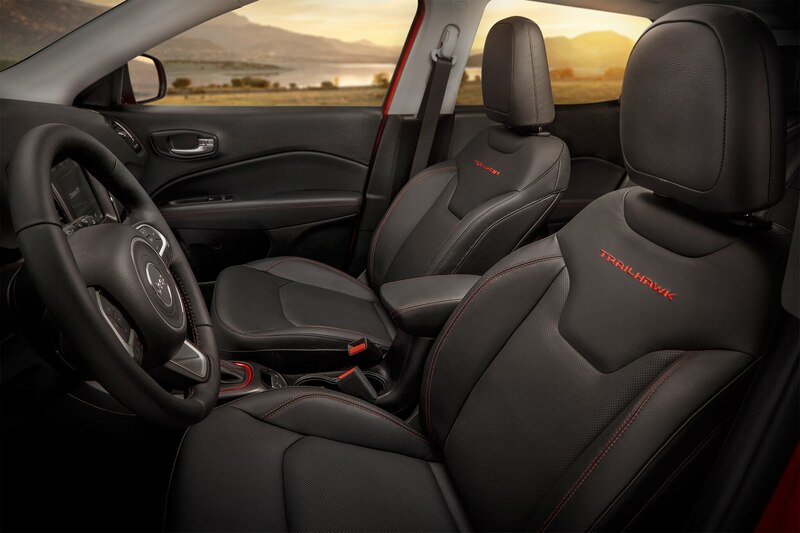 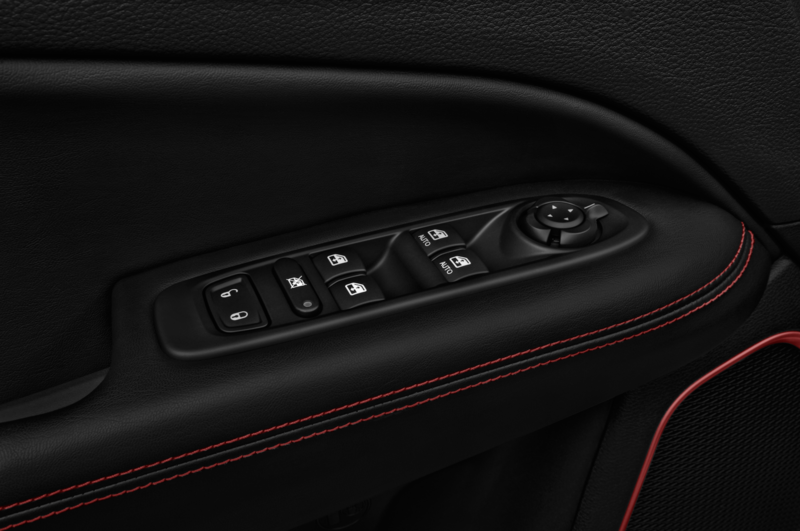 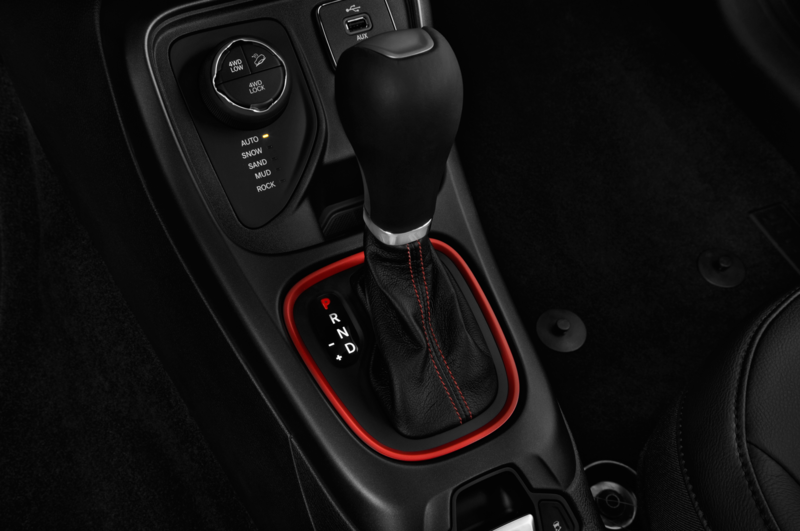 Additionally, either drive configuration can be had with a six-speed manual instead. 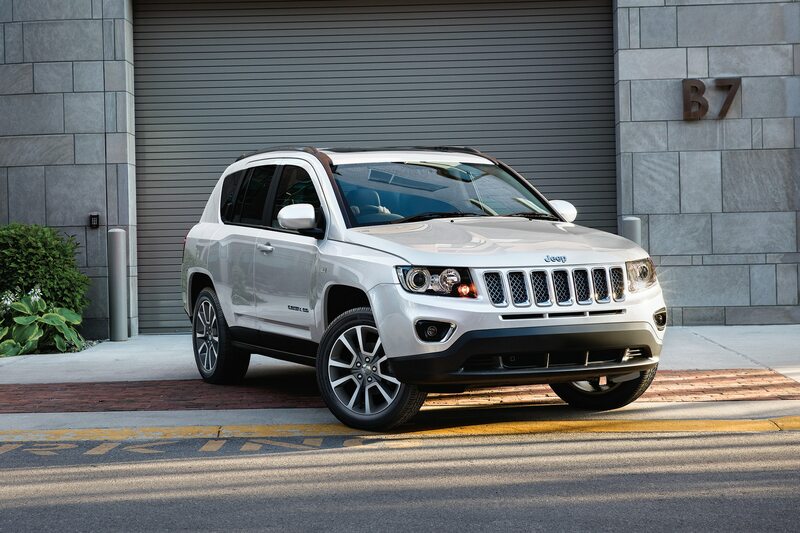 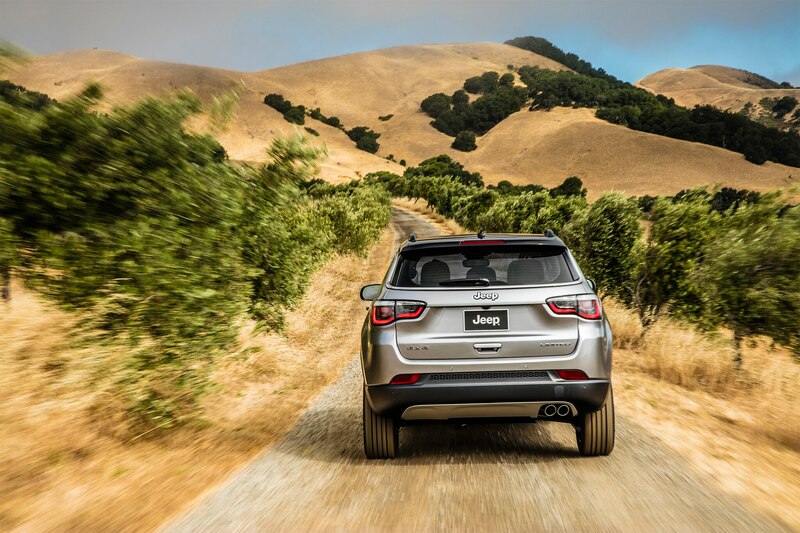 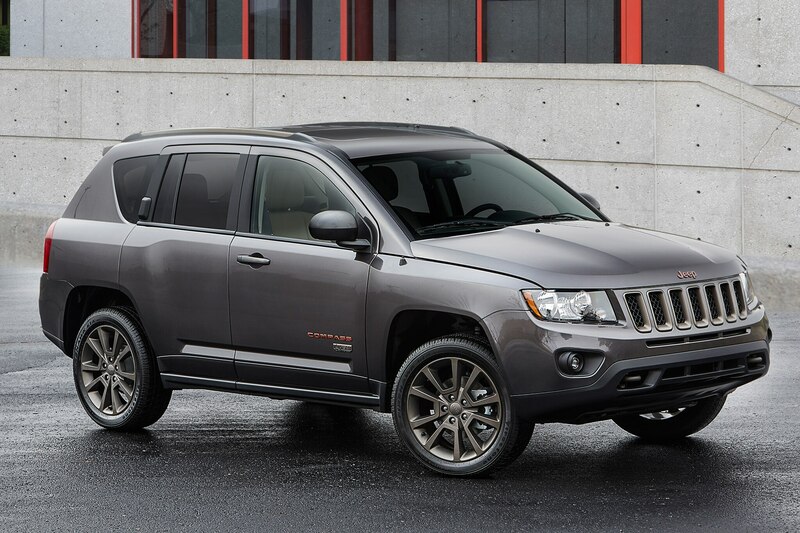 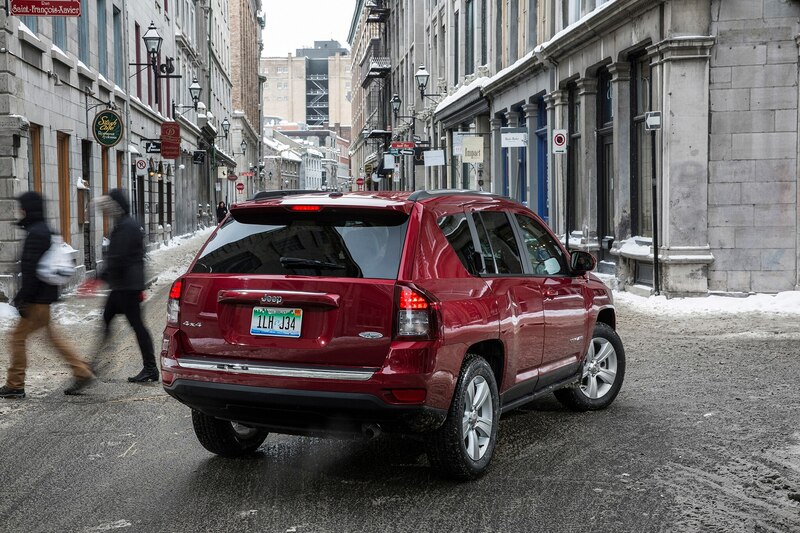 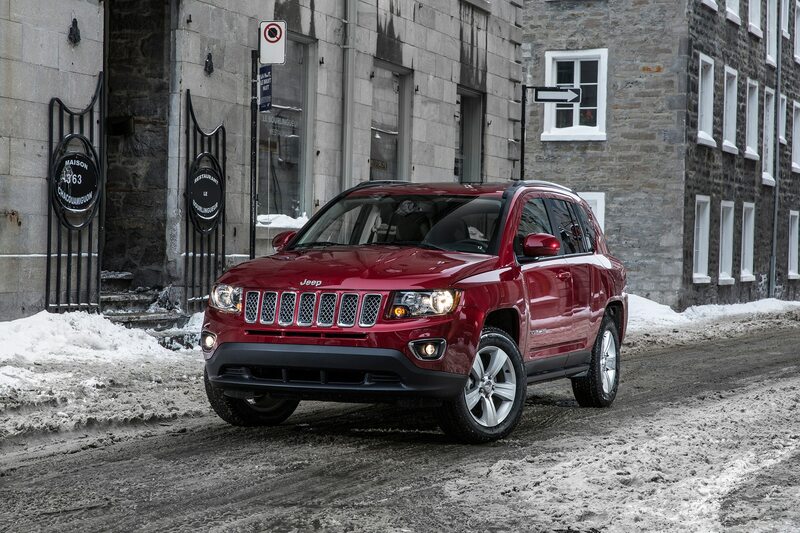 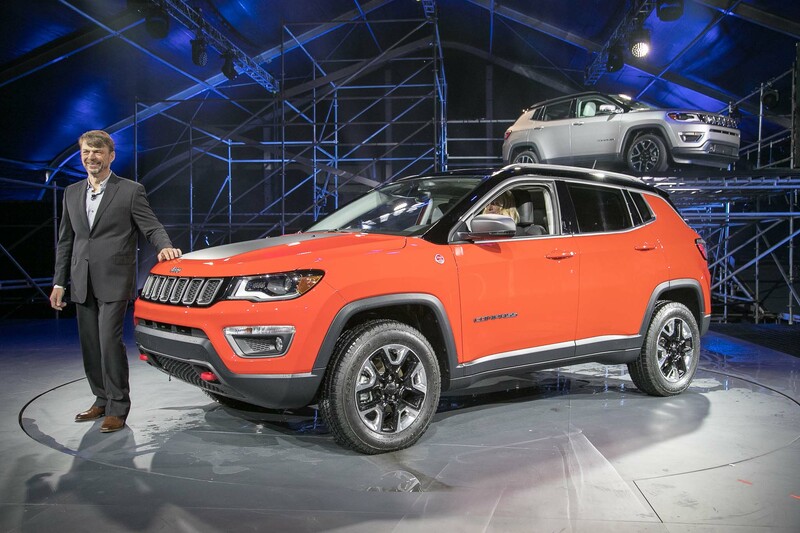 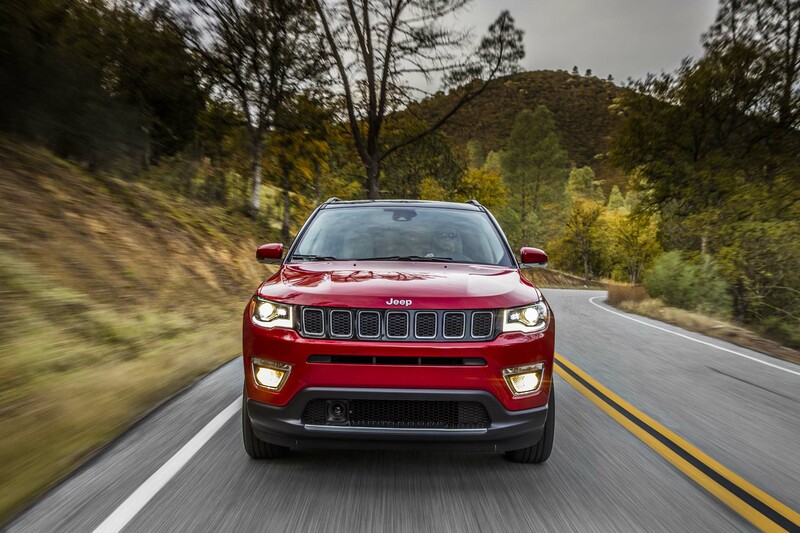 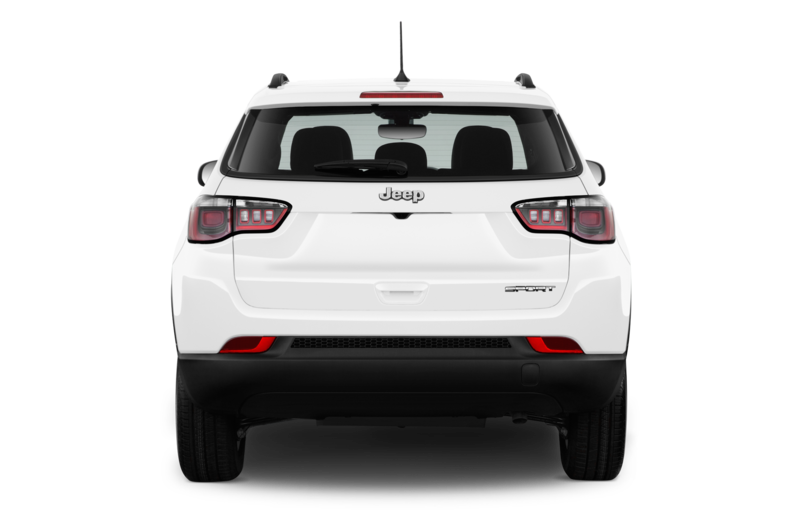 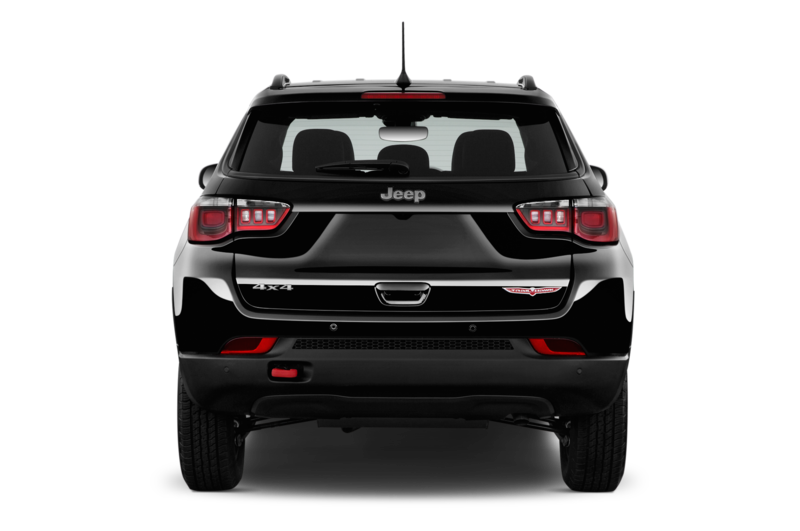 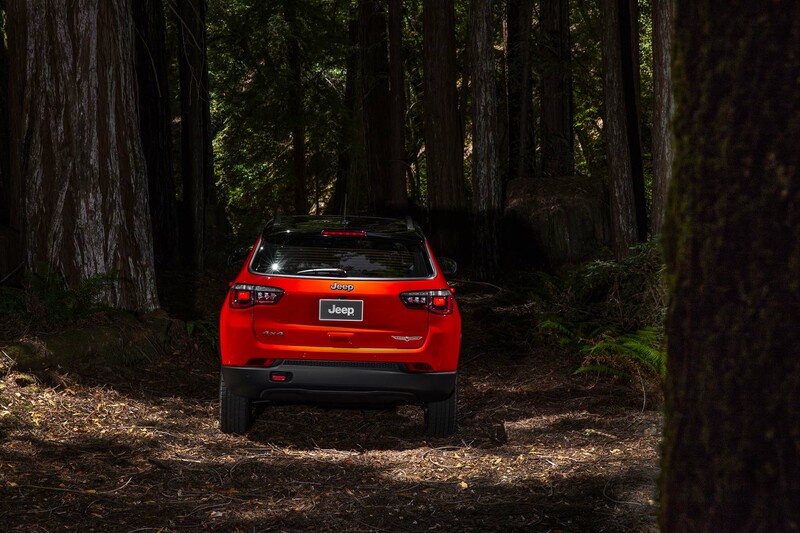 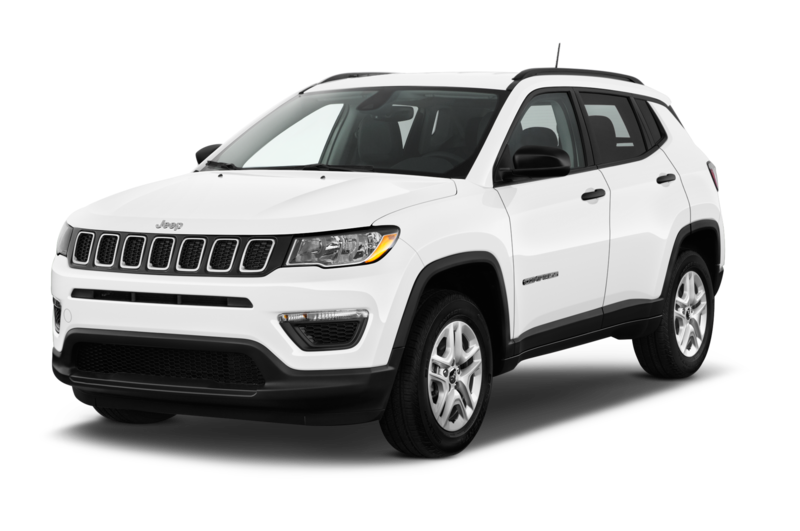 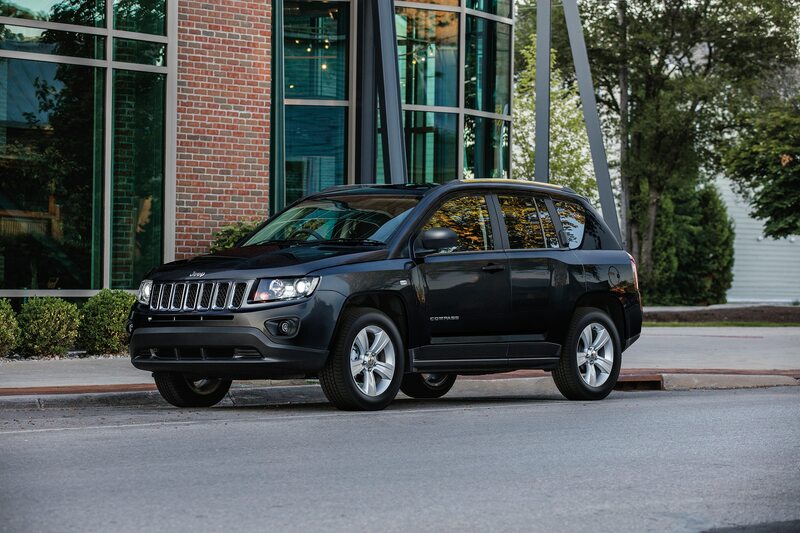 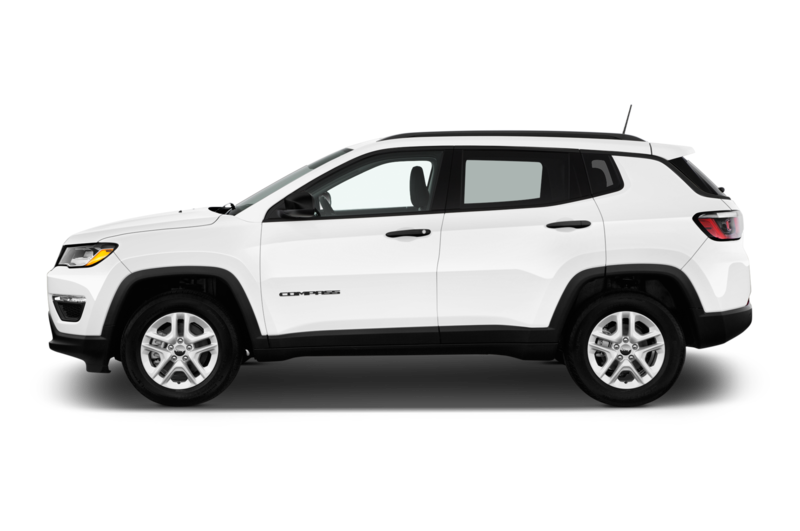 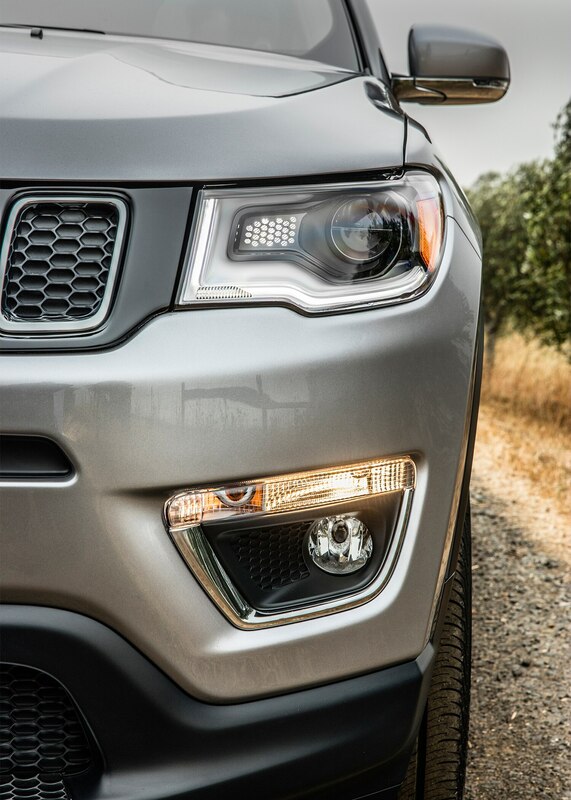 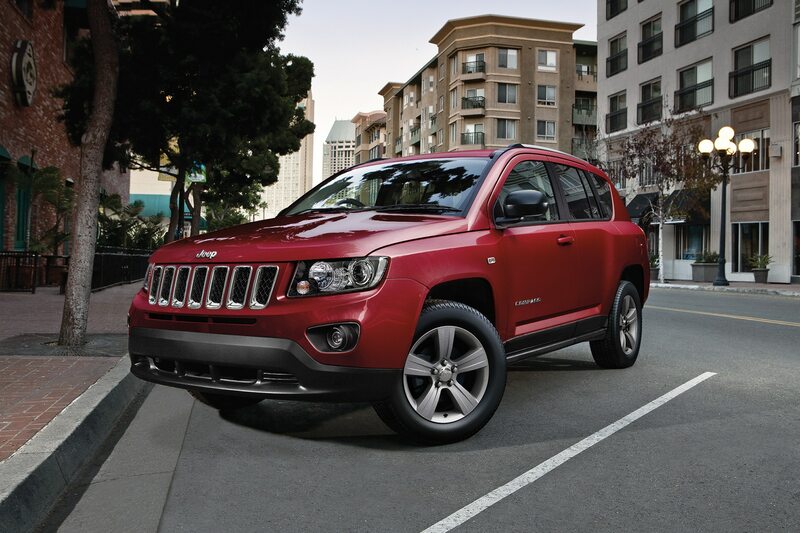 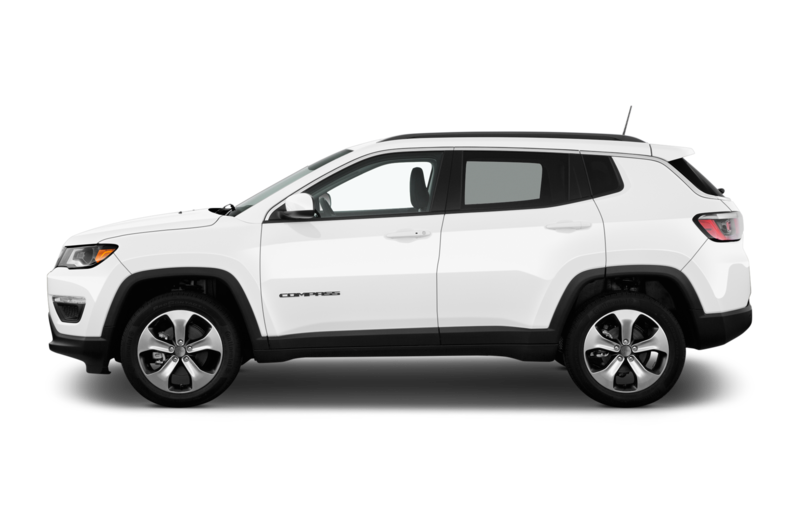 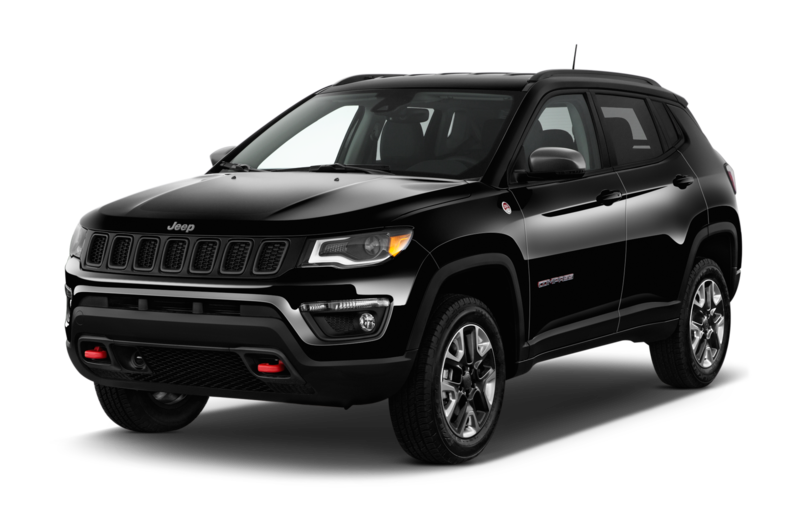 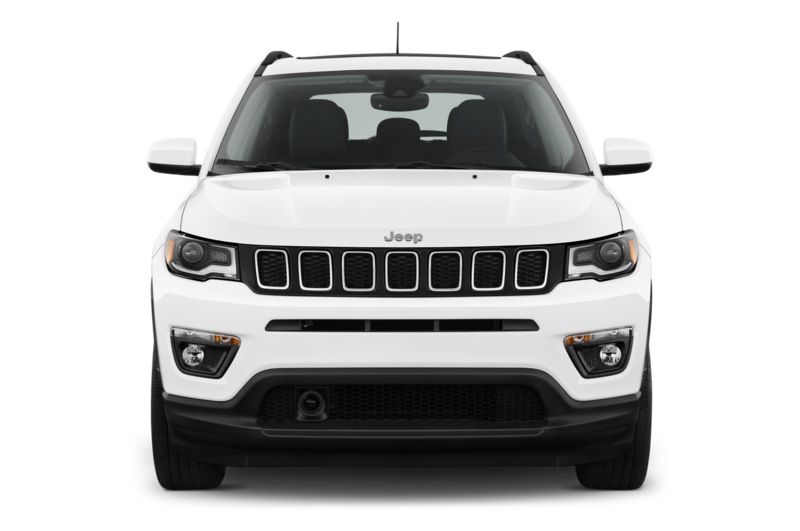 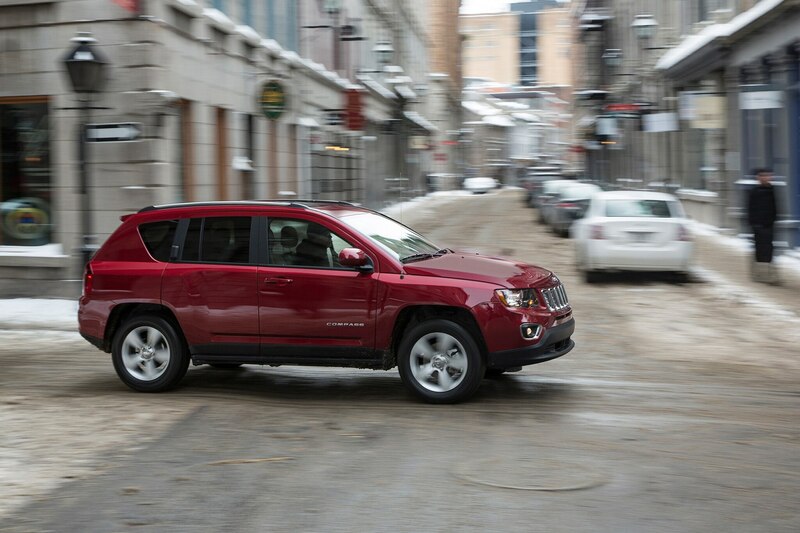 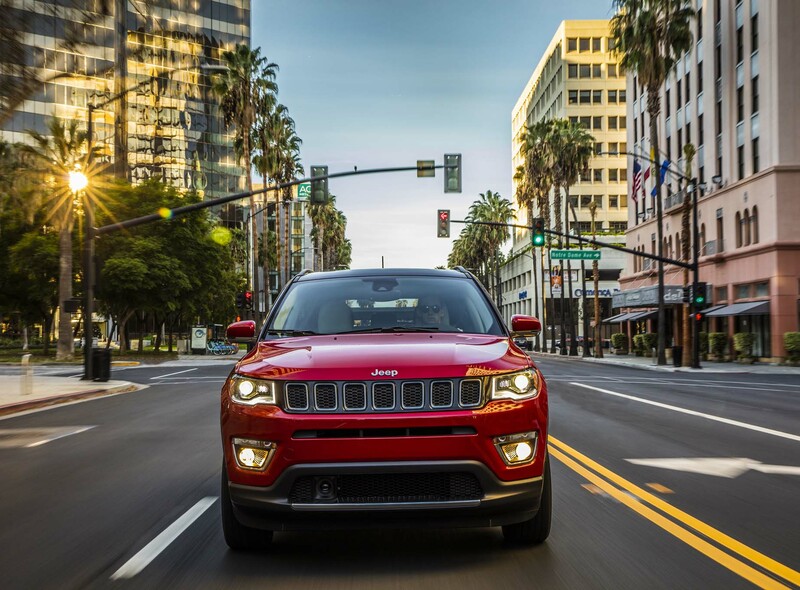 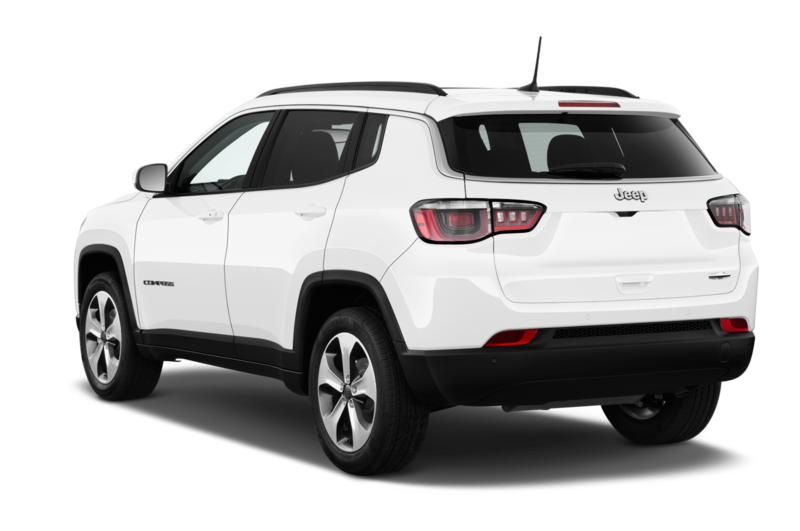 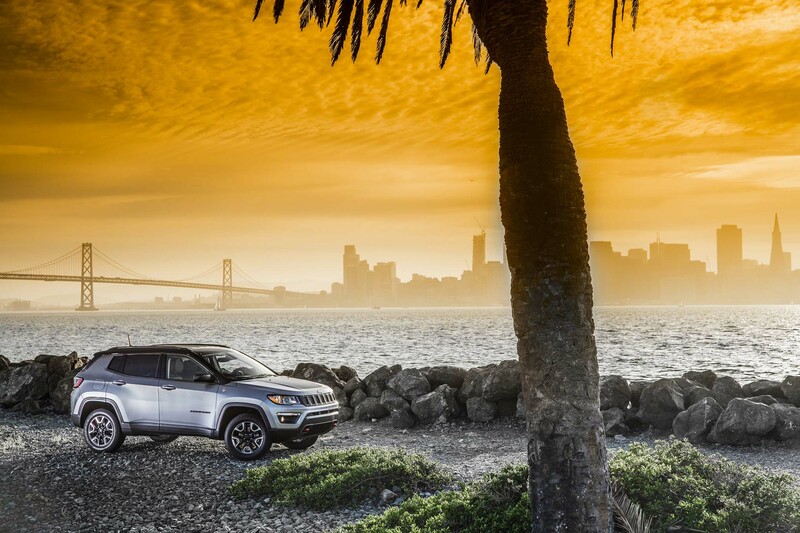 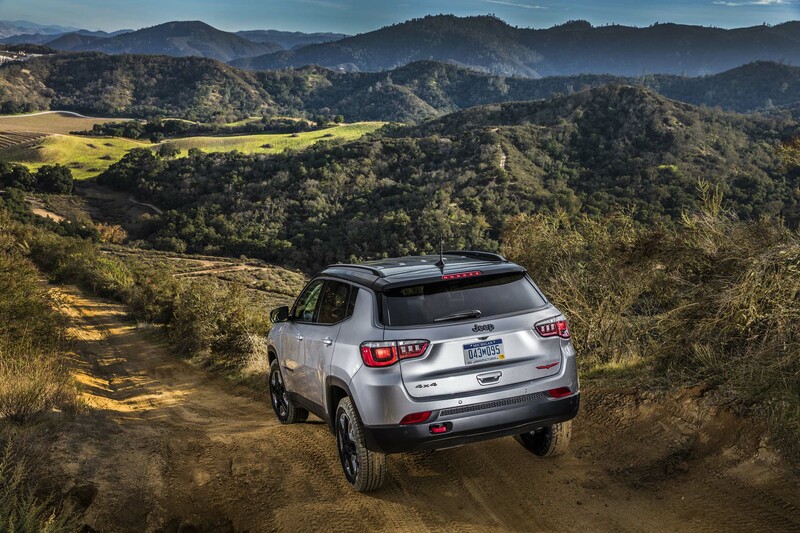 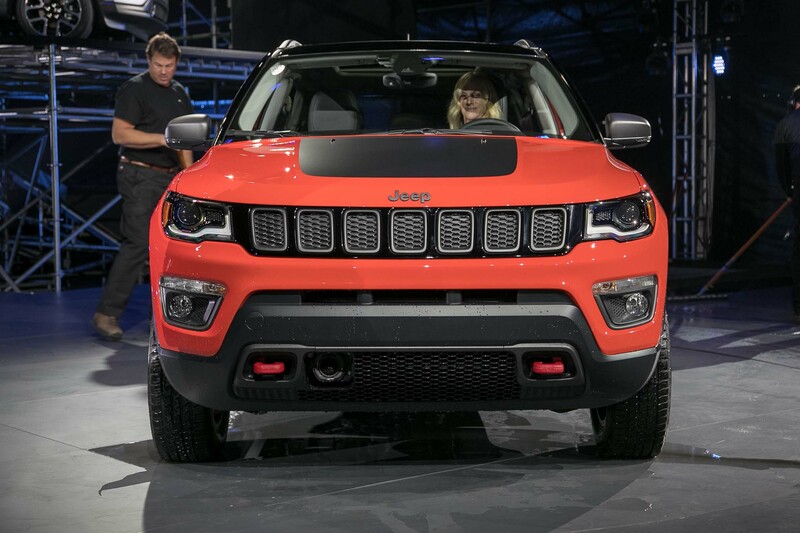 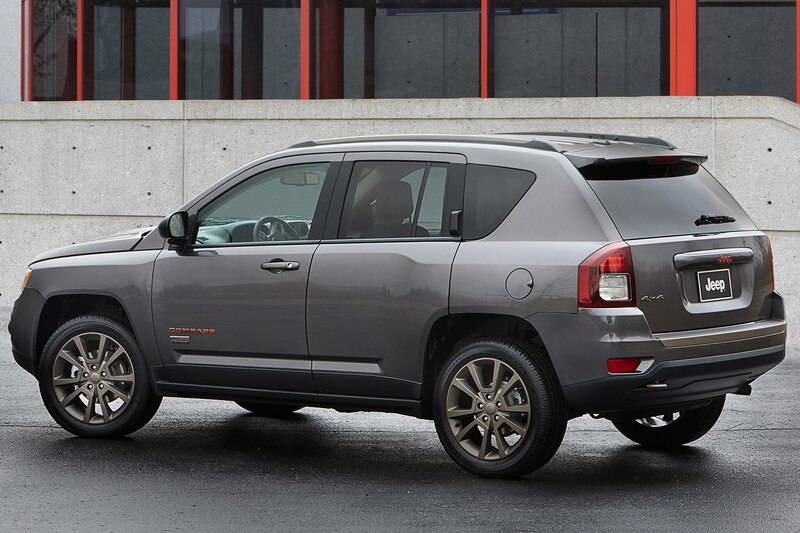 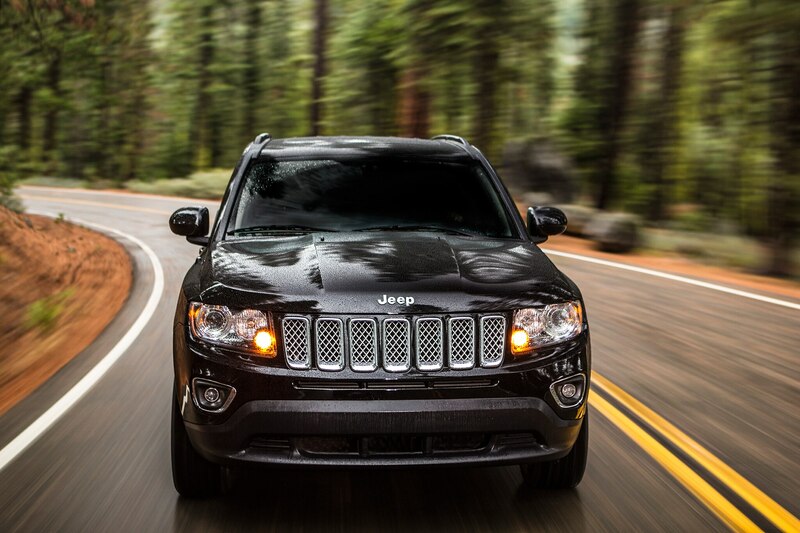 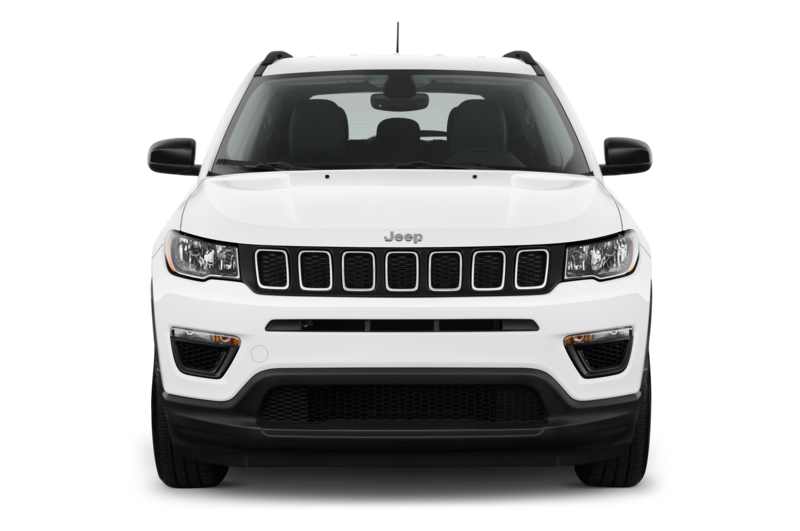 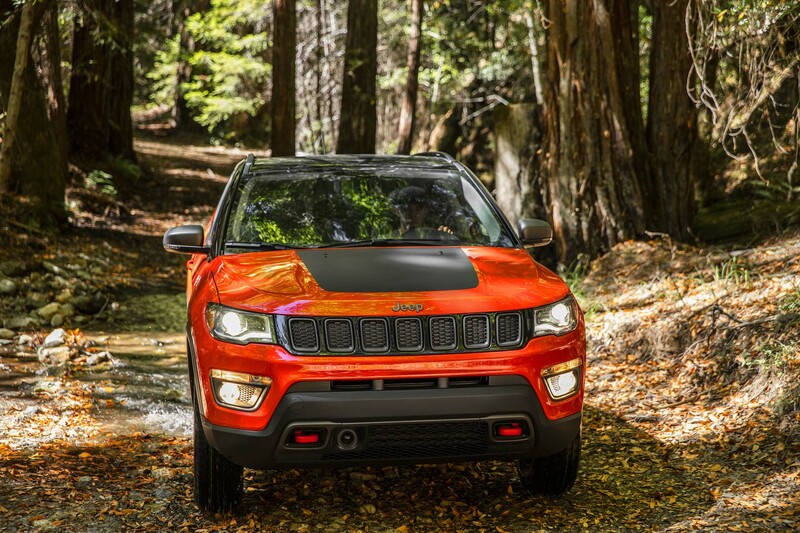 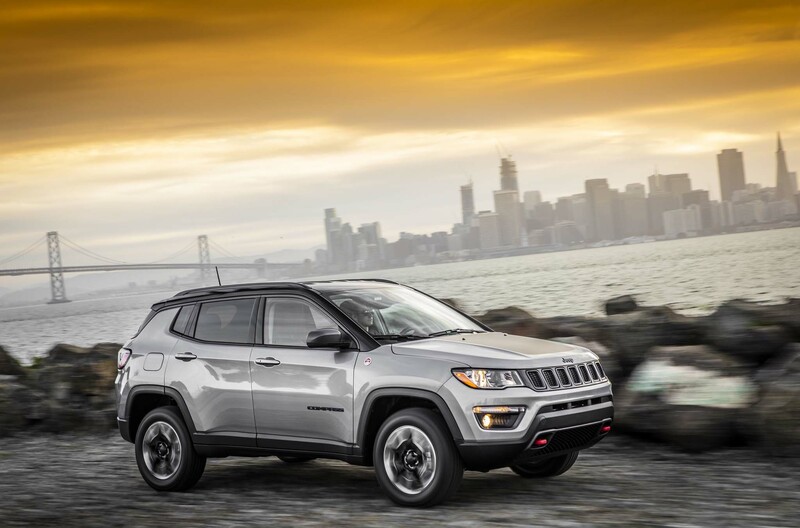 Unlike the Renegade, which has a somewhat divisive exterior, the Jeep Compass looks like a miniature Grand Cherokee. 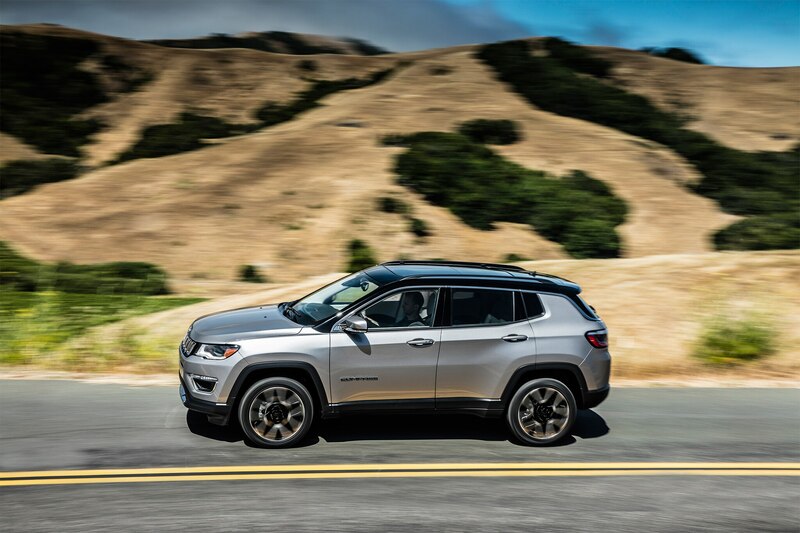 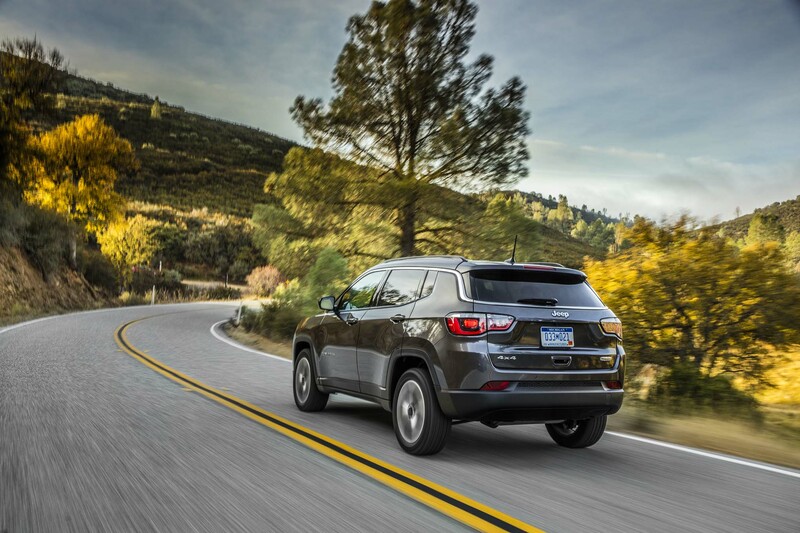 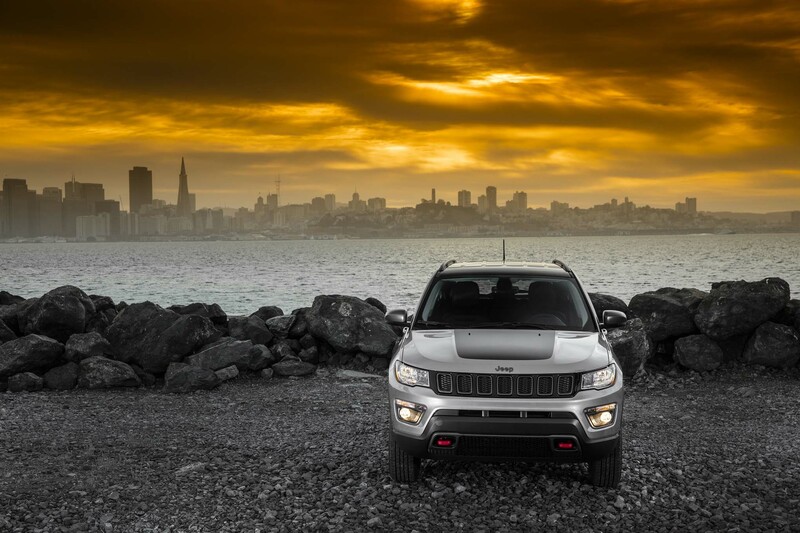 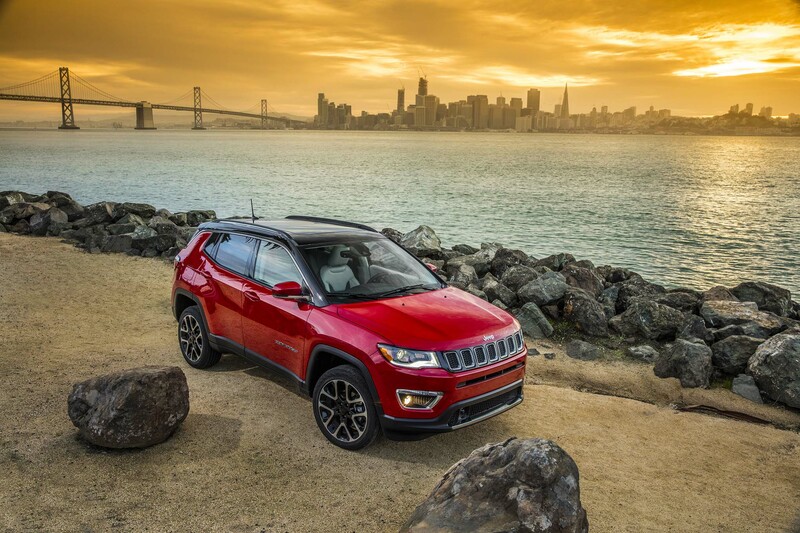 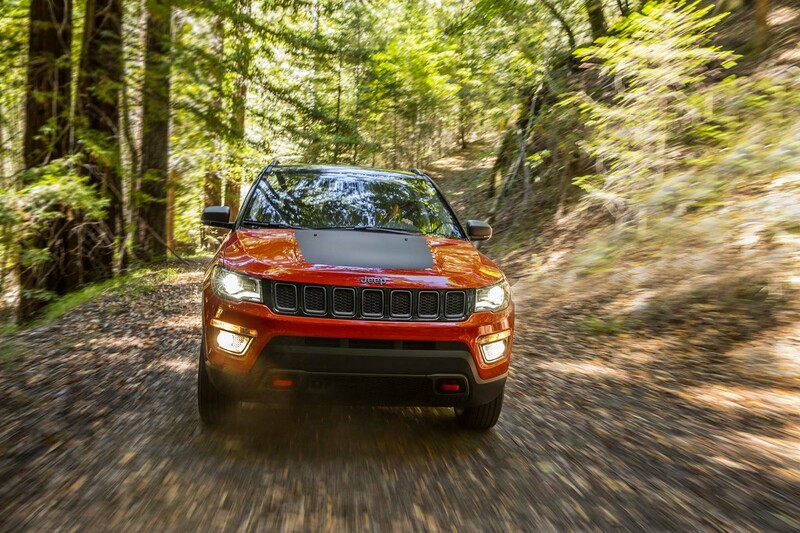 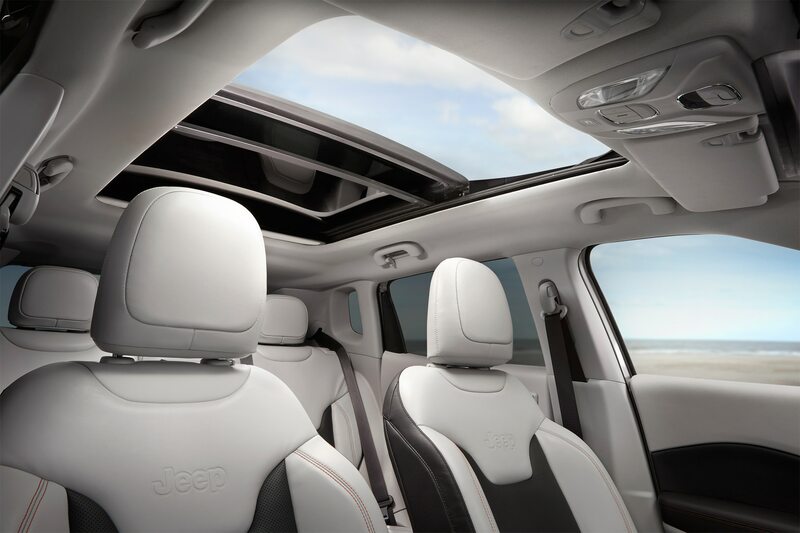 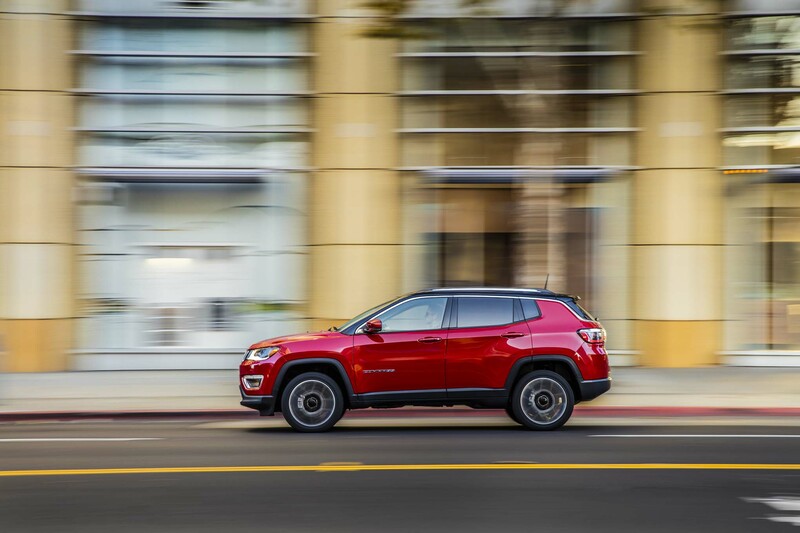 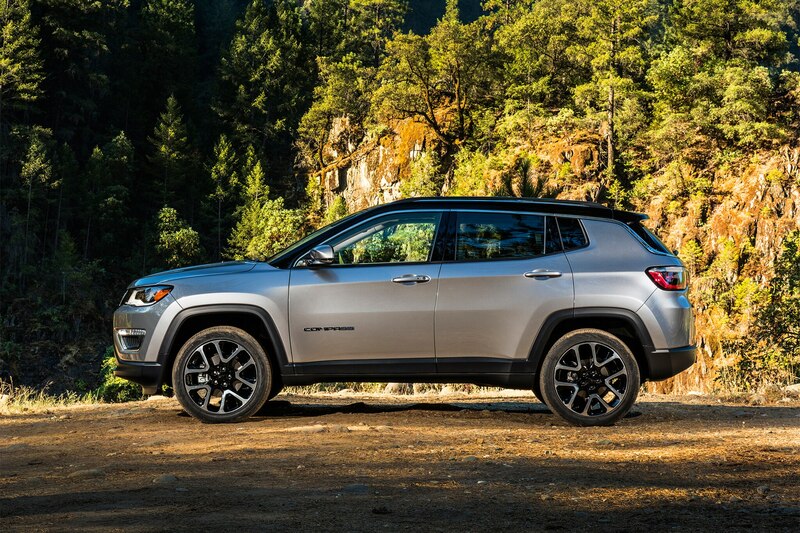 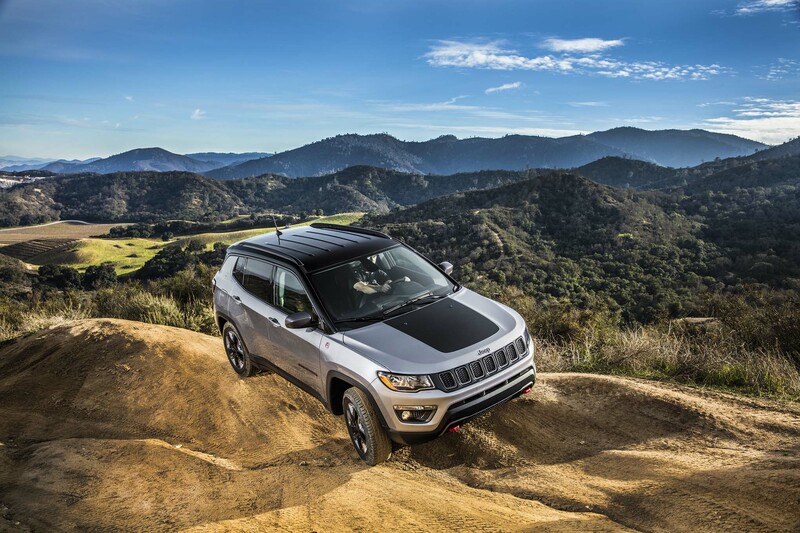 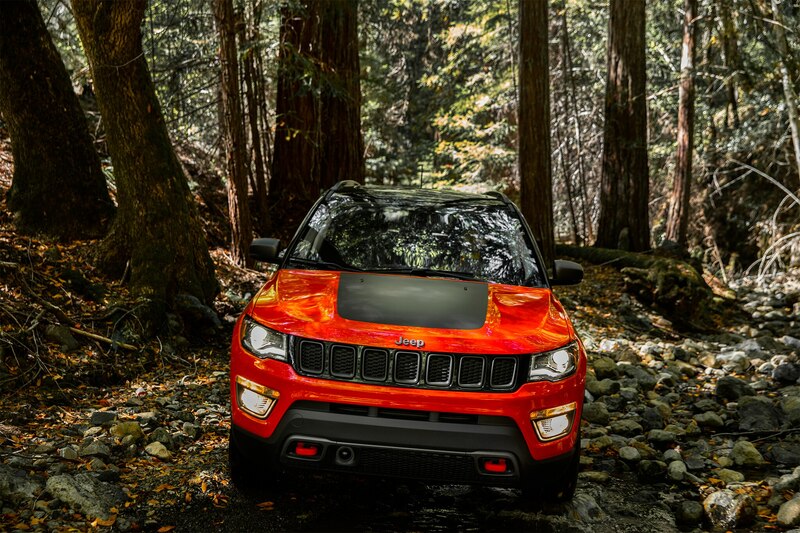 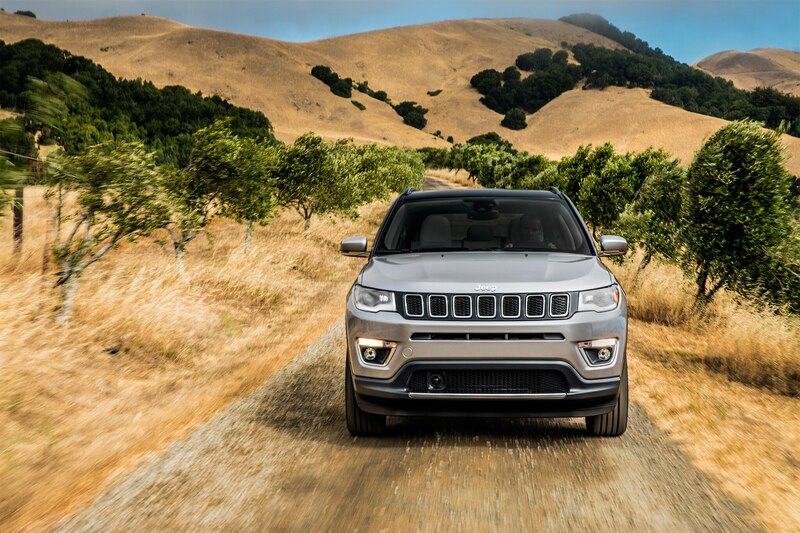 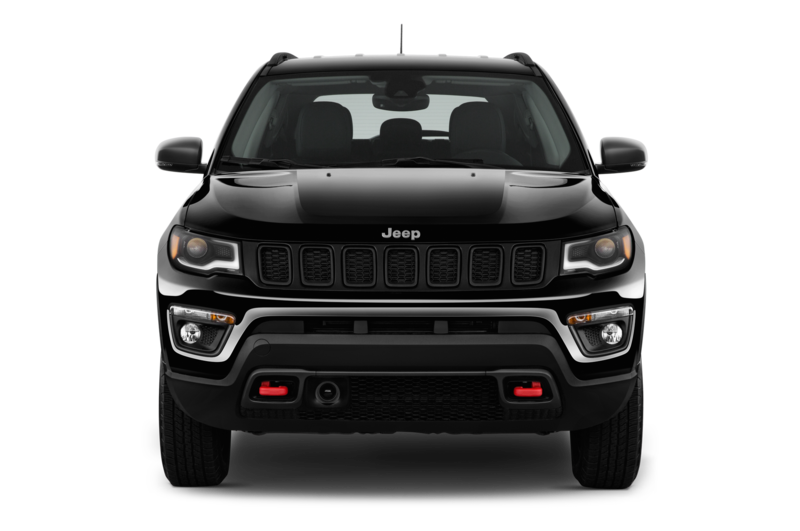 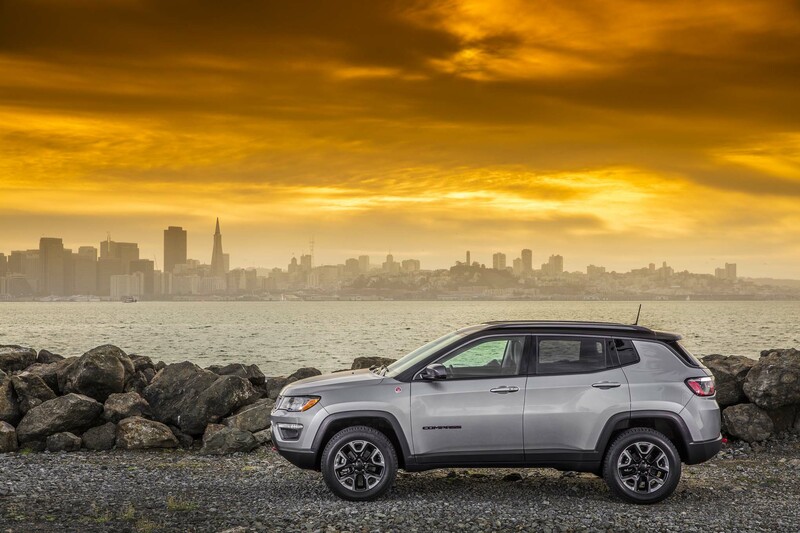 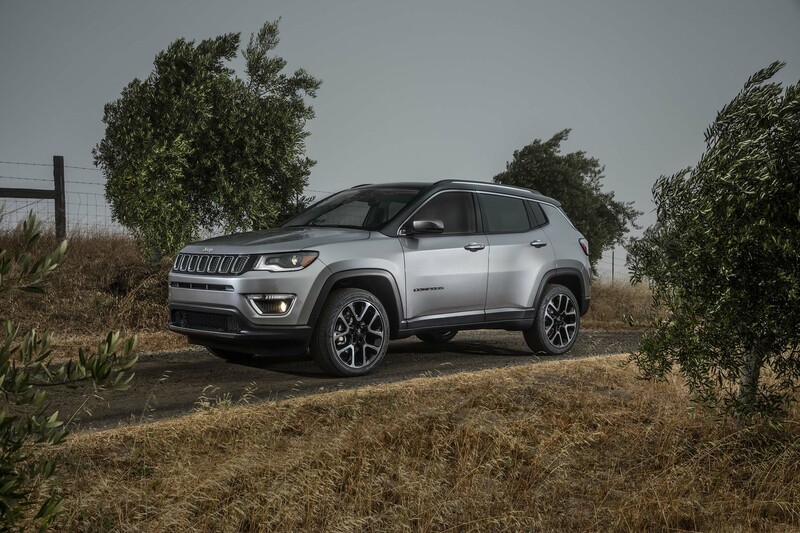 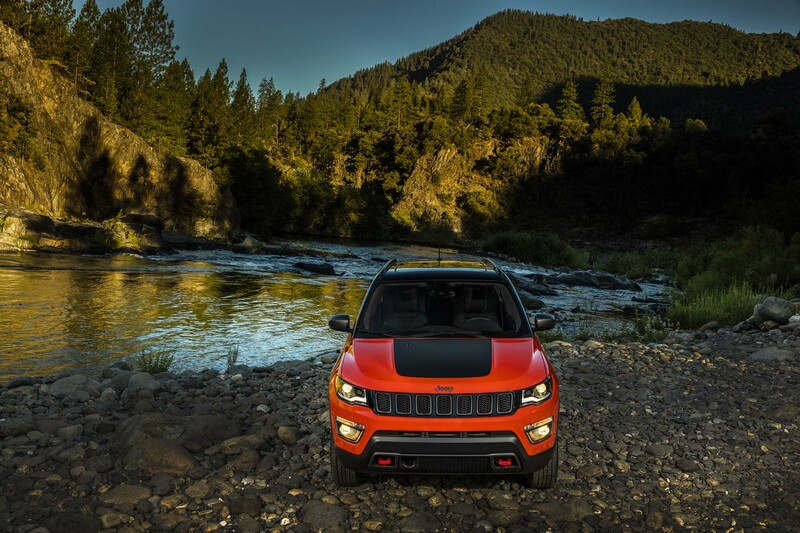 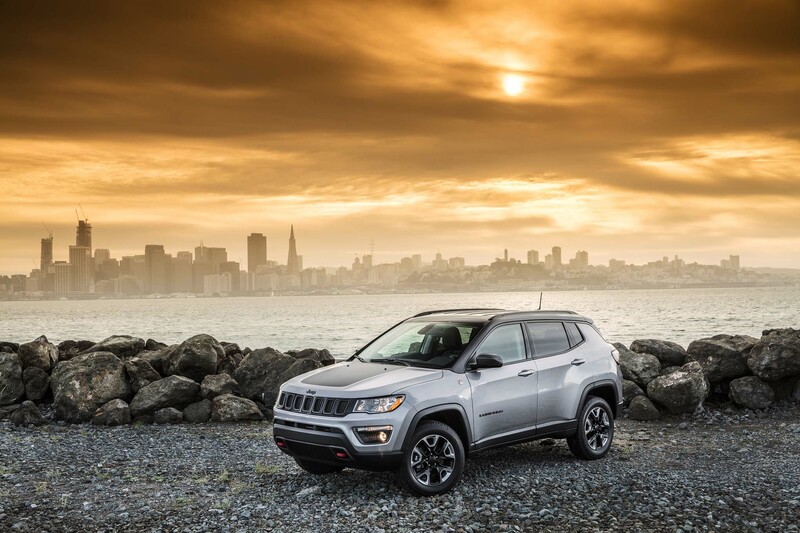 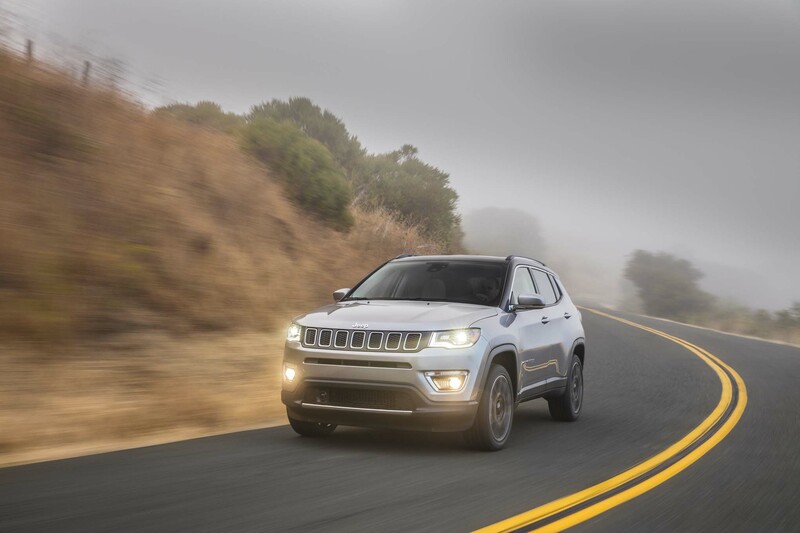 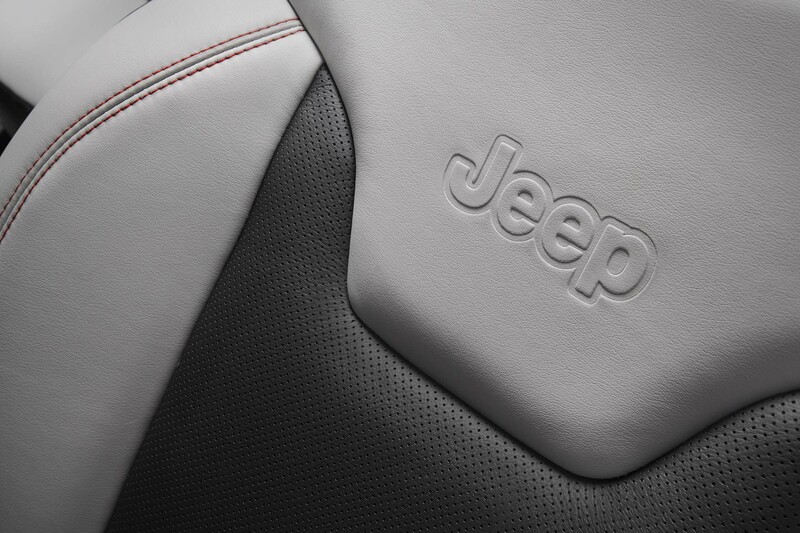 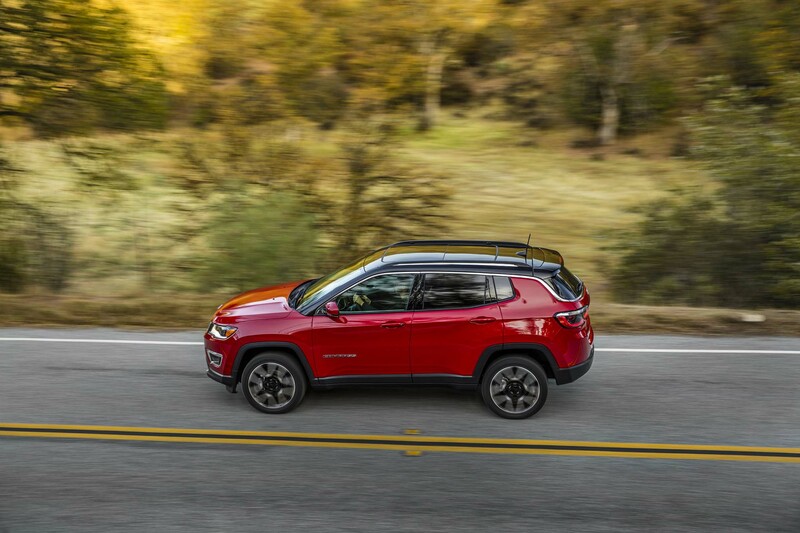 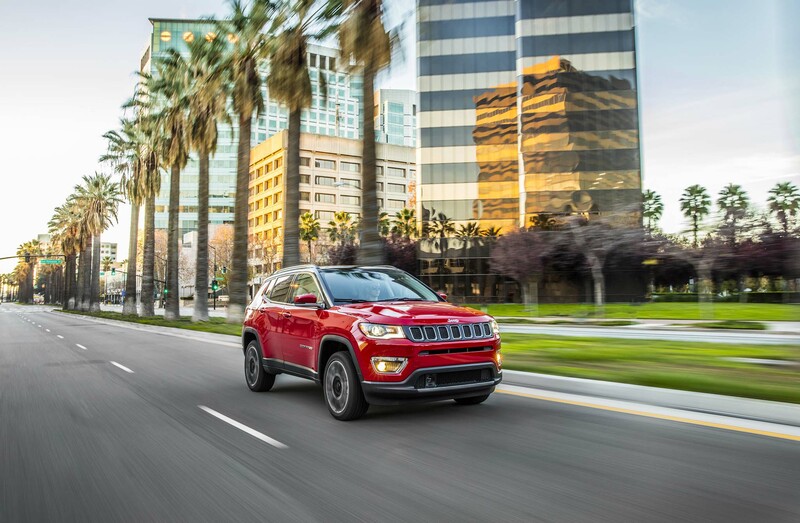 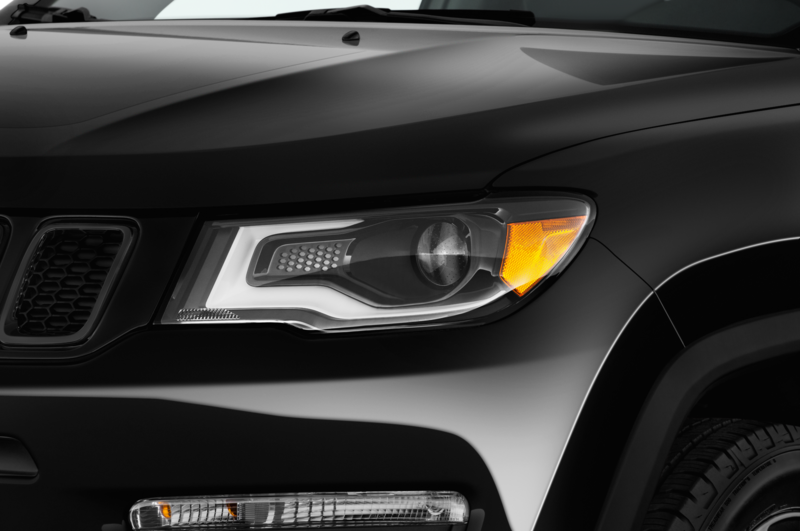 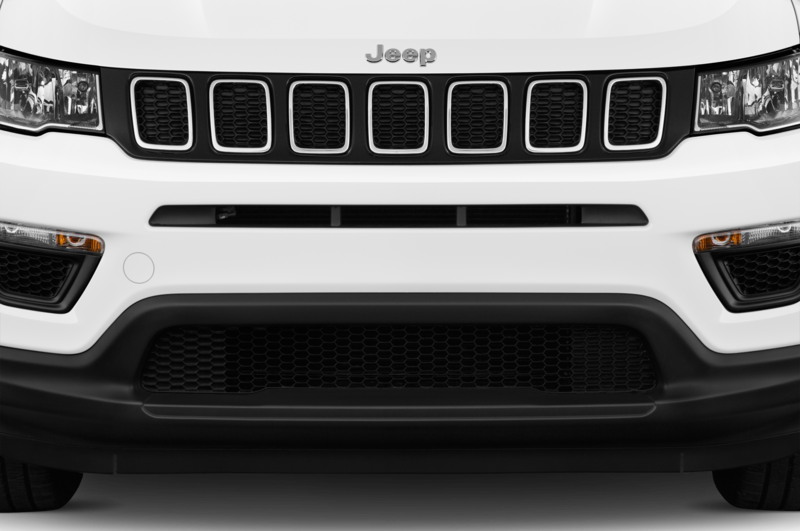 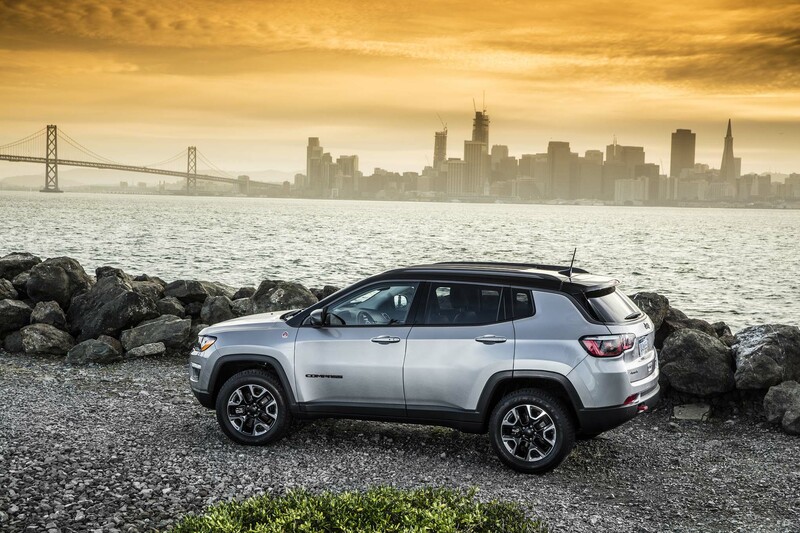 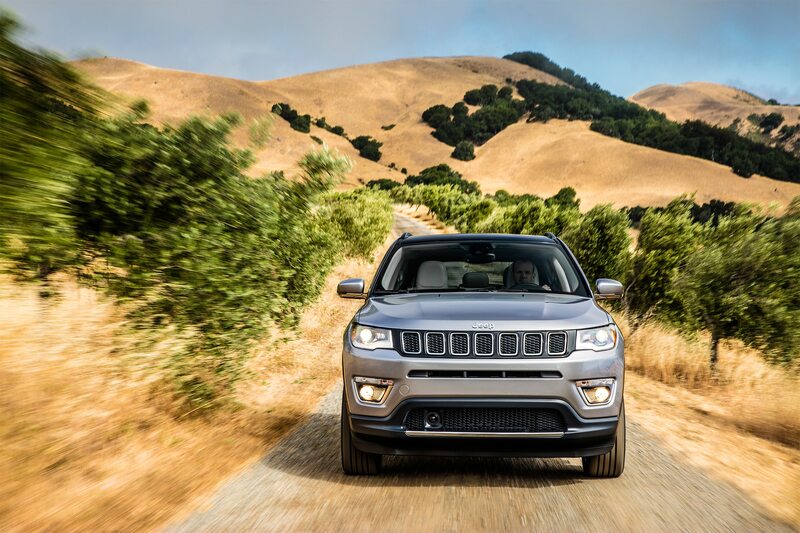 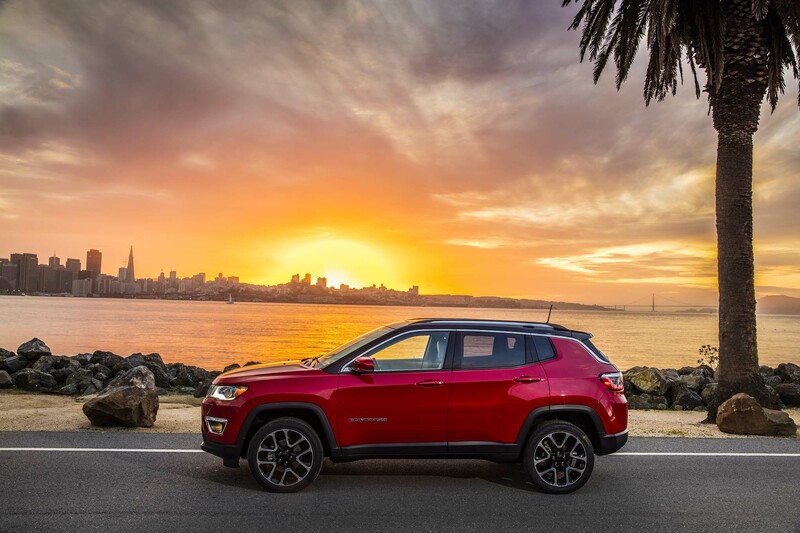 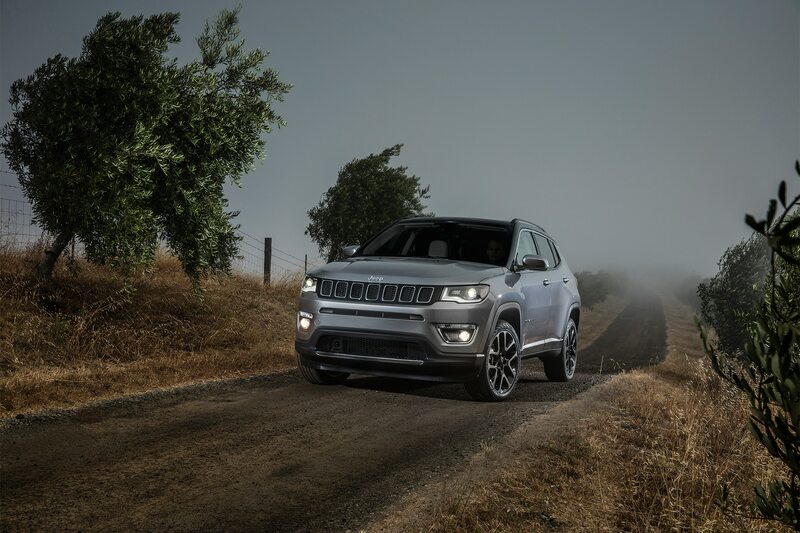 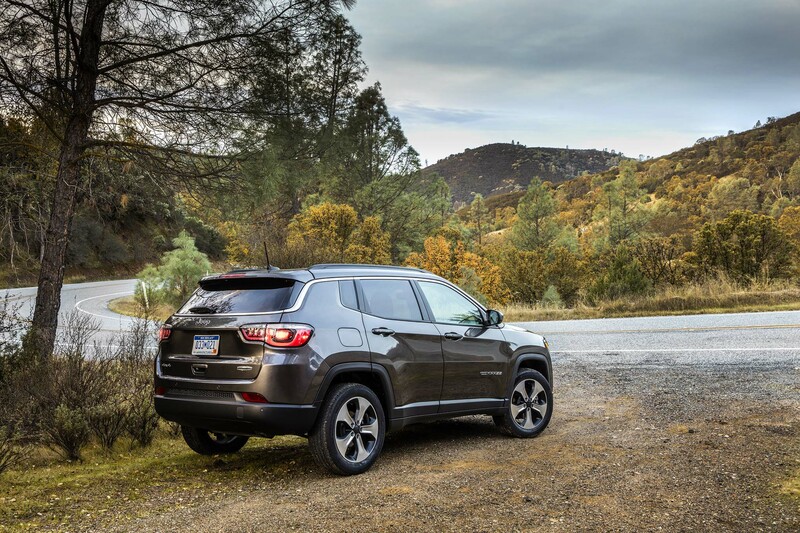 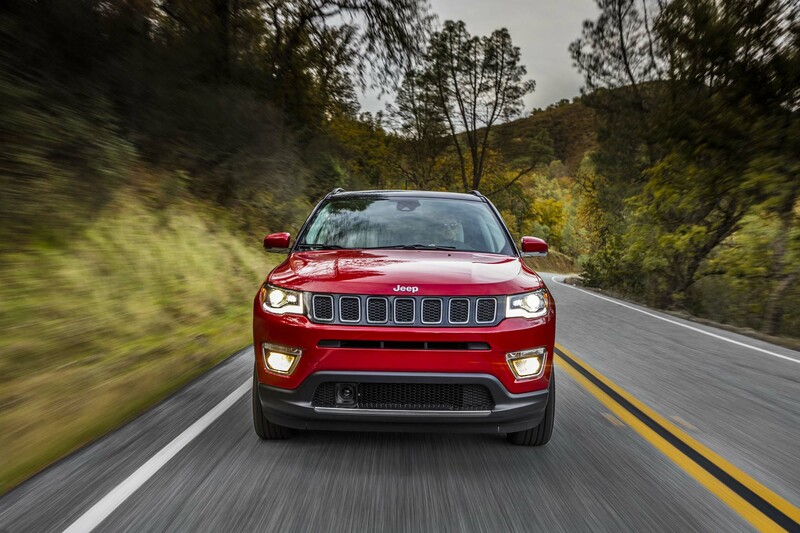 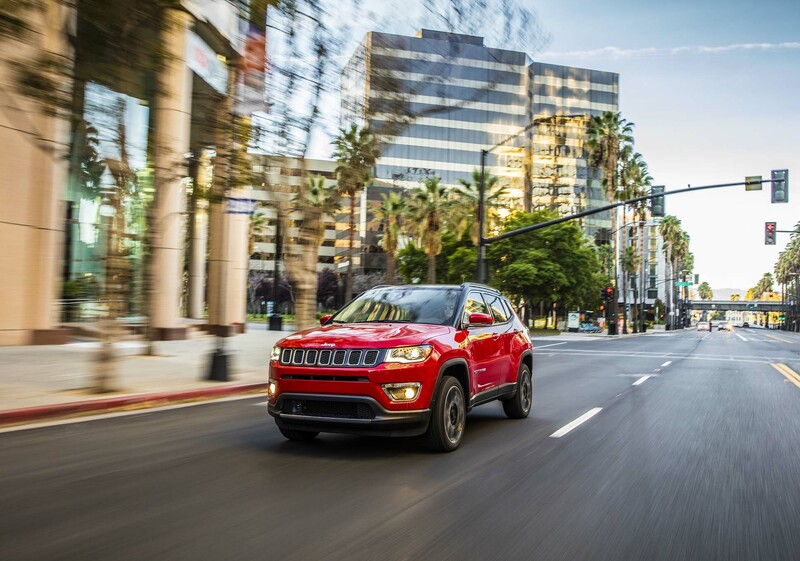 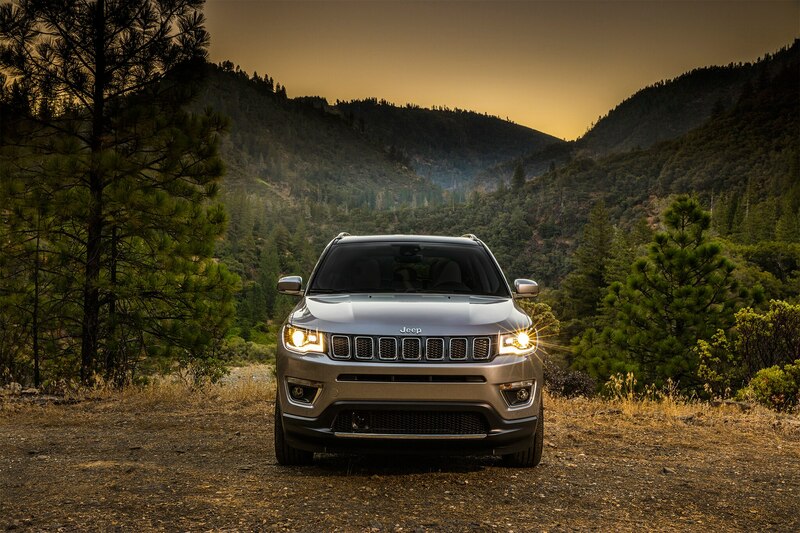 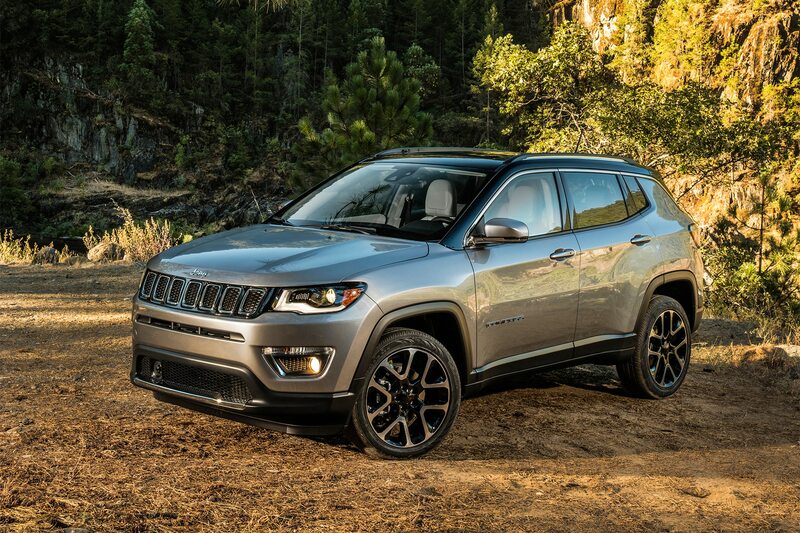 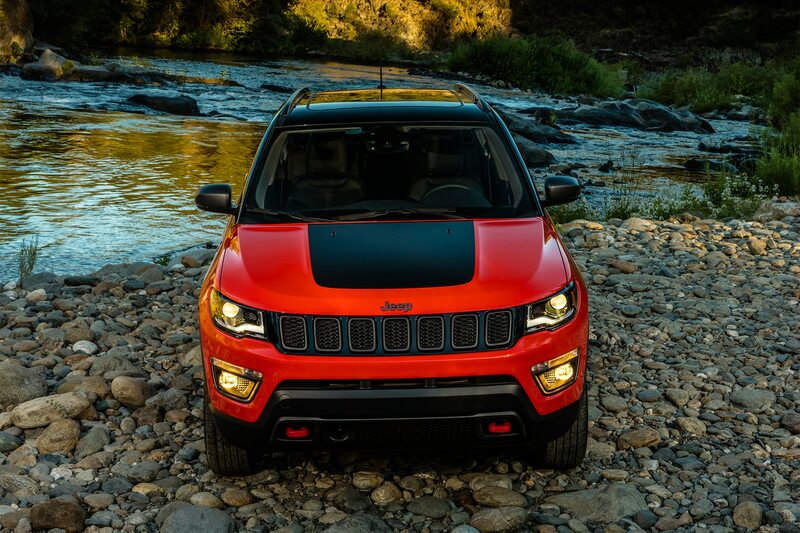 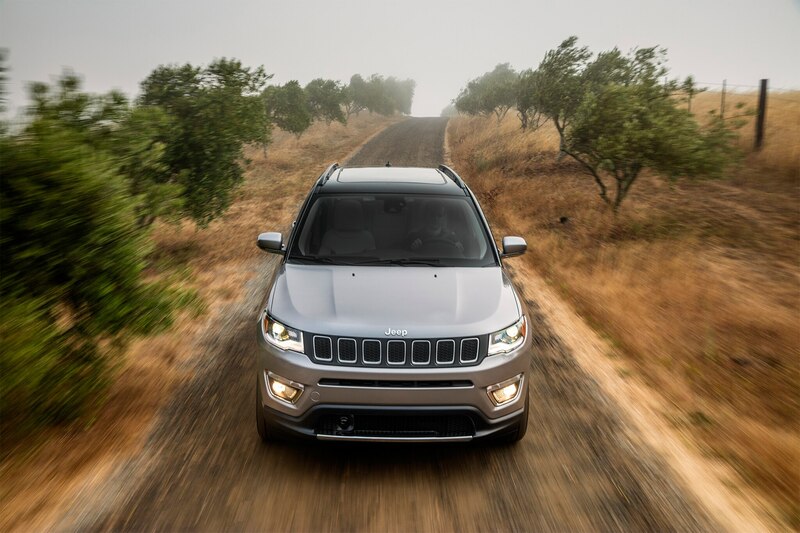 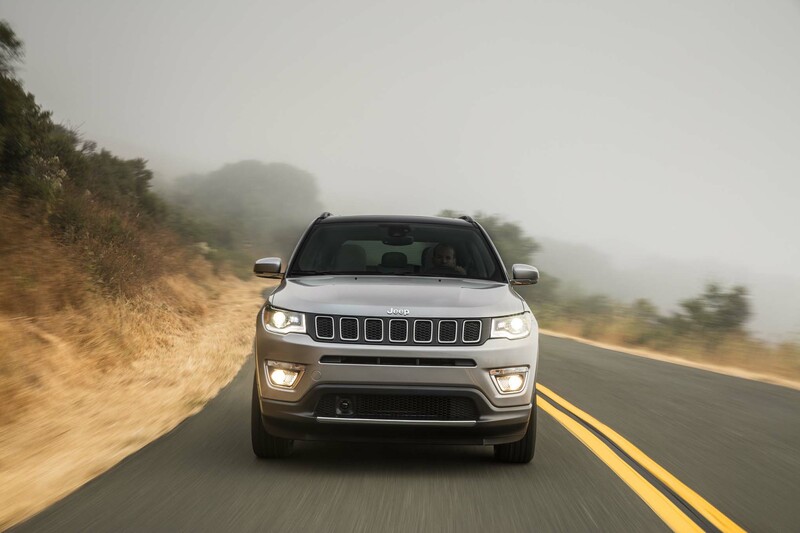 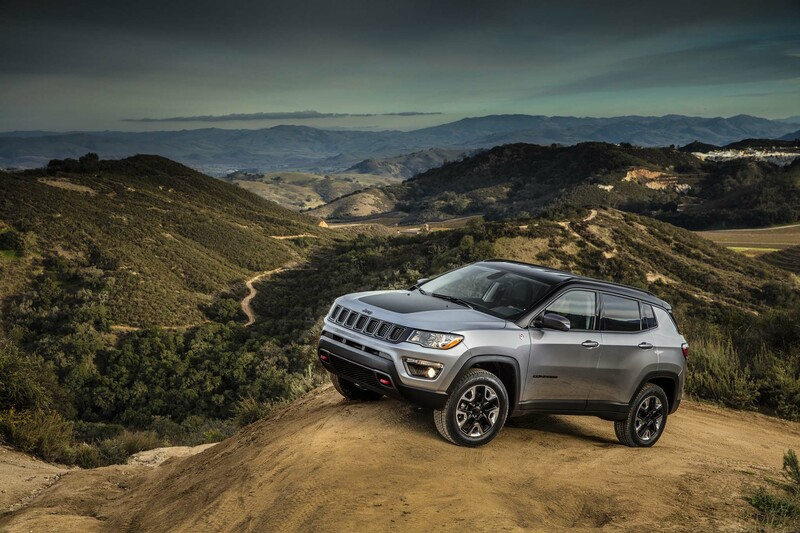 The exterior has been thoroughly touched to give the Compass a dramatic roofline and muscular fenders, at least according to Jeep. 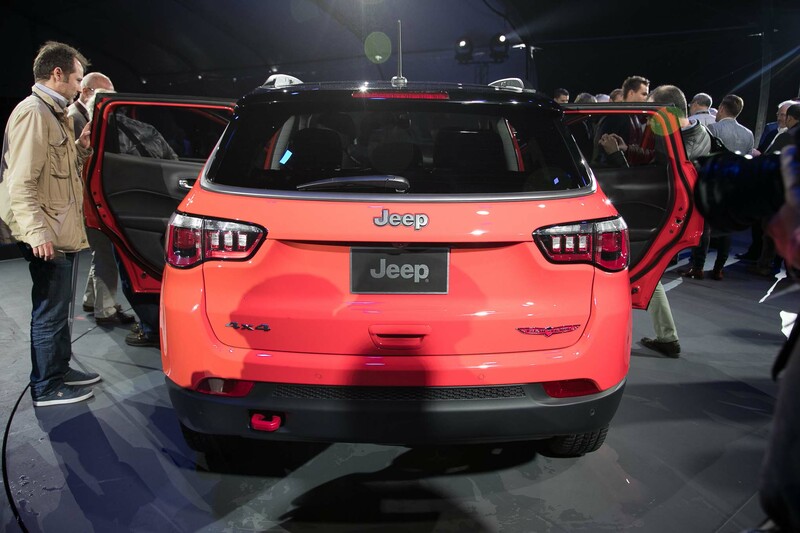 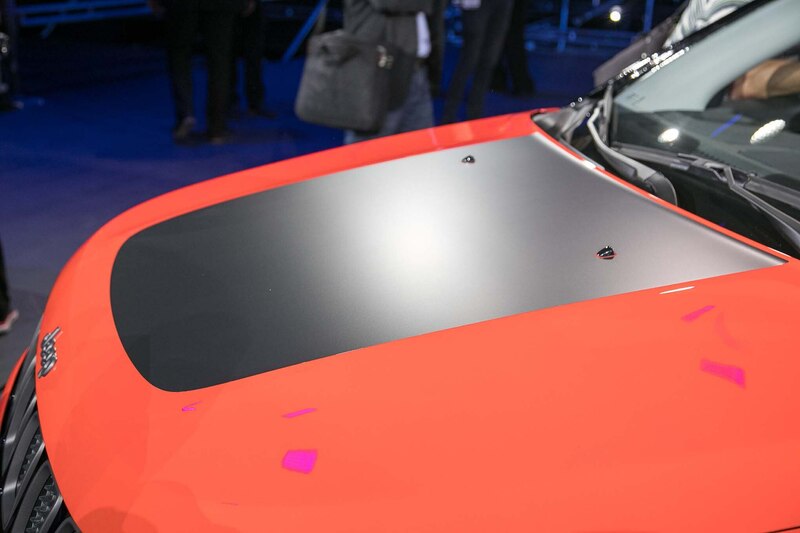 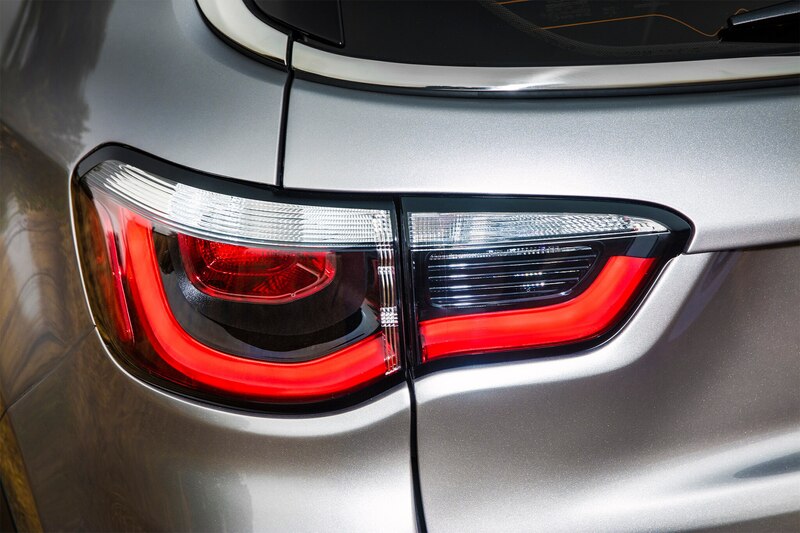 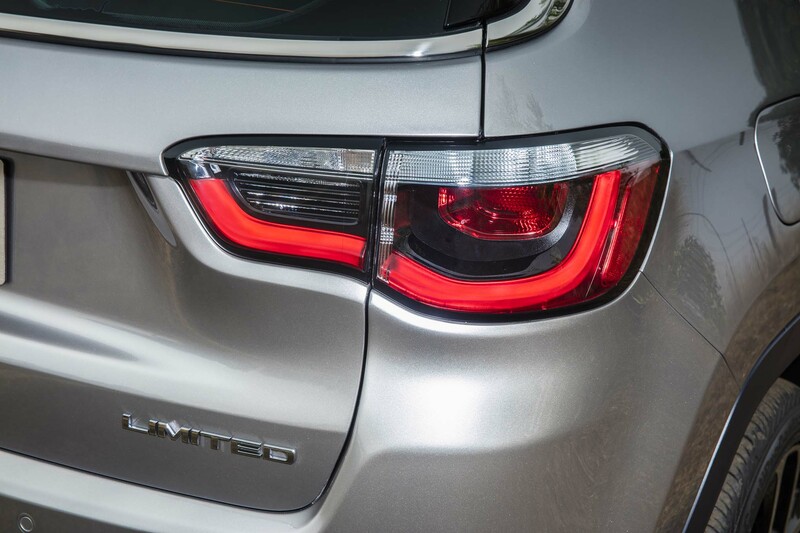 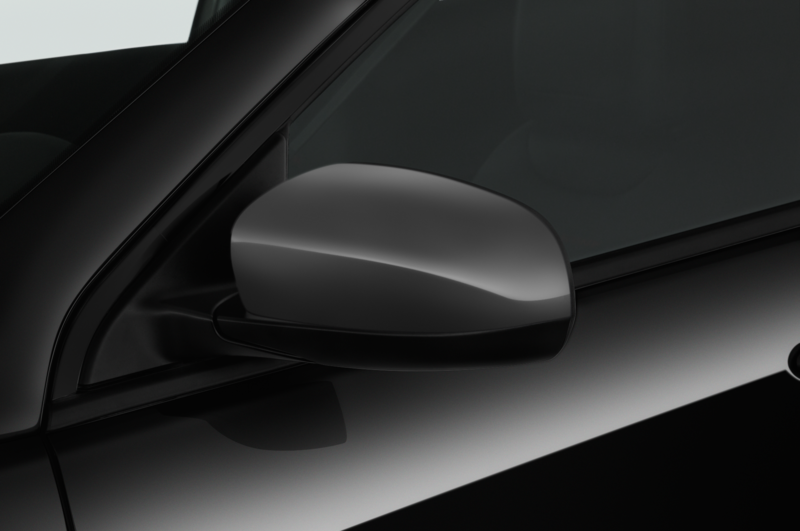 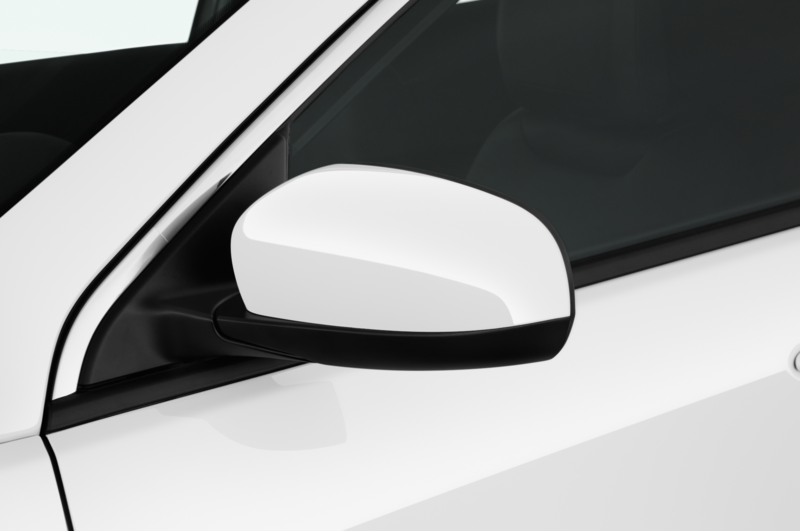 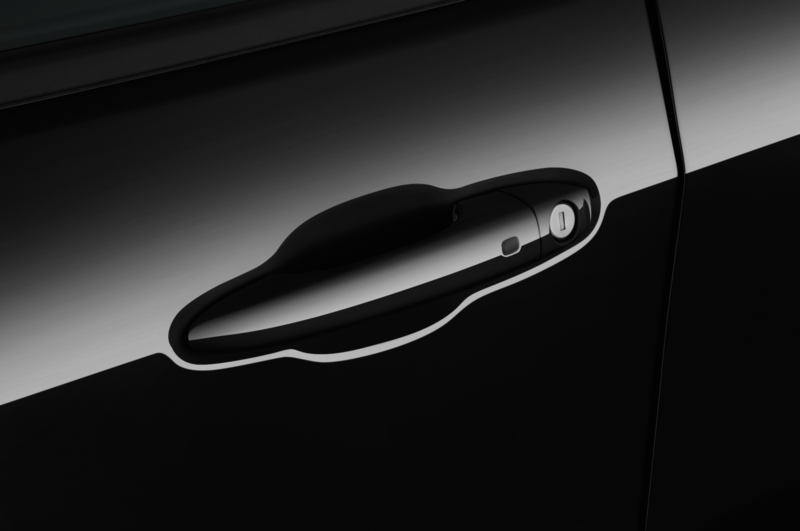 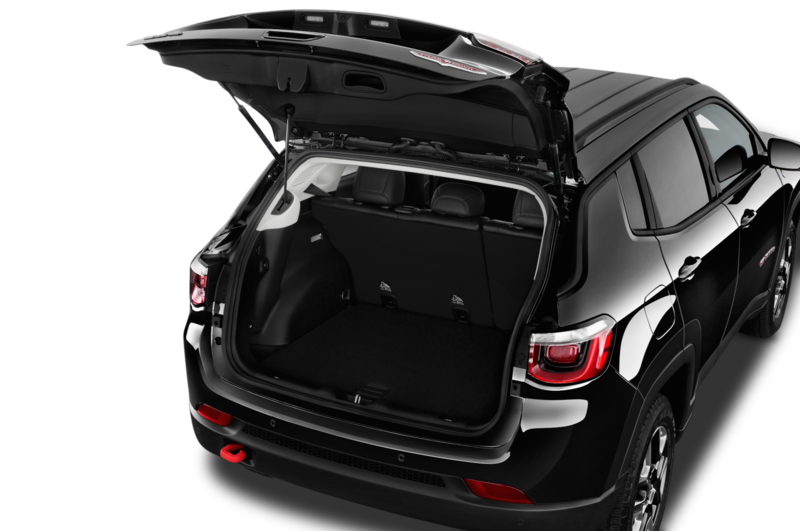 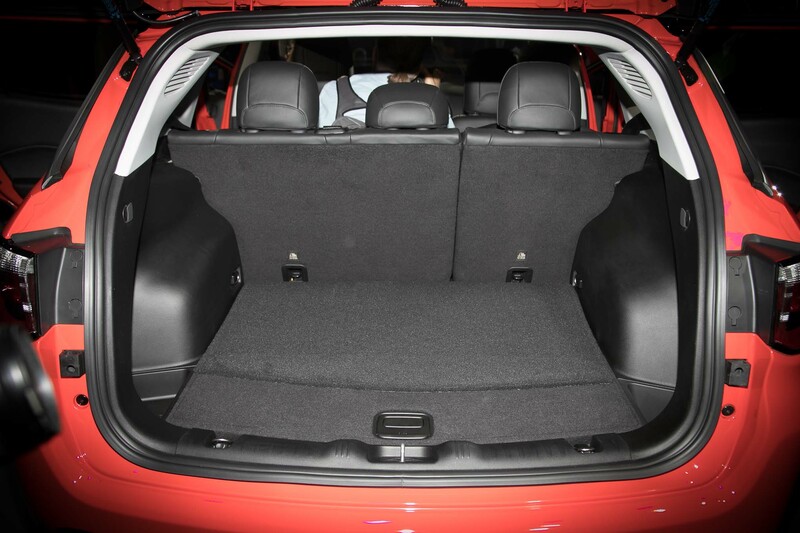 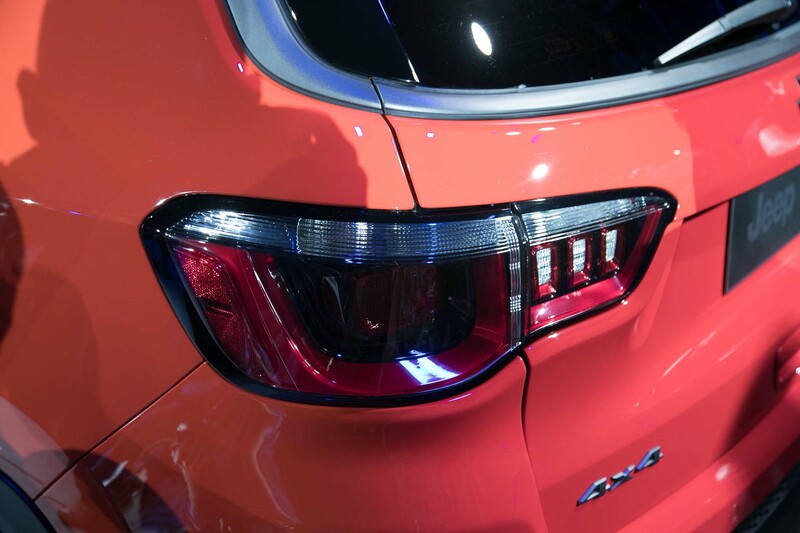 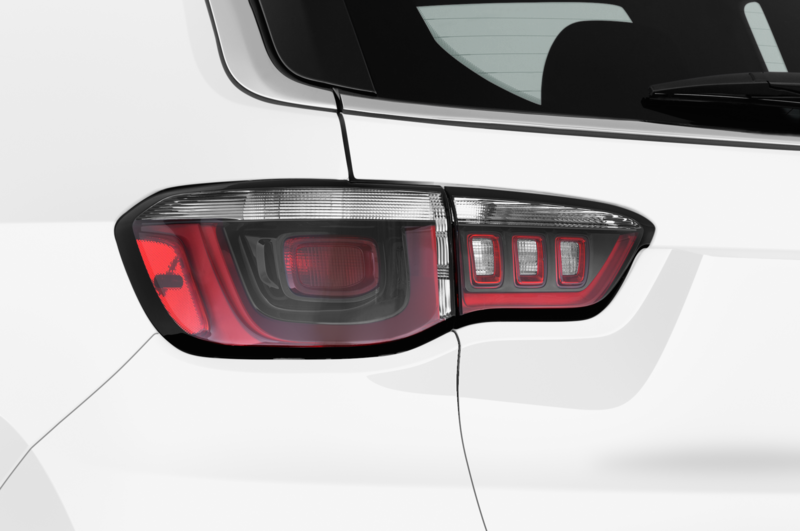 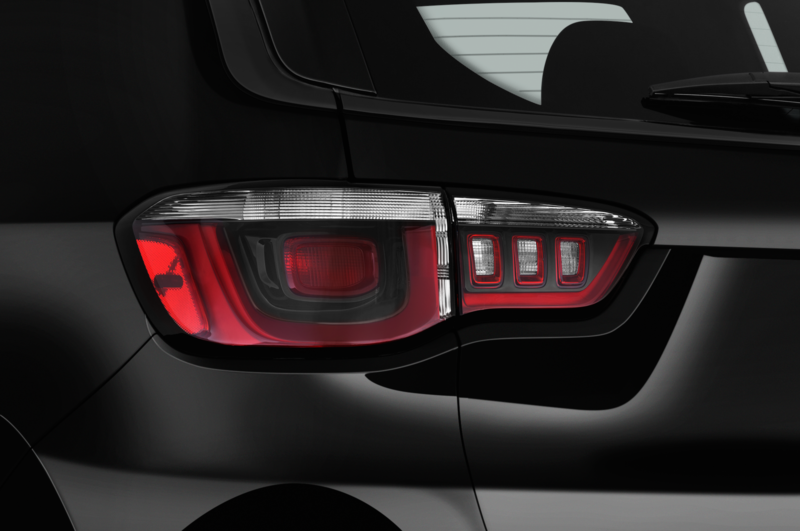 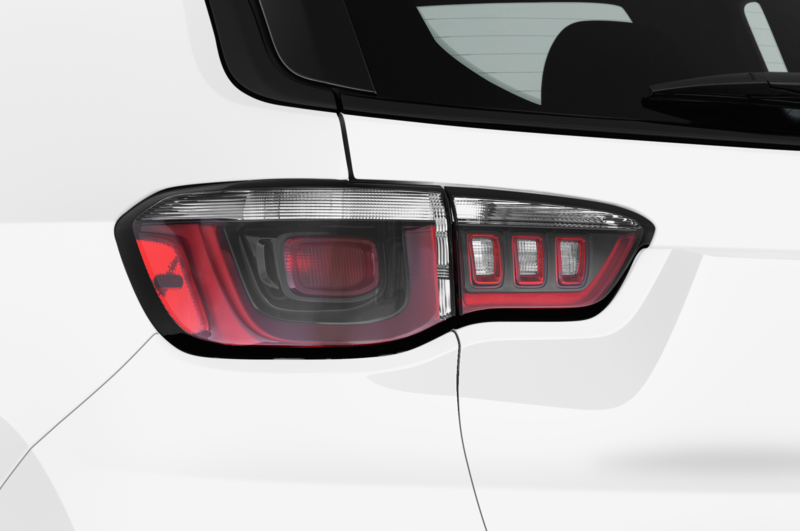 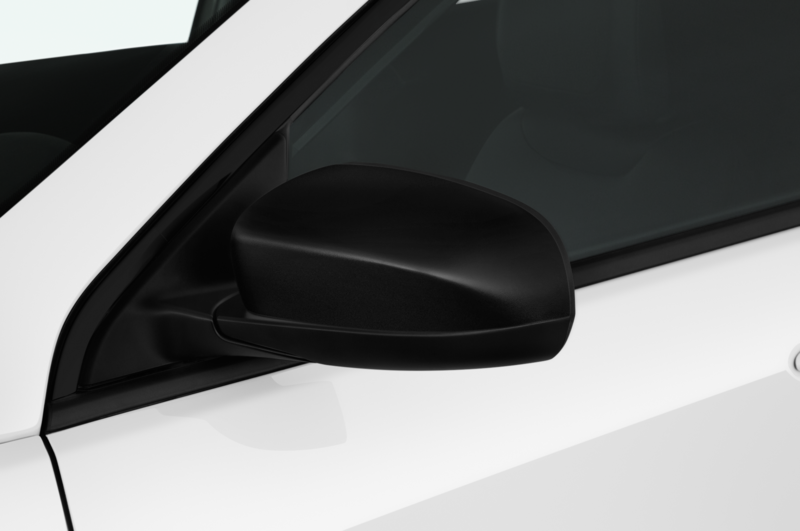 It also has LED tail lamps, and an available dual-pane sunroof. 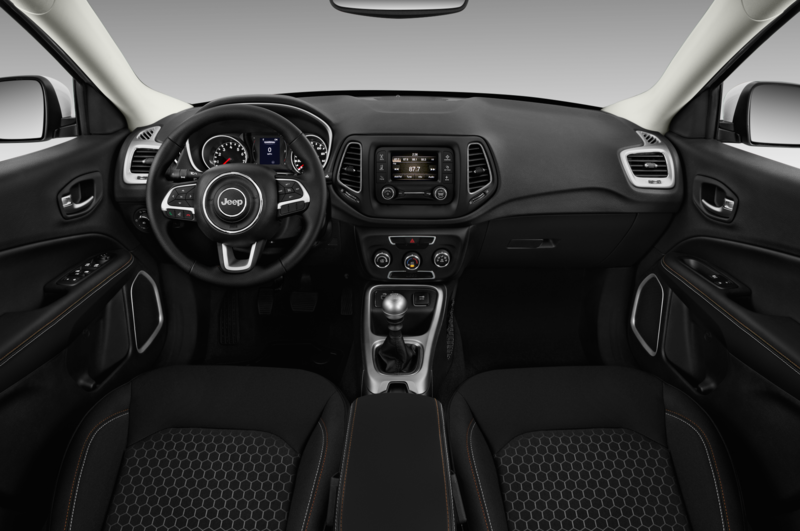 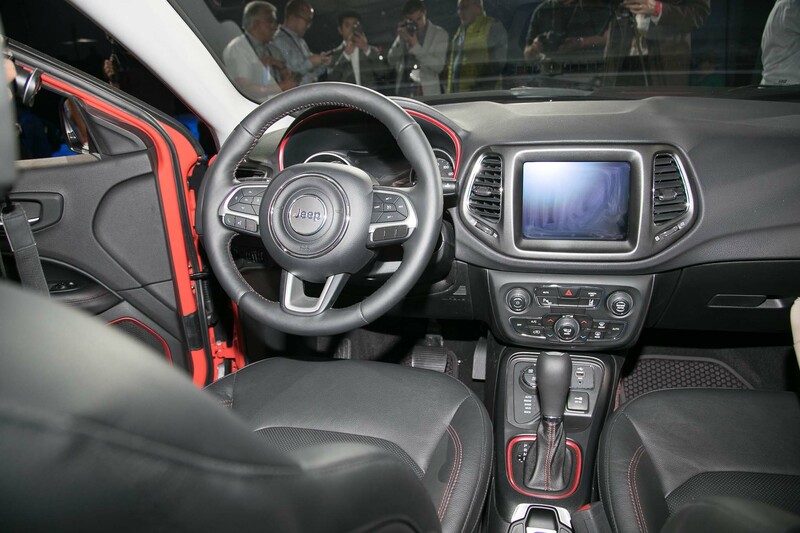 The interior the Compass, however, appears to be carried over entirely from the Renegade, featuring the same cockpit layout and materials. 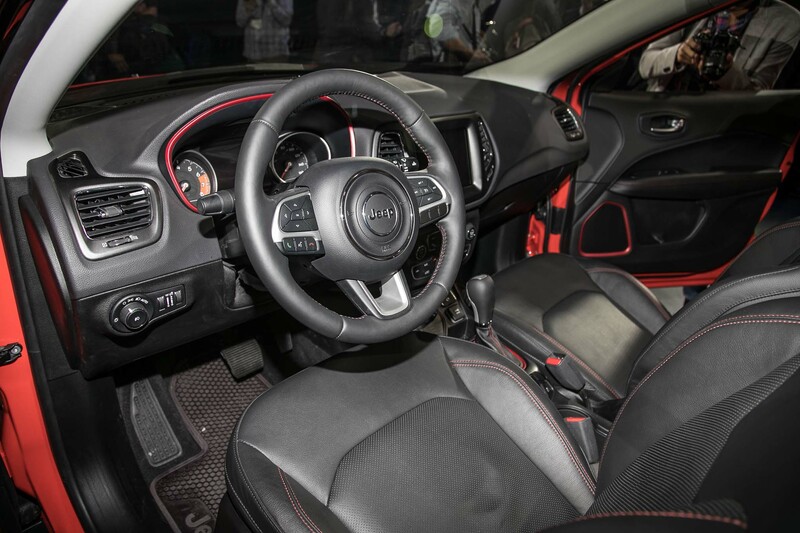 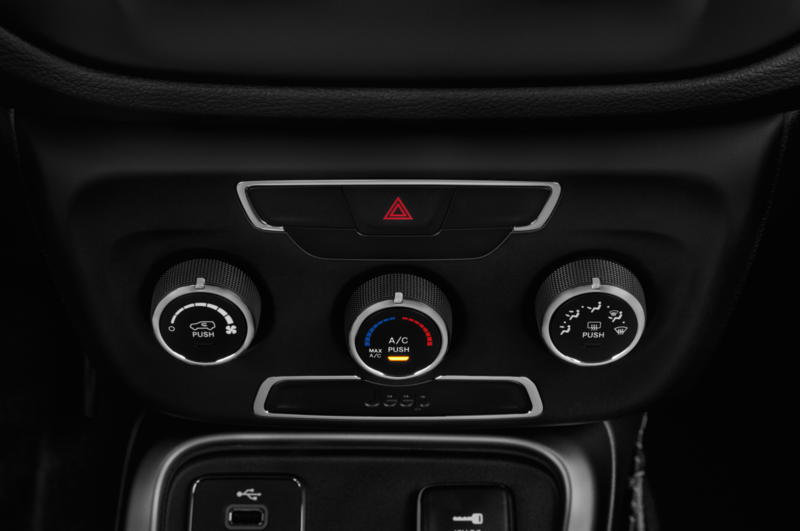 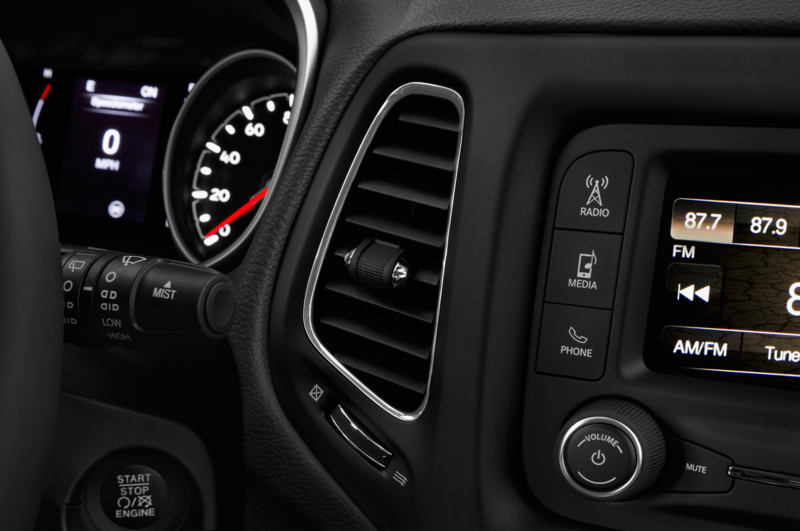 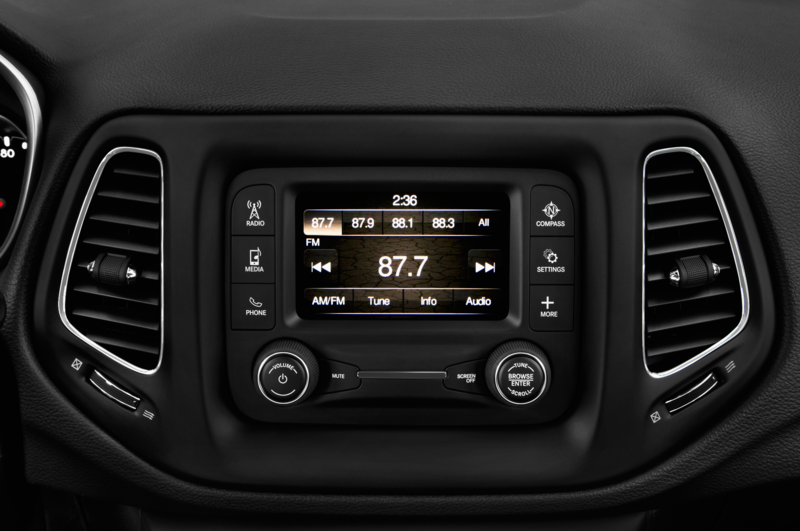 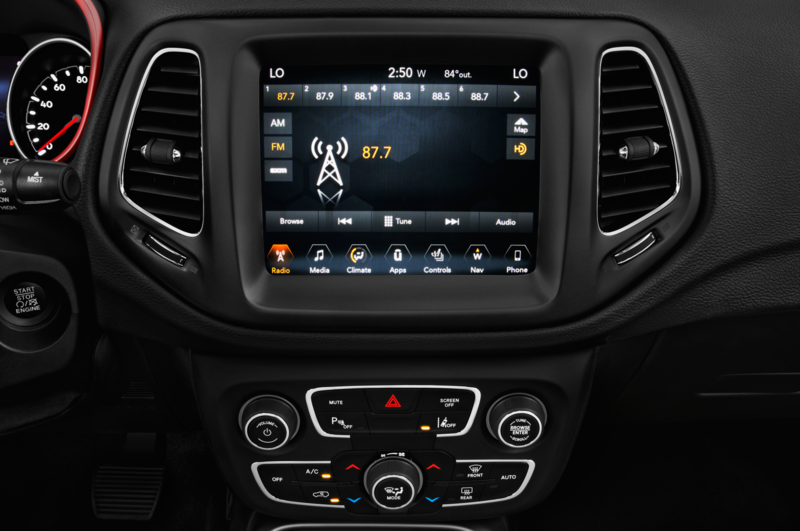 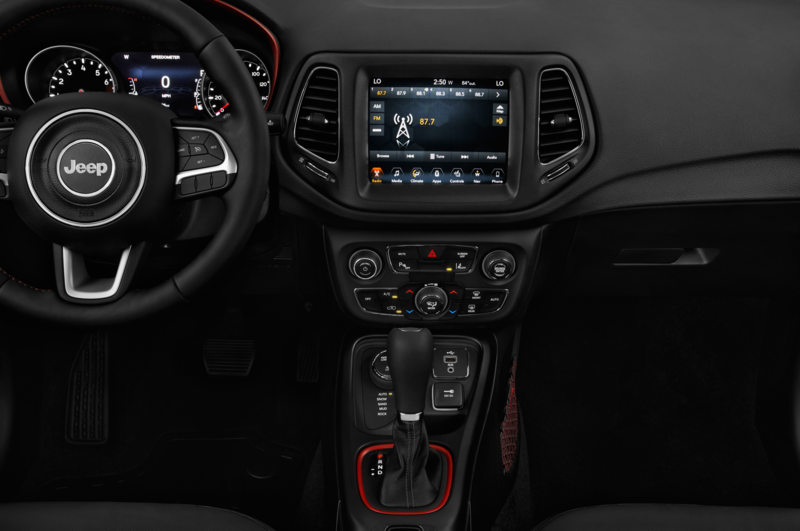 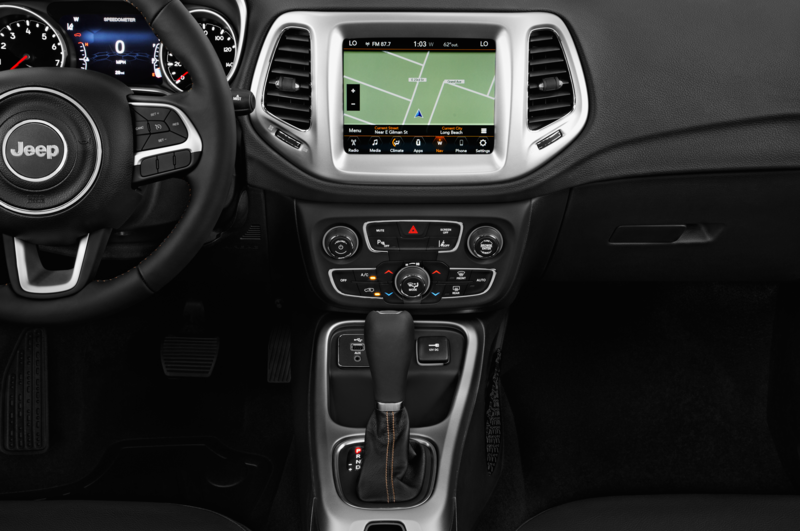 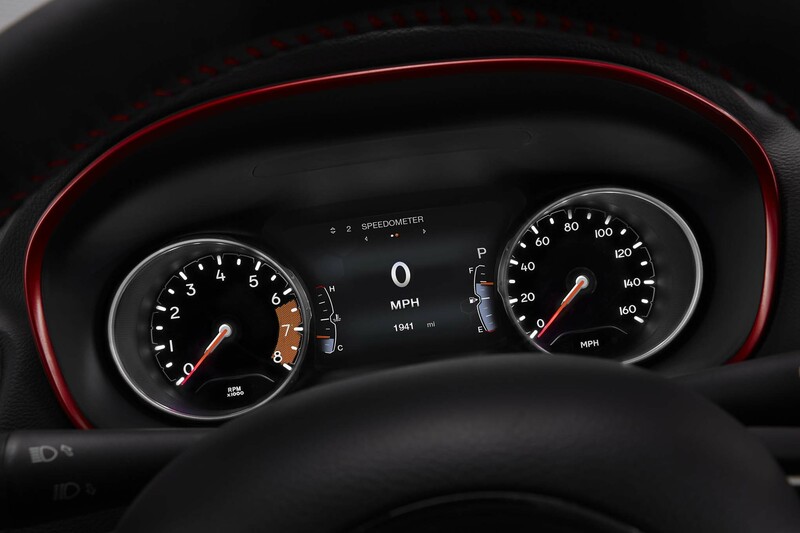 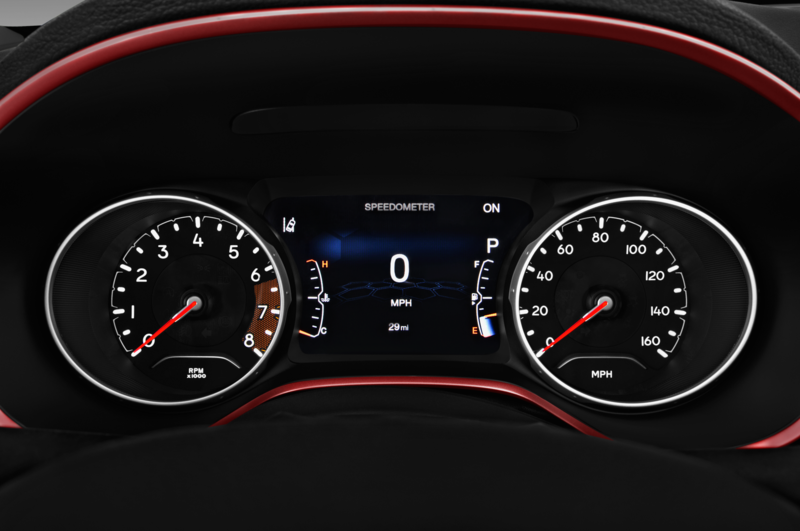 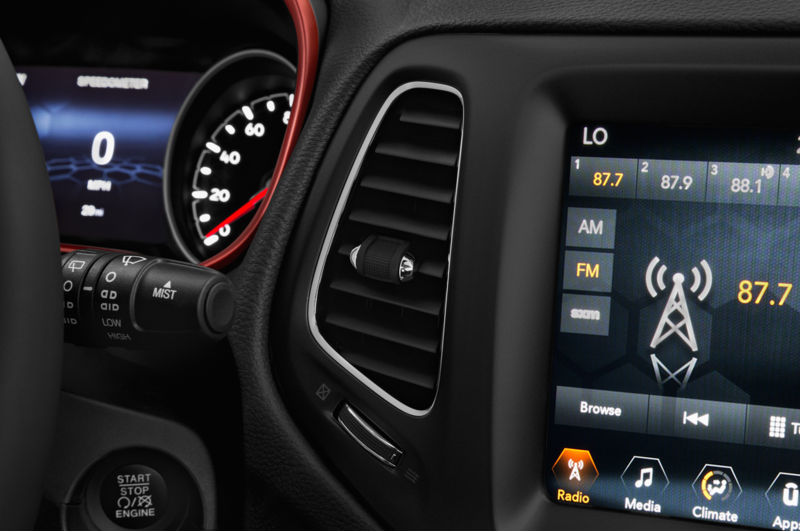 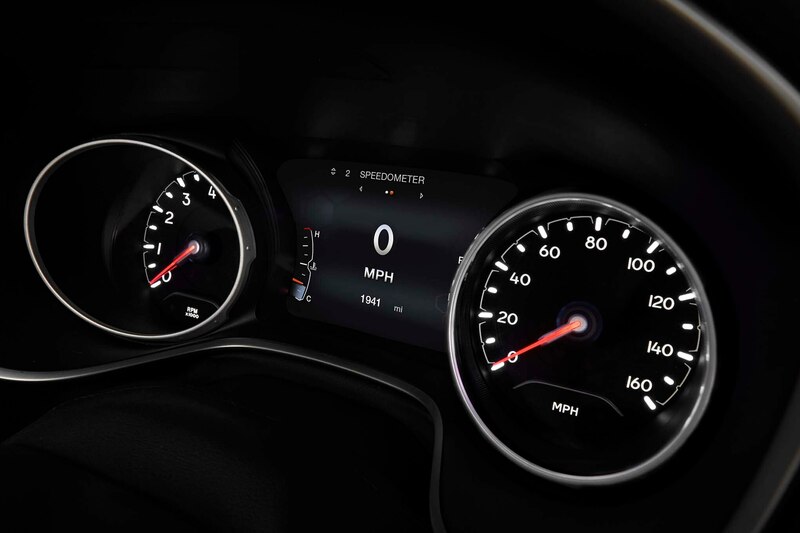 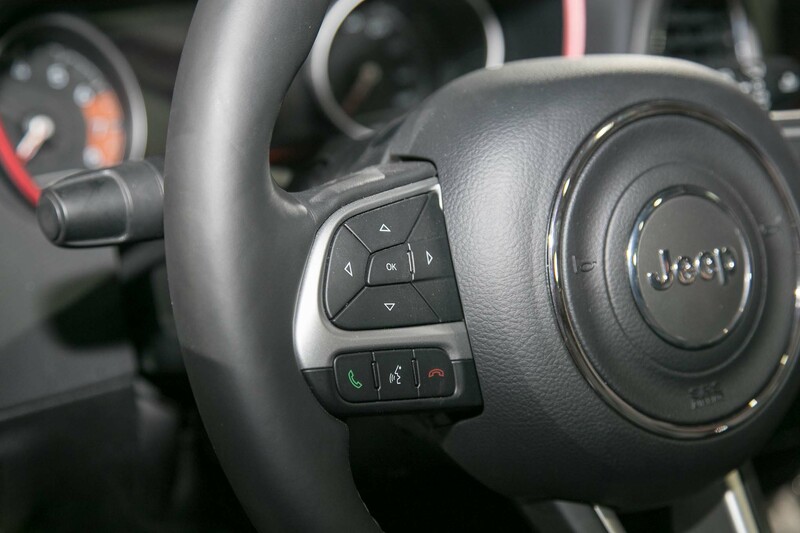 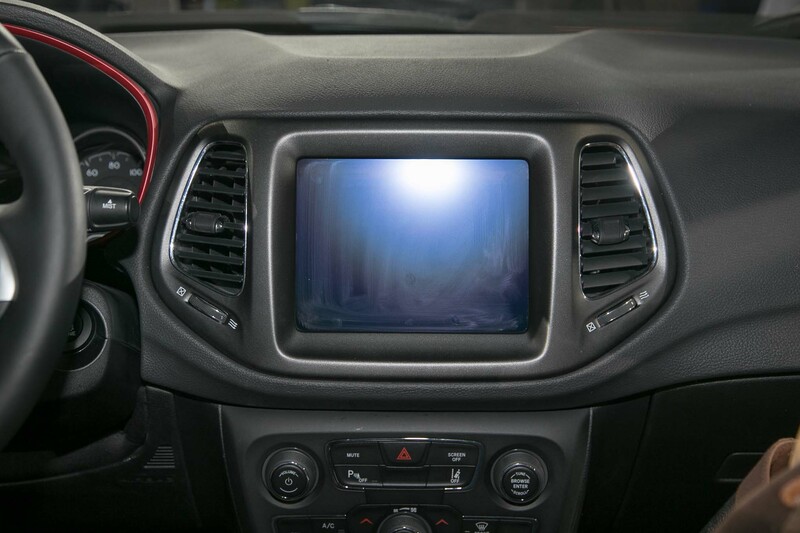 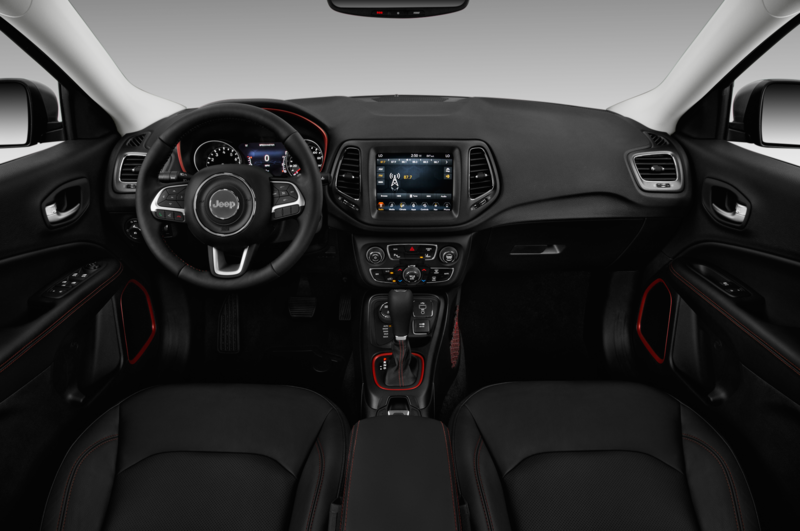 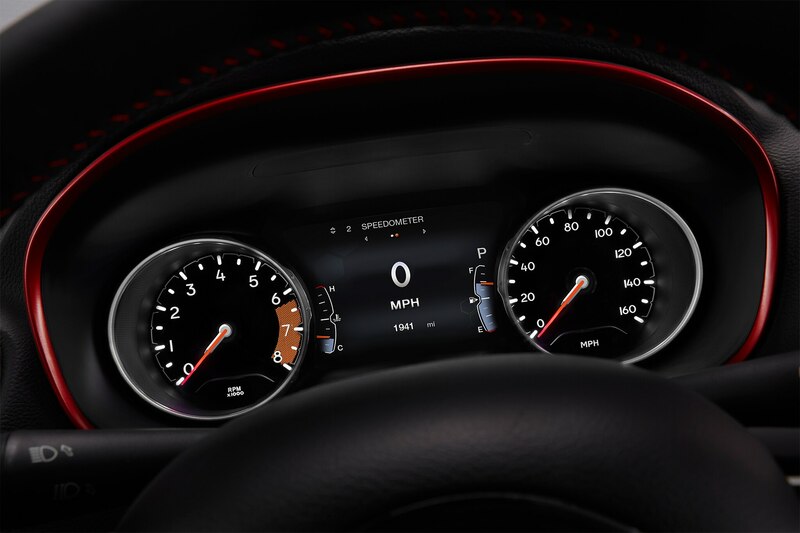 It will be offered with Chrysler’s most advanced UConnect system, which includes Apple CarPlay and Android Auto, among other available apps.